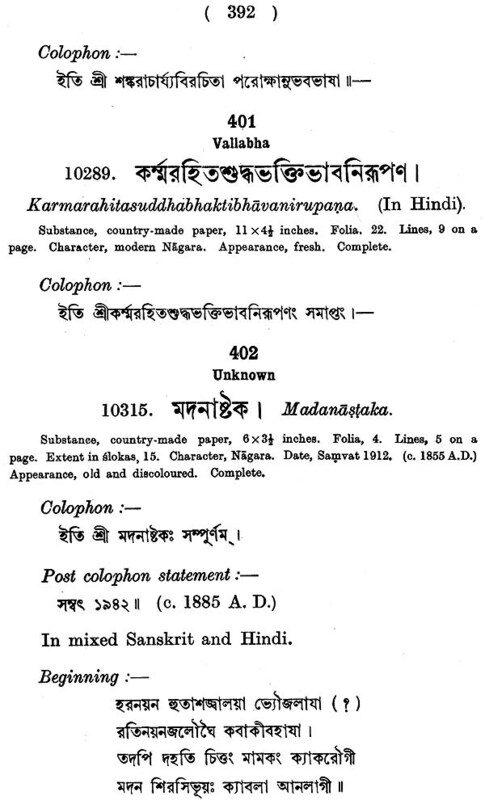 Mahamahopadhyaya Haraprasad Sastri’s Descriptive Catalogue, volume I, was published in 1917. It is not just a catalogue. It is a classic work, in which one would find a brilliant account of the Buddhist manuscripts preserved in the Asiatic Society. Each of the Manuscripts has been studied by Haraprasad Sastri with admirable attention and care. It is easy for the investigator to have a fair idea of the manuscript which he wants to study. This brilliant work was long out of print. 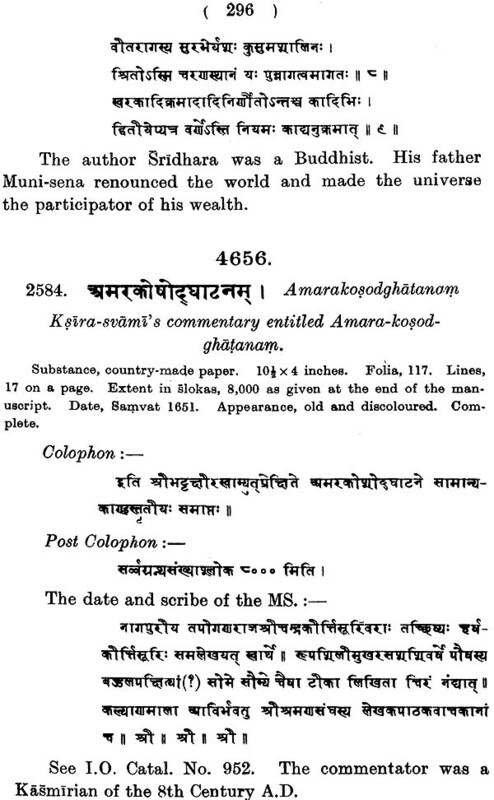 The Asiatic society now reprints it, and hopes that it would be helpful to all scholars devoted to Buddhist studies. 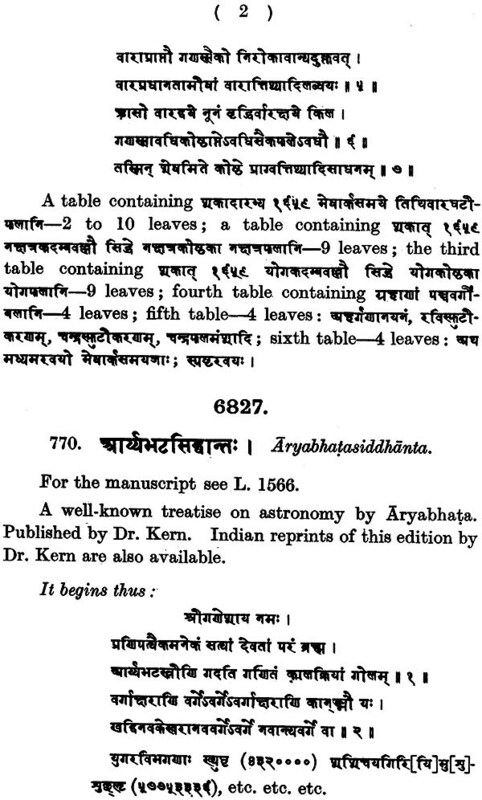 This is the first of a long series of volumes of a descriptive catalogue of Sanskrit manuscripts, belonging to the Government collection in the Asiatic Society's Rooms, collected since the institution of the Search of Sanskrit Manuscripts under the order of Lord Lawrence's Government in 1868. The number of the collection stands at present at 11,264; of these 3,156 were collected by my illustrious predecessor Raja Rajendralal Mitra, LL.D., C.I.E., and the rest by my humble self. 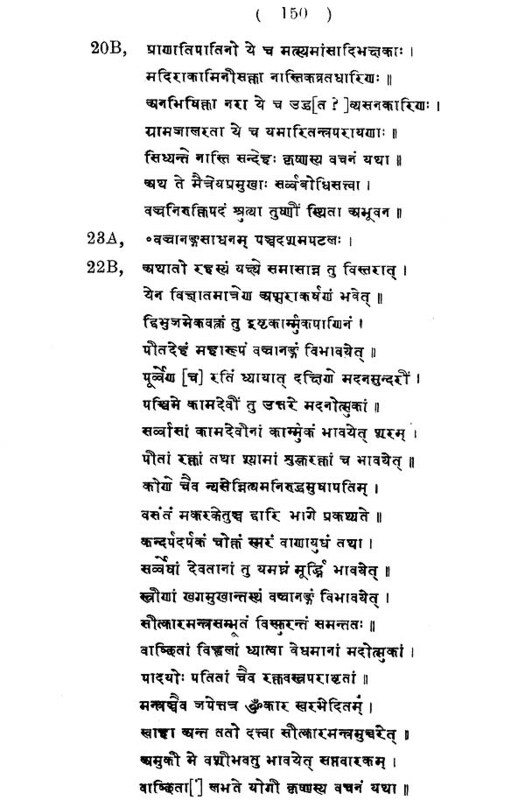 Besides Sanskrit, it has manuscripts in Prakrt, Hindi, Marwari, Marhatti, Newari and Bengali, But these form an insignificant part of the whole. The works relate to orthodox Hinduism.. Buddhism of various yanas, Jainism of various schools, Vaisnavism, Saivaism, Trantrism and other systems of sectarian Hinduism. The various branches of the knowledge of the Hindus are well represented in this collection. 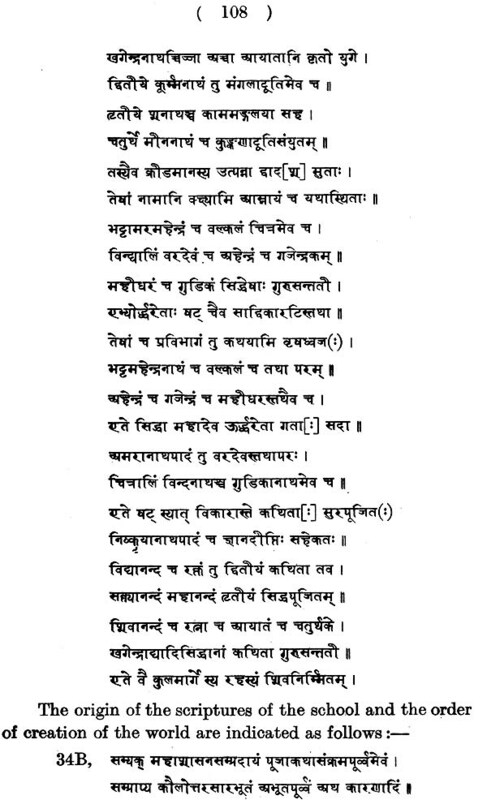 Manuscripts are written in various scripts, Bengali, Devanagari, Udiya, Marwari, Kasmiri Newari - both ancient and modern. Some of the ancient manuscripts go so far back as the 9th century A.D. 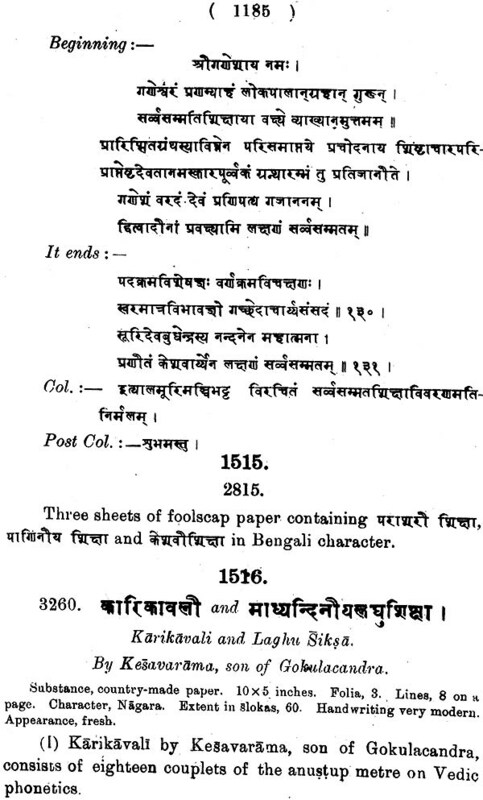 There is one unique manuscript in ancient Bengali hand, copied undoubtedly in the last years of the 10th century. '1'here are numerous manuscripts, dated in the 11th century. The subsequent centuries are very well represented. They are written on various materials-paper, palm leaf, birch-bark, and barks of other trees. 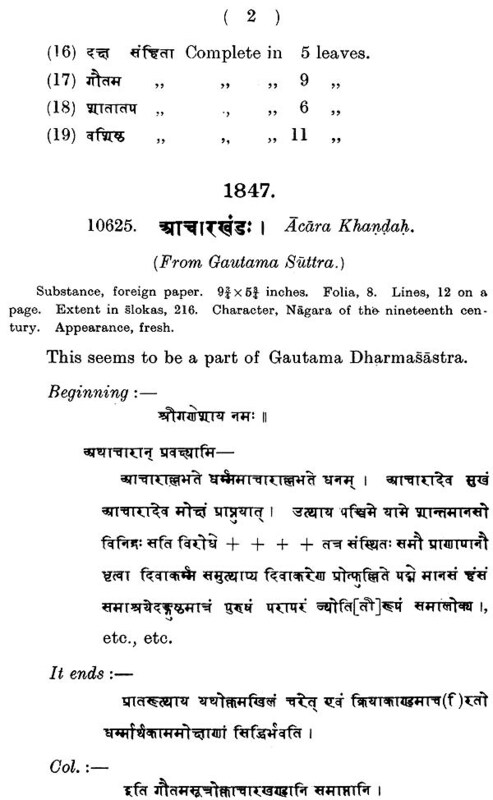 Some of the paper manuscripts go centuries back to the time of the introduction of Mahommedan paper in India. Besides unique manuscripts which open up vast vistas of research in history, religion and sciences of ancient India, whole literatures are revealed in this collection. For instance, there are numerous works of Vajrayana, Mantrayana, Kalacakrayana to be found here, which throw a flood of light on those later phases of Buddhism which developed out of the Mahayana system. But for these works, those phases of the religion would have remained only a name . A large number of works of the Pascimamngya System of the Tantra are to be found here. 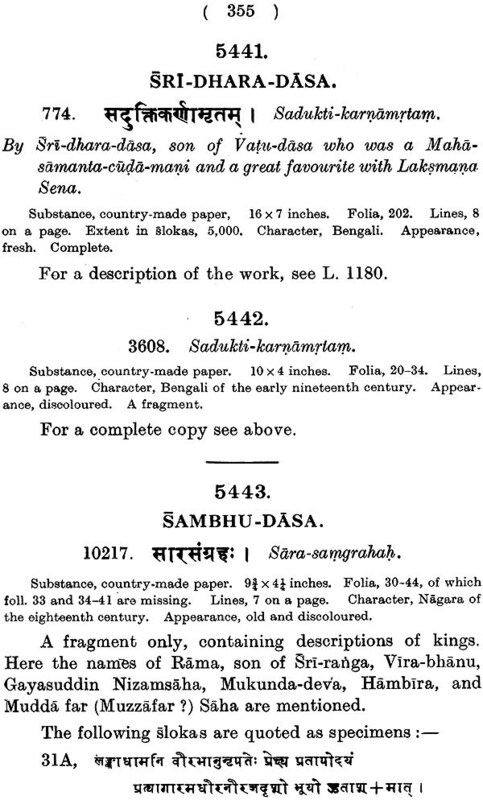 These Literatures and these unique works will be described in their proper places. The present volume contains the descriptions of 11th Buddhist works of the northern school. The ancient works among these were translated into Chinese, and the mediaeval works into Tibetan Some of the Sanskrit originals of these translations have been, for the first time, brought to light in this collection. The few modern works of Buddhism in the collection are unique, showing that the religion lingered long in north-eastern India, and is still lingering in some quarters. In the mediaeval and modern works is to be found the condition of Buddhism in India, after the Chinese ceased to visit the country. The special feature of this volume of the catalogue is that an attempt has been made in it to arrange the works in chronological order. 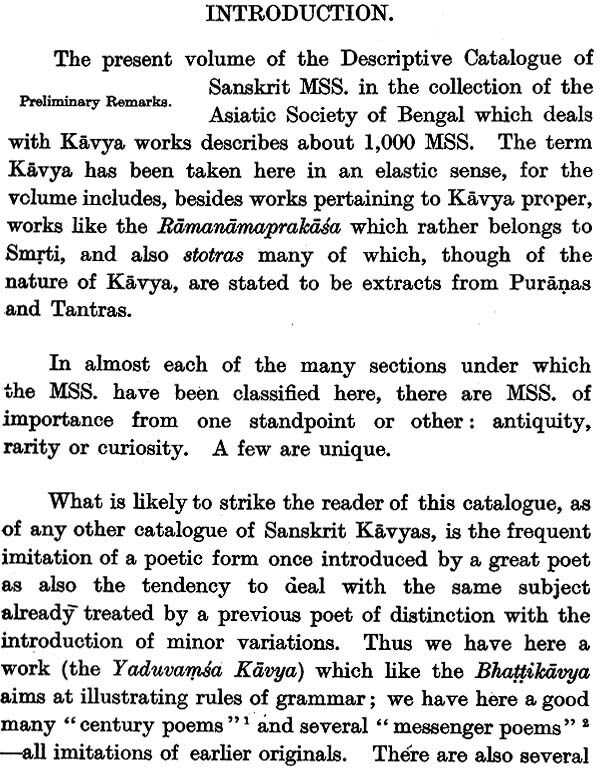 No cataloguist of Sanskrit MSS. has, as yet, made the attempt. The difficulties of such an arrangement are very great indeed; and the only sure guide is the quotations. When one book quotes from another, or cites it as an authority, that work is sure to be subsequent in age to that cited. But this helps only in the ascertainment of the succession of works. If the date of any work is ascertained from other evidences, the dates of previous and subsequent works are approximately fixed. In the case of Buddhist works the dates of translations of some works are known from Chinese and Tibetan sources. That gives a clue to the dates of other works too. It is known from Chinese sources that Asvaghosa was the Guru of Kaniska who, in the opinion of prominent Orientalists founded the Saka era. 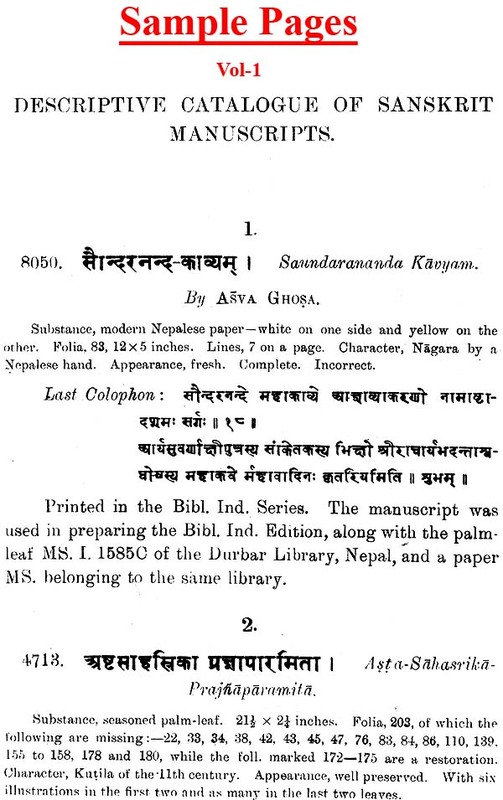 The first work in this catalogue, Saundarananda Kavya, is by Asvaghosa. Therefore its date is known. 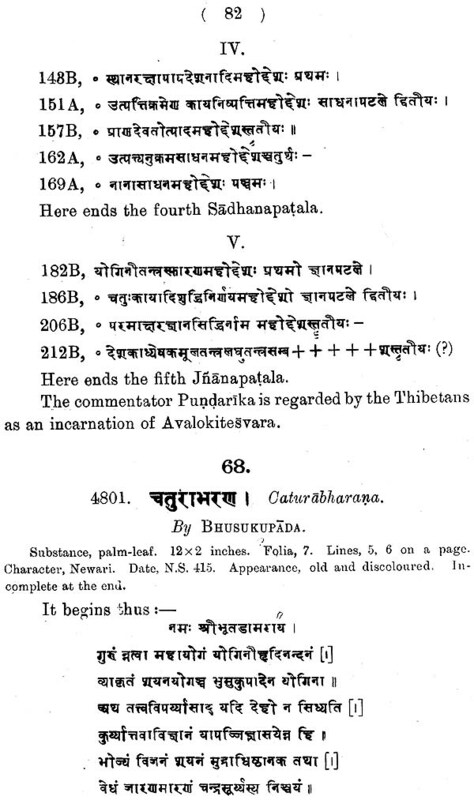 Nagarjuna flourished in the second generation after Asvaghosa and he is said to have recovered the Prajnaparamita (Astasahasrika) from the nether world. 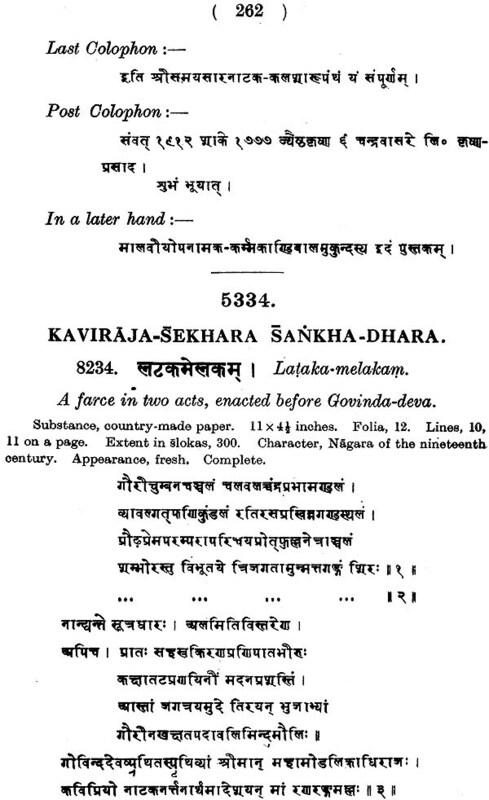 The Pancavinsati-sahasrika was a modification of the Astasahasrika, according to the doctrines of Maittreyanatha's Karikae known as Abhisamayalamkara karikas. The Pancavinsatika, again, was translated into Chinese between the years 265 A.D. and 316 A.D. 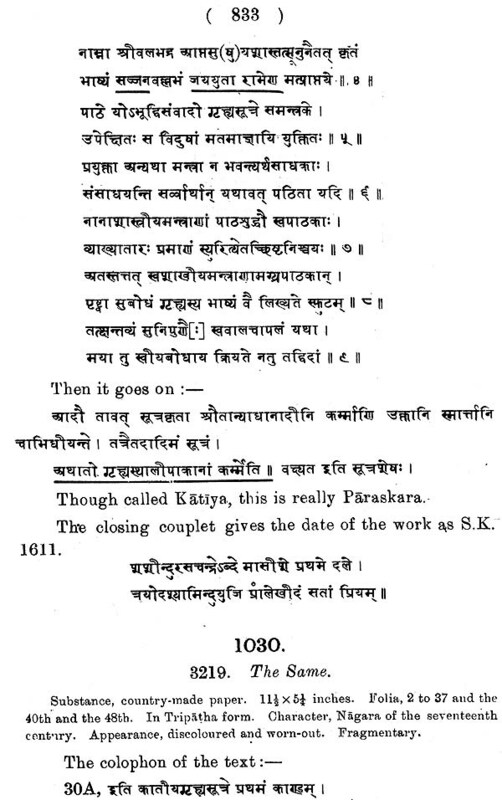 SO the Karikas and the Pancavinsatika must necessarily come between Nagarjuna and the date of the translation. Arguing in this way, an attempt has been made to find the chronological order of the works. As the grounds in each case have been either set forth or indicated in the description of every work, they need not be repeated here in the preface. 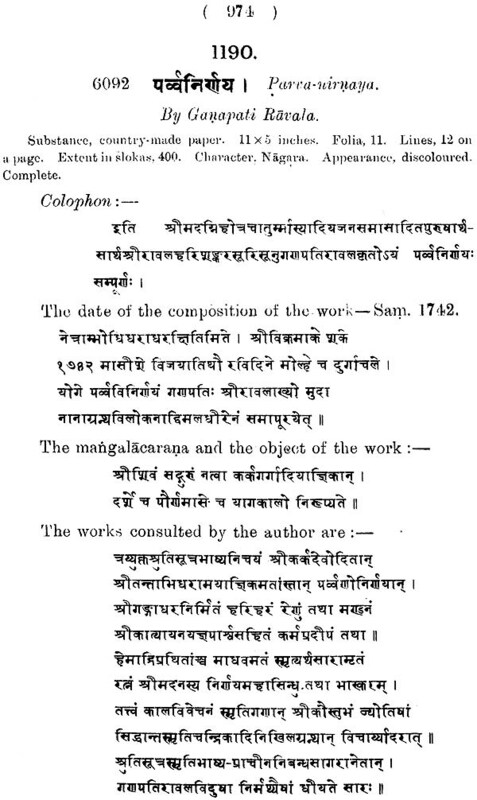 Eggeling's catalogue of manuscripts in the India Office has been accepted as model in this catalogue. But he has never described a Buddhist work. The only good Buddhist catalogues in English are the Cambridge Catalogue by Prof. Bendall, and the Nepalese Buddhist Literature by Raja Rajendralala Mitra. Pro£. Bendall has also described a few Buddhist works in his catalogue of MSS. in the Bodelian Library. 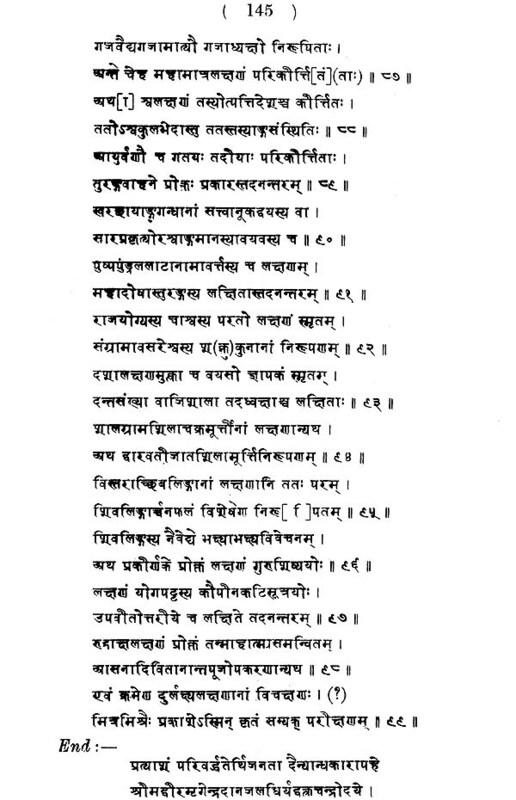 I have also described some in my Nepal catalogues I and n. I have not unnecessarily duplicated the description of any work fully described in these catalogues, contenting myself simply with references. But when, as in the mediaeval and modern periods, they could give me no guidance, I. have arranged my quotations and colophons in such a way as to give a fair idea of what the books contain. In describing these manuscripts, I had always an eye to the needs of the Iconographist, and have tried to quote in full the descriptions of the gods and goddesses, as given in their dhyanas or sadhanas, or formulas of meditation. THE second volume of the Descriptive Catalogue of Sanskrit Manuscripts, in the Government collection at the Asiatic Society's rooms, is now presented to the public. It contains descriptions of manuscripts from Nos. 120 to B45A, and treats only of the Vedas, Vedic rituals and Vedic speculations. 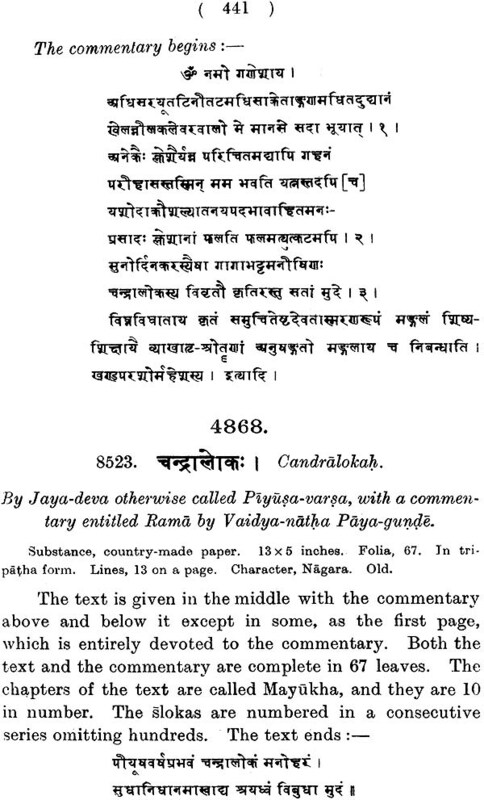 Sayana says that the other Vedas re dependent on the Rg- Veda and therefore that Veda I treated of first of all in the present Catalogue. 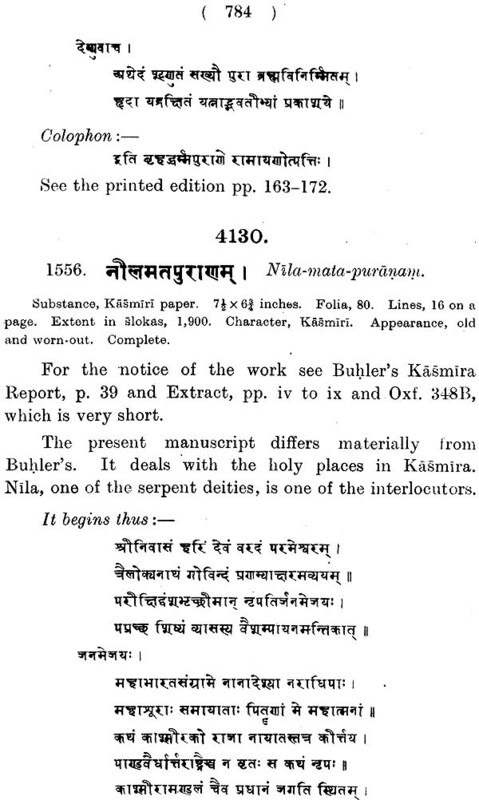 Max Muller gives a list of manuscripts consulted by him in his famous edition of the Rg- Veda but not a single manuscript of his goes beyond the seventeenth century. But in this collection there is a fragment dated 1362 A.D. and some manuscripts belonging undoubtedly to the fifteenth and sixteenth centuries. 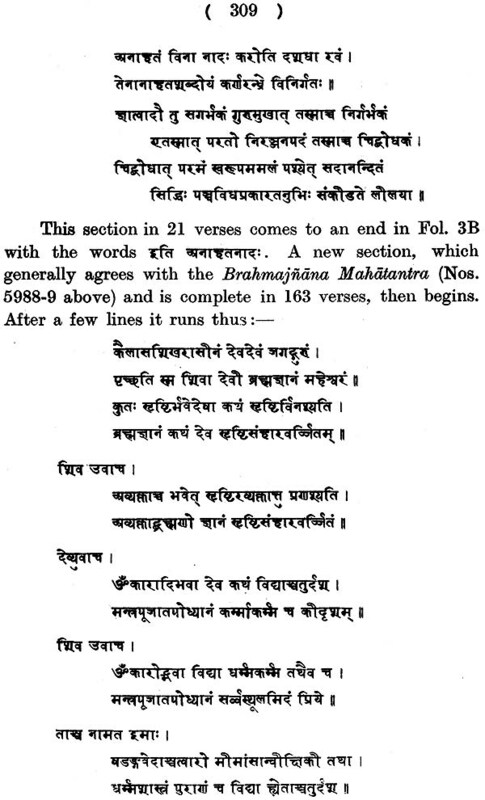 It would not be out of place to mention here that the Vedas were committed to writing in very recent times; Al Beruni says "not long before my time," by Vasukra in Kasmir. The fragment of 362 A.D. (No. 140, XIV) is therefore of unique importance. Evidence is afforded in No. 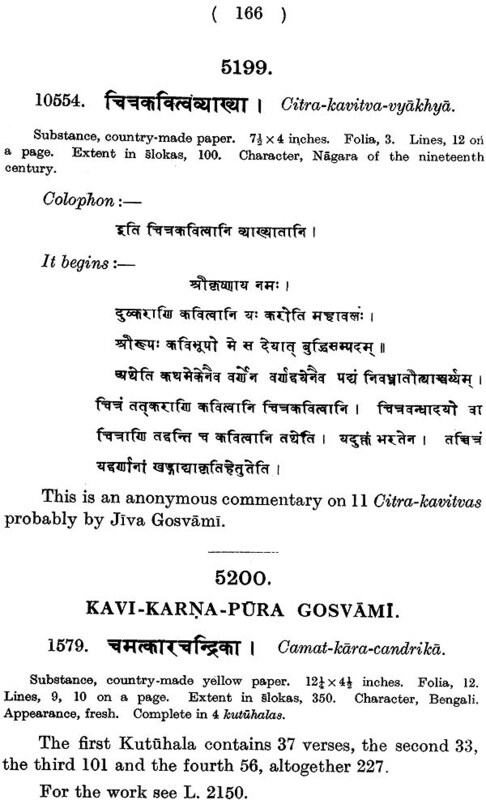 143A, of a projected comientary of the Rg-Veda, in the seventeenth century by a prominent Hindu scholar named Kavindra or Sarvavidya-nidhana Kavindra-Sarasvati. I have placed the Sastras and Ukthas immediately lter the text of the Rg- Veda: because they are really texts though arranged in an extraordinary way. These Sastras are recited by Rg- Veda priests on different occasions, at different sacrifices; sometimes the Mantras are not to be found in the printed edition of this Veda but else- here. 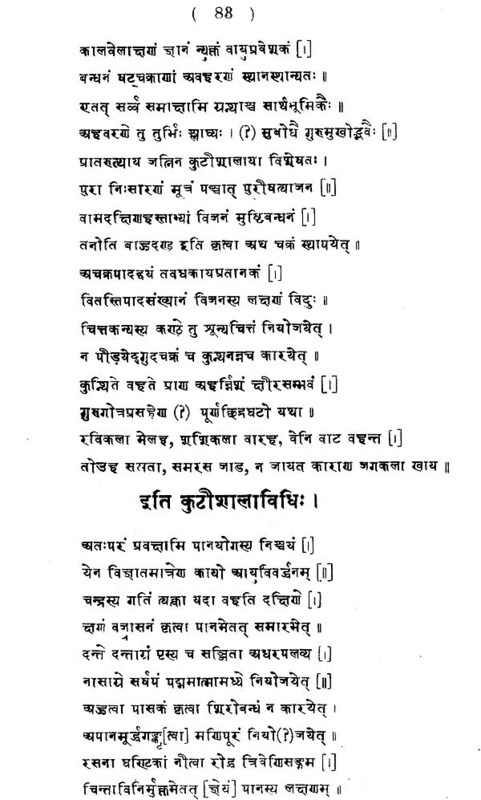 Modern scholars think that Vittala and Vithova extensively worshipped in the Marhatt, a country are forms of Buddha, but Buddha is an incarnation of Visnu, and so Vittala and Vithova, are worshipped as forms of Vishnu,- and 12 Rk-Mantras are uttered in their worship. 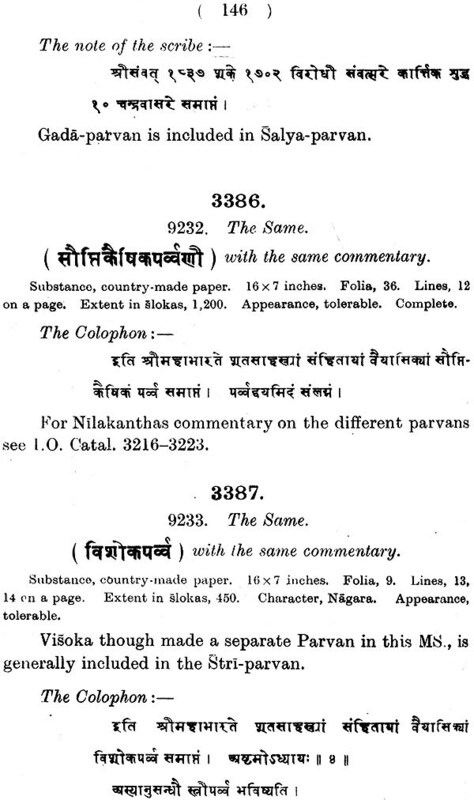 Commentaries of these Mantras are to be found in the Catalogue (No. 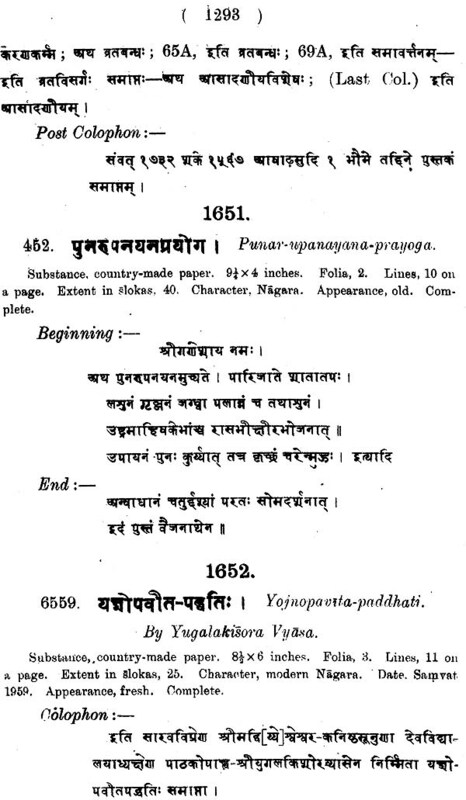 176). 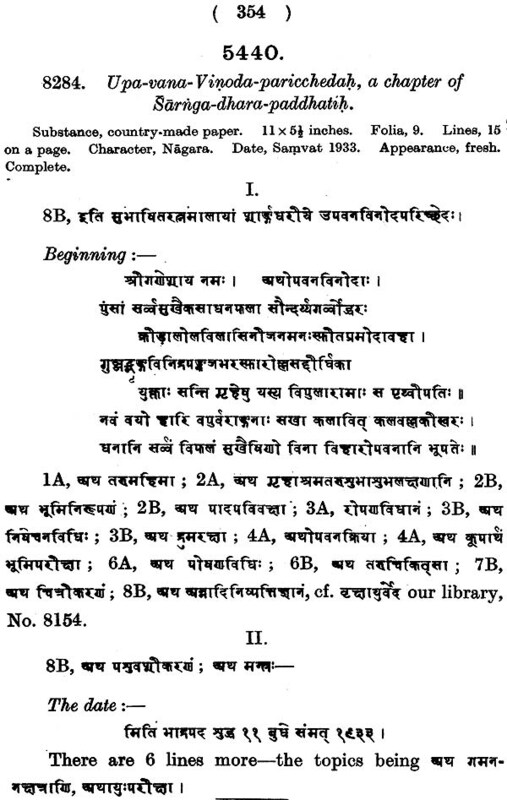 After the Mantras and Brahmanas of each Veda I have given what is known as Laksanagranthas, under the English name, Subsidiary Treatises. 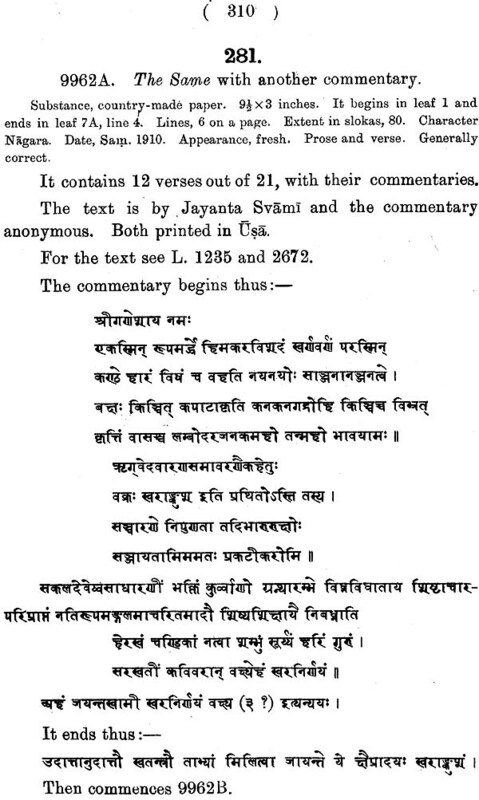 Under the Rg- Veda, Katyayana's Sarvanukramant conies first with its commentaries. Then comes first work entitled Rg-Veda- nukramanika " with its commentary by Jagannatha, which seems to belong to a Sakha of the Rg- Veda, different from that of the Sakalas, it most probably belongs to the Vaskala Sakha. 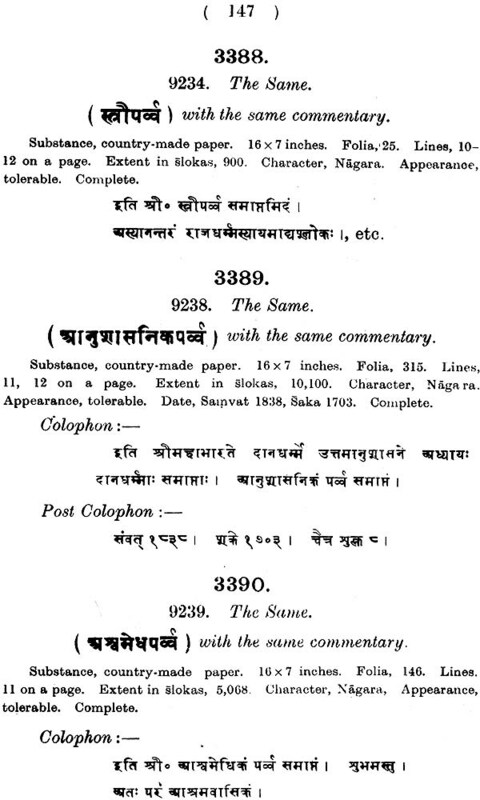 The Rks in one, number 10,552 and in the other 10,580, Another manuscript, No. 238, gives perhaps the index of another Sakha. 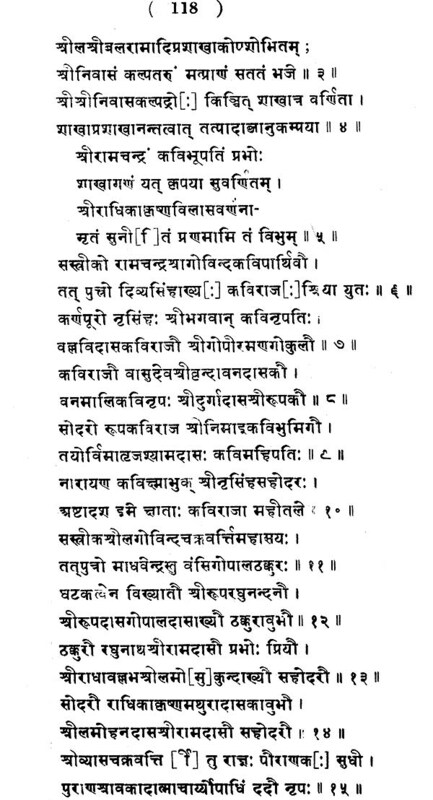 These are indices of the books, chapters, lessons hymns and verses and of Rsis, metres, etc., of the Rg- Veda. But there are other indices too, of peculiarities in grammar and pronunciation. These are embodied in Nos. 255 to 261. 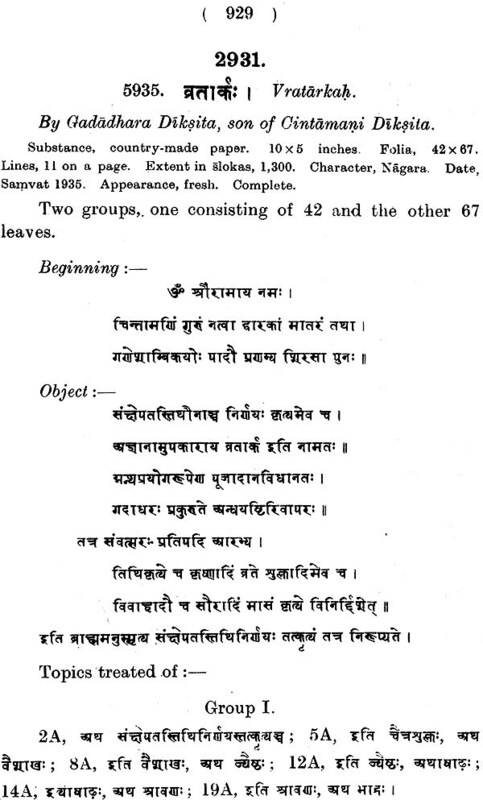 "How useful these lists were to subsequent writers of pratisakhya and grammar, may be seen from the fact that one of the Iists in our Gani No 256 has been turned into a Suttra, in p. 53 of the Saumaka –rk-pratisakhya the Chaukhamba Series." 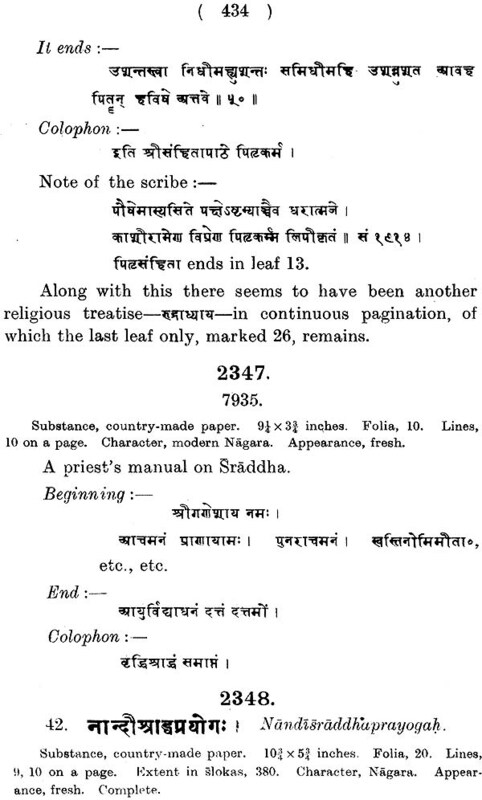 There are quite a Humber of manuscripts, of works on the three Prakrti and eight Vikrti pathas. 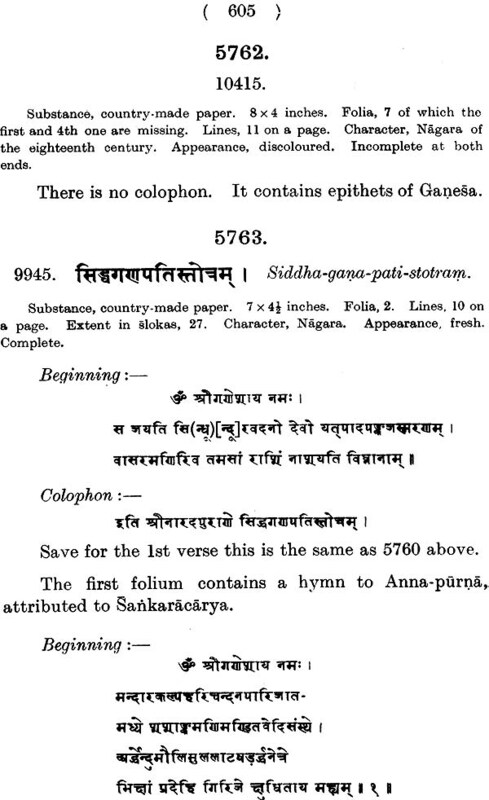 Some words are often dropped at Padapatha and these are called galitas, and the galitas are treated of in No. 290. There are two Suttras known of the Rg Veda, namely, Asvamyana and Samkhyayana. 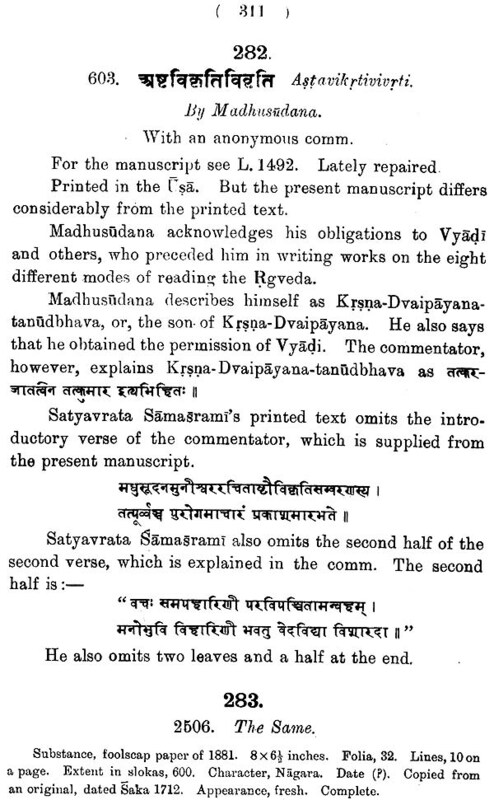 The former has many commentaries, some of these are' running commentaries' and others liturgical, called Prayogavrtti , The most popular liturgical commentary is by one who describes him- self as 'Traividya- Vrddha' and 'Talavrnta-nivasin.' 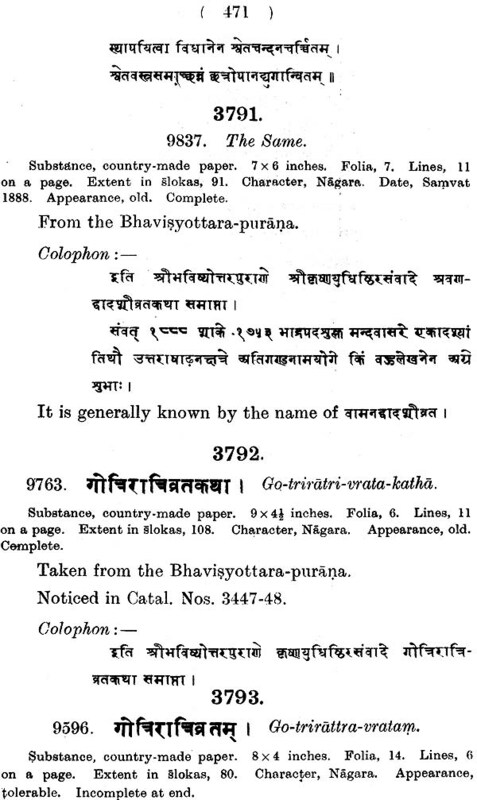 Hi proper name has now been found to be Kesava (p. 537). Many Rg-Vedins, however, perform their rites according to the processes prescribed by Katyayana, Apastamba and Beudhayana, none of whom belong to the Rg- Veda. The followers of the Asvalayana school are the most numerous, those of Samkhayana are small in number and the school of saunaka seems to have merged itself into that of his pupil Asvalayana. Still the present collection has some works of the Saunaka school and these have been separately dealt with. Black Yajus comes next. 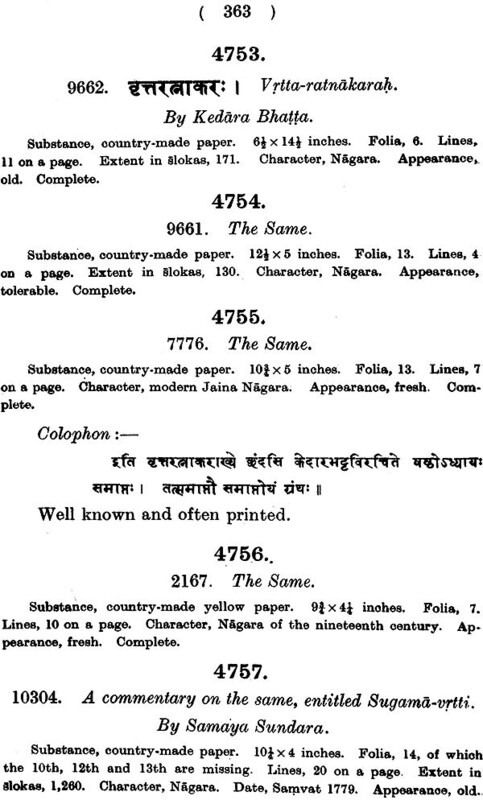 The collection is poor in texts of the Black Yajus-Samhita. It makes up the deficiency, by works on Rudra, which form a peculiar feature of the Black Yajur- Veda. 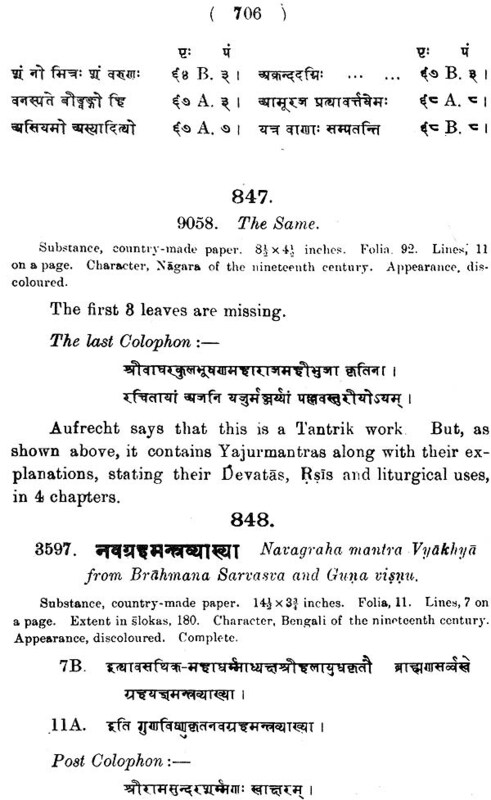 The manuscripts of Taittiriya Brahmana, too are few. 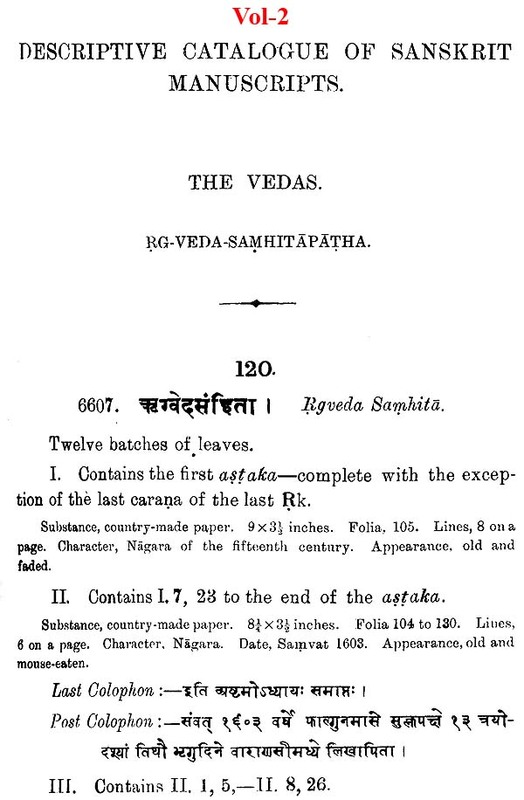 There are, however, many works giving lists of words in this Veda, which drop their visarga after a, in which e, ni are not changed into a or a as in Samhita in which a n comes in or a ta, on which stress is given and so forth. 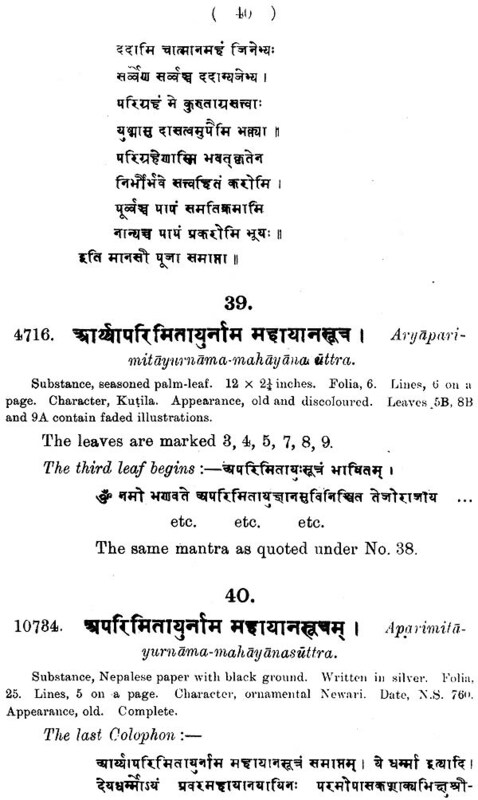 These works are of the same nature as the Laksanagranthas of the Rg- Veda. 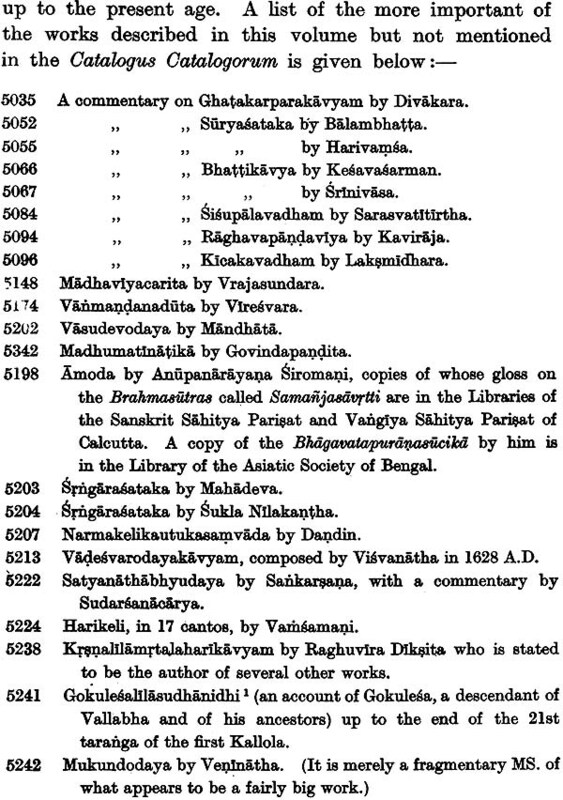 The Manava-Sulva- Bhasya, the Kathaka-Srauta-Suttra, Bharadvaja-Grhva-Sut tra, Paribhasa-Sut.tra of Bharadvaja are rare- works belonging to Sakhas of the Black Yajur- Veda, which are rapidly becoming obsolete. The Hiranya- kesi, the Apastamba and tile Baudhayana School are very strongly represented in the present collection, the last two specially so. 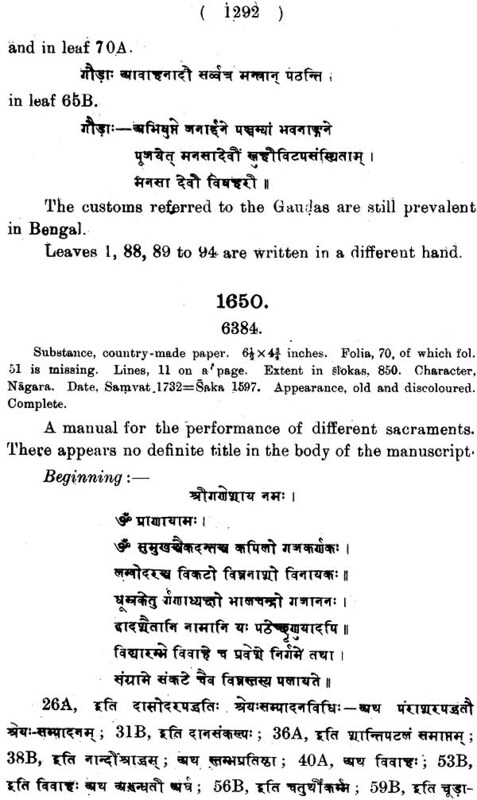 The present volume of the catalogue of Sanskrit Manuscripts in the Government collection under the care of the Asiatic Society of Bengal contains descriptions of manuscripts from No. 1846 to 3077 with three more in the Addenda. 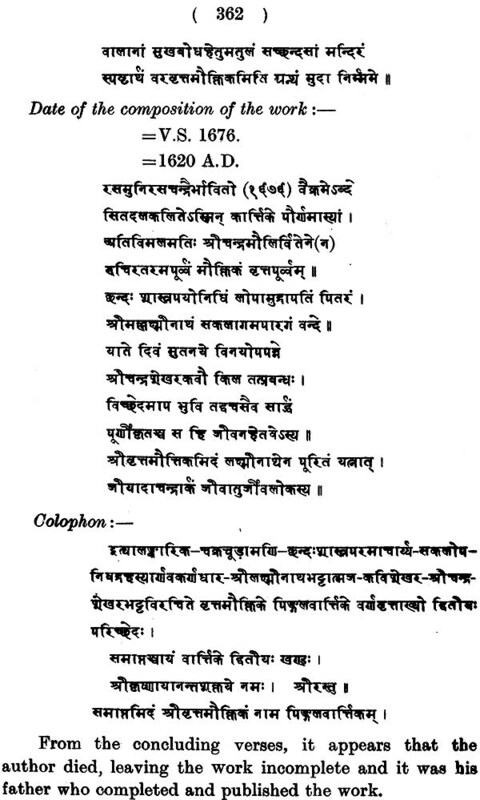 The Smrti works treated of here range from Gautama's Dharma-sastra-e-the upper limit of the age of composition of which Buhler did not hesitate to put in the 10th century B.C. 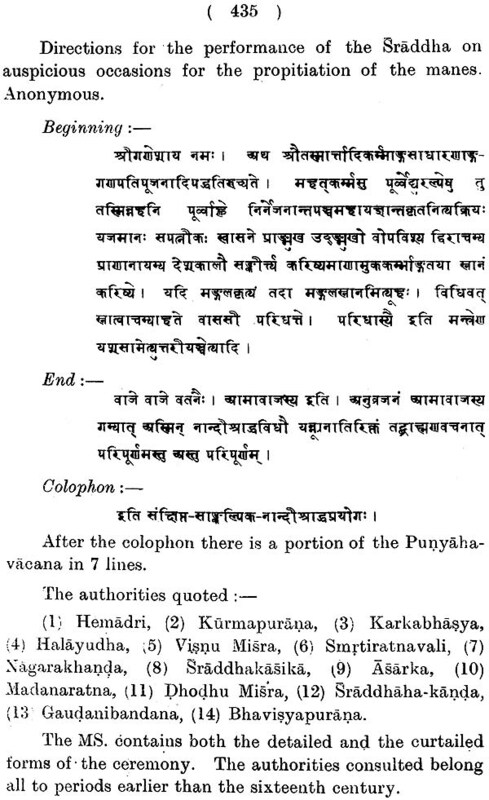 - to such works as Kayastha-vyavastha, Kayastha-uivecana, Kayastha-Katriyatva-druma-kuthara and others composed at the end of the 19th century. During this long period of nearly three thousand years the Smrti literature may be divided into five broad Sections-(1) Sutras, written by ancient Rsis in aphoristic form, ranging generally from 1000 B.C. to about the beginning of the Christian era. 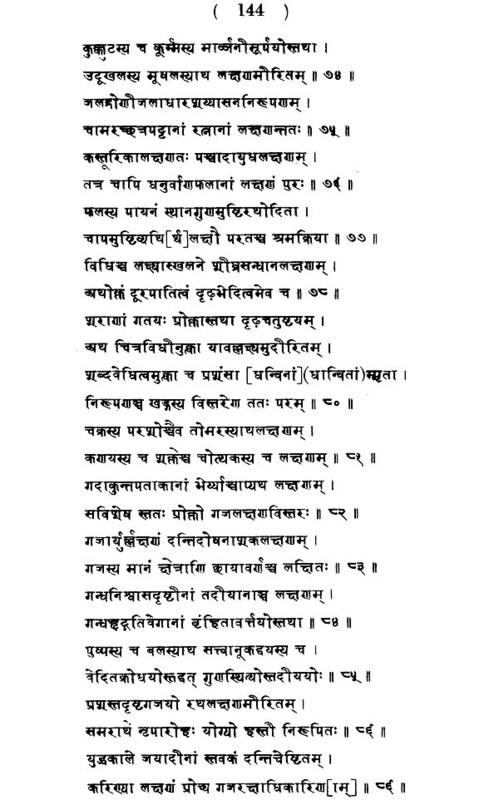 (2) Long metrical works generally in slokas of 32 letters (Anustubh) .Irom the 2nd century B.C. 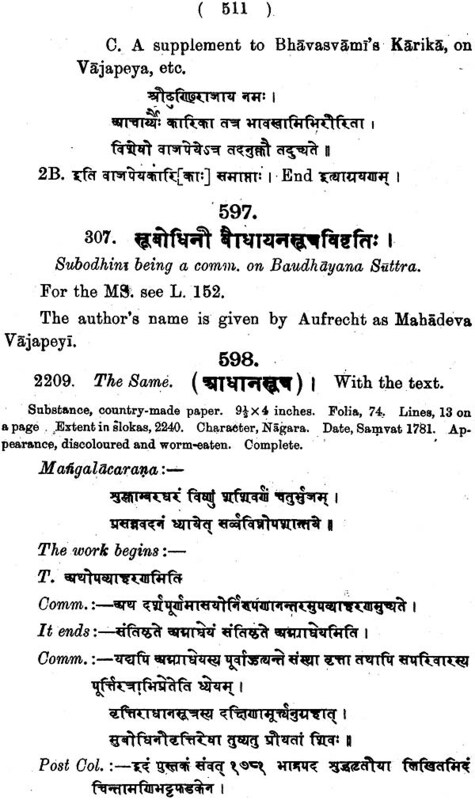 to 1200 A.D. (3) Commentaries on the Sutras and metrical works, from 400 A.D. to 900 A.D. (4) Comprehensive commentaries forming something like digests, ranging from 700 A.D. to 1400 A.D. (5) Nibandhas or digests from 1000 A.D. to the present day. The last class is the most extensive and most important. The works began to be composed when the Muhammadans first set their feet on Indian soil, in order to preserve the Hindu Society intact, by codifying its Laws, Regulations and Rules of conduct in life. Before proceeding further, it is 'necessary to define the meaning of the term Smrti, and to explain what it includes, and what it does not. The two authorities which guide the life of Hindu India are Sruti and Smrti. 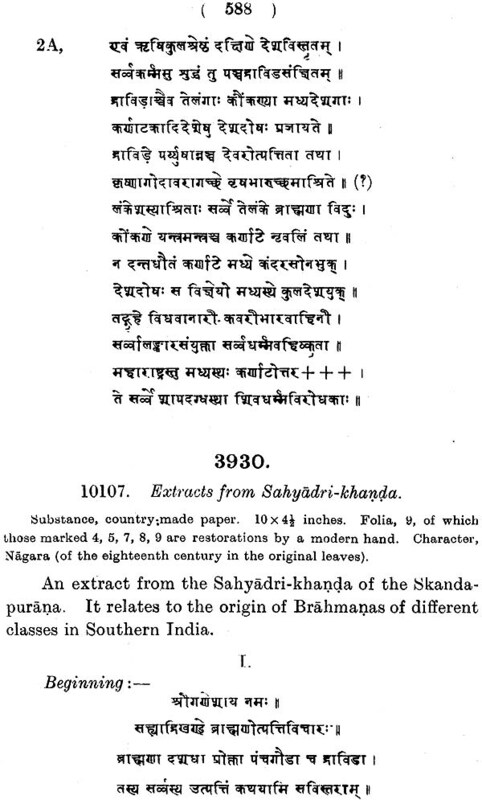 Sruti is revelation comprehending the Samhitas and the Brahmanas of the Vedas, the Brahmanas including the Arar:tyakas and the Upanisads. They are all considered to be a revealed literature, either seen by inspired sages or composed by them under inspiration. Smrti derives its authority from the Sruti and follows it faithfully. It is called Smrti because it was derived from the memory of great sages of Ancient India. Much of the Sruti is lost. Wherever a Smrti idea cannot be traced directly to Sruti, it should be understood that some lost Sruti is the basis of it. But if Smrti ever contradicted a well-known Sruti, the theory of lost Sruti held good in ancient times and the Smrti was rejected; the modern scholiasts, however, are not inclined to reject it, but reconcile the contradiction by means of new interpretations. 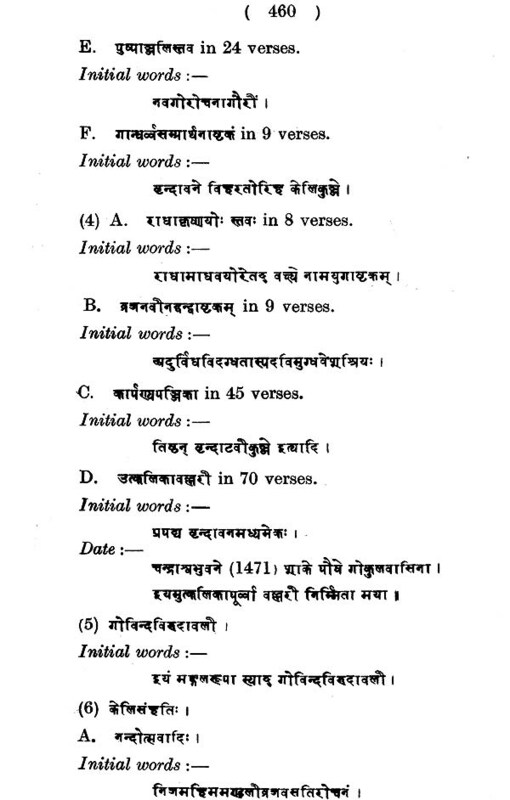 The Smrti had its origin in the Vaidika Schools, Sakhas or Parsads, each Sakha, to preserve the integrity of the Vedic traditions prevailing among its followers, wrote works on the six Vedangas, namely (1) Phonetics; (2) Sacrificial and other Laws;' (3) Grammar; (4) Philology; (5) Prosody, and (6) Astronomy. 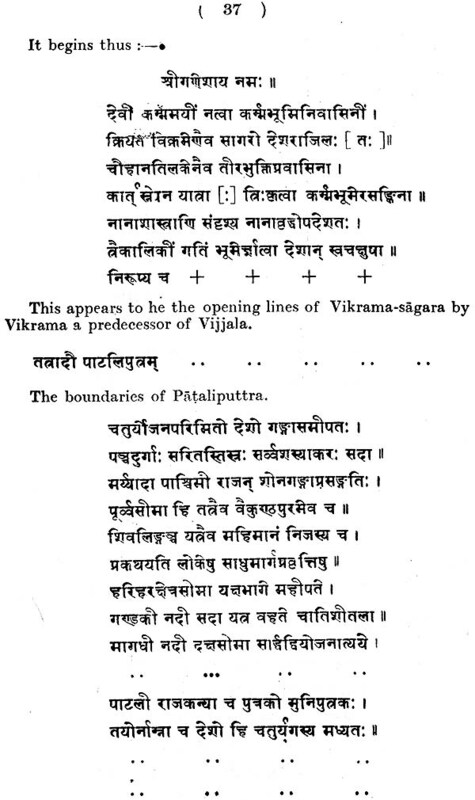 Of the six Vedangas the second called K aZpa is broadly divided into two Sections, Srauta and Smarta, Srauta deals with sacrificial rules and serves as a commentary and a supplement to the Brahmanas, while the Smarta deals with domestic and social regulations which derive their authority from the memory of and tradition among the sages. 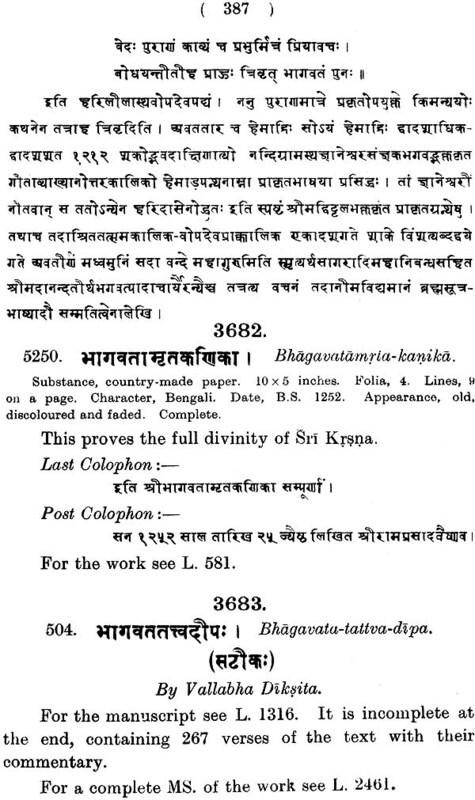 There are many schools which have preserved their Kalpas intact, but the majority have left only fragments of their Kalpas; of the former class are the schools of Apastamba, Baudhayana, Hiranya-kesin, Asvalayana and Katyayana , of the latter, i.e., those whose Kalpas we get only in a fragmentary and incomplete condition are Bharadvaja, Masaka, Gautama, Vasistha and so forth. 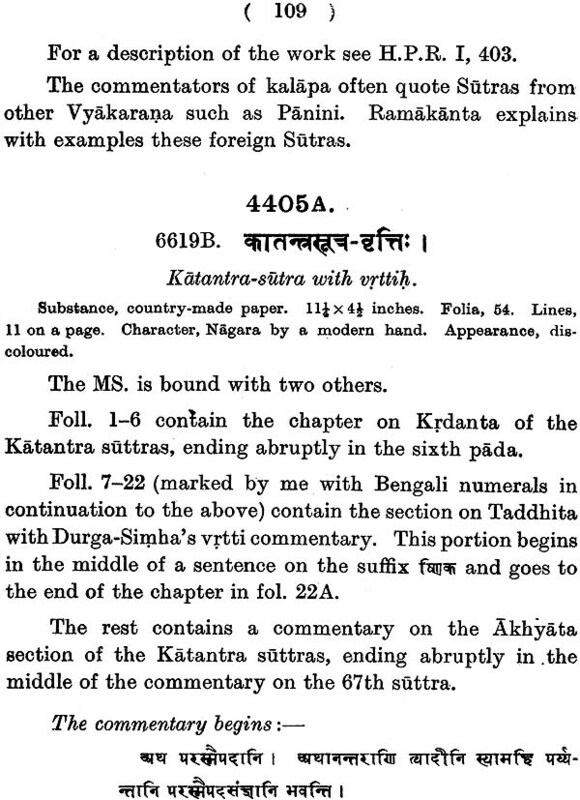 The Smarta Sutras of the Vedanga "Kalpa" are again divided into two parts, the Grhya 'domestic' and the Dharma, which for the want of a more expressive word, I would call' social,' and these domestic and social regulations are the subject matter of the literature 'we call Smrti, though other subjects also came within its purview during the revolutions, social, political and intellectual, during this long period of three thousand years. Politics and economics form no part of Smrti, though their spheres often overlap. Politics and economics constituted different Sastras called the Artha-sastra and the Dandaniti, Since the subjection of India under Muhammadan rule, Hindu politics has almost disappeared, and the regulation of the economics of the country is in foreign hands. Therefore the Nibandhas, which are almost synchronous with the Muhammadan Rule, often treat of, though in a desultory and fragmentary way, of politics and economics along with the domestic .and social regulations of the Hindus. But generally speaking politics and economics 'rave dropped away from Smrti. 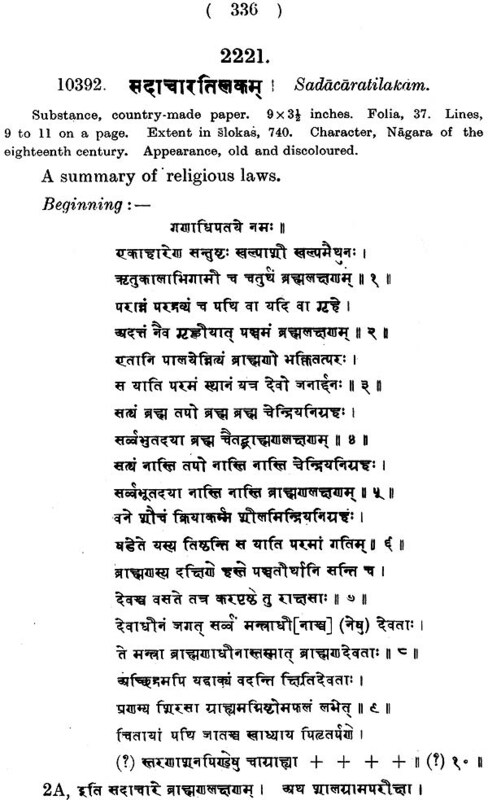 In ancient times when Hindus were independent, the sutras and the metrical smrtis were quite enough for the needs of society. Domestic and social law, and even the law of courts were all eternally fixed either by revelation or by inspiration, and the privilege of interpreting those laws was the exclusive prerogative of the brahmins. The King could make revenue regulations, police regulations, military regulations, and could regulate even the economic condition of the Empire, but could not interfere with what was regarded as the substantive law of the country. The privilege of interpretation was exercised in a statesman-like frame of mind, and the brahmins made the laws not rigid but elastic. Whatever might be the political condition of India at a certain given time, the brahmins in different geographical areas liberally interpreted their inherited laws and gave them a local colouring. But in order to preserve Hindu society intact their successors had to reduce everything to writing and make them more and more rigid. And this is what has preserved Hindu society in spite of a succession of political upheavals and foreign invasions. It will be shown later on that wherever the Hindus either retained or obtained some political power, either independent or dependent, they had recourse to a codification of their Smrti literature. Nearly fifty of these codes are still extant in complete form, and of hundreds more only fragments are available. This will show how the entire energy of the leaders of Hindu society was directed towards codifying locally the laws prevalent in Ancient India and enforcing these laws on the Hindu population. 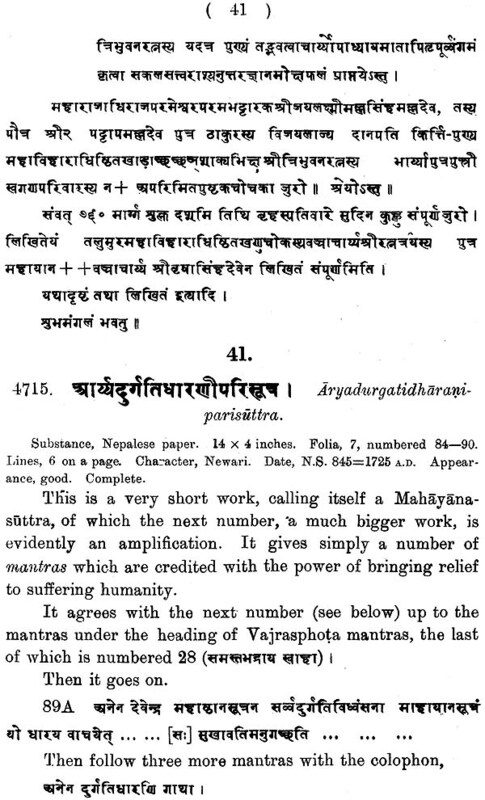 This is the fourth volume of a Descriptive Catalogue of Sanskrit manuscripts Edited by Maha Mahopadhyaya Haraprasad Shastri, and first Published in 1923. The Importance of the volume consists in the fact that it is descriptive catalogue of some valuable historical, geographical, and genealogical manuscripts which are preserved in the Asiatic society. The methodology of Haraprasad Shastri, Evident in this volume, is still considered useful. It is hoped that this edition of the catalogue would be of use to the researchers. 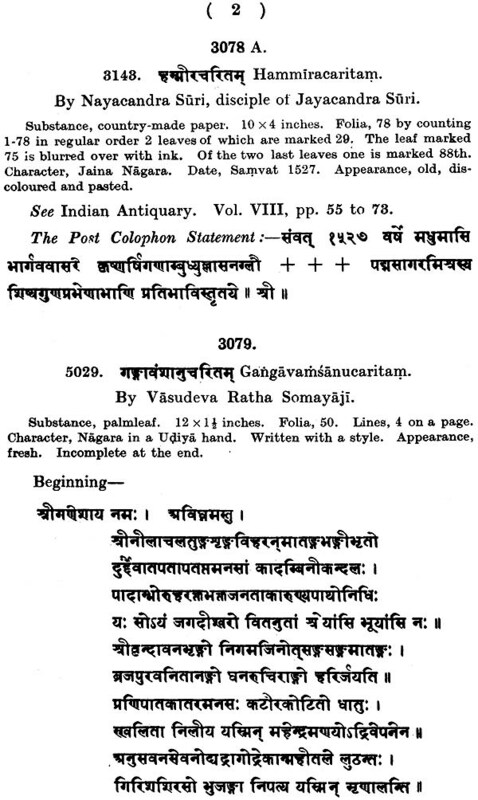 The fourth volume of the Catalogue of Sanskrit Manuscripts from No. 3078 to 3132 is now presented to the public. I have ventured to call it a volume" on History and Geography. 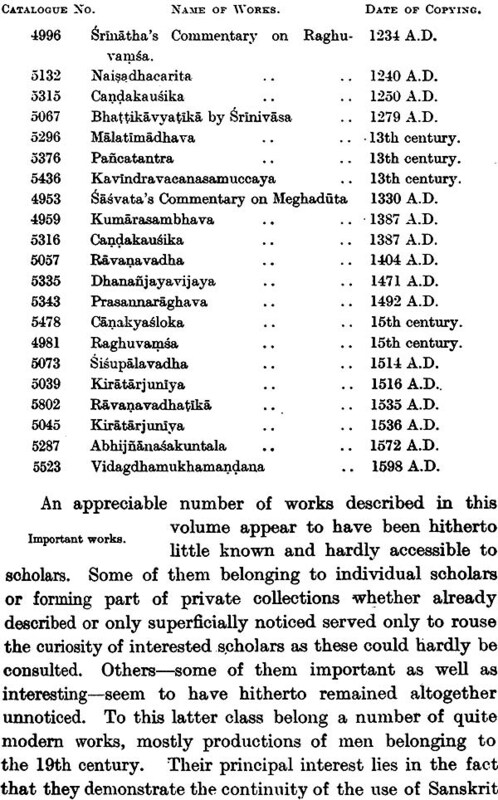 This might seem strange to the ear of Oriental scholars who always lament the paucity of historical works in Sanskrit. The works described in this volume are mostly little known to the public and it will appear so, as there are few Catalogue references given in this volume. 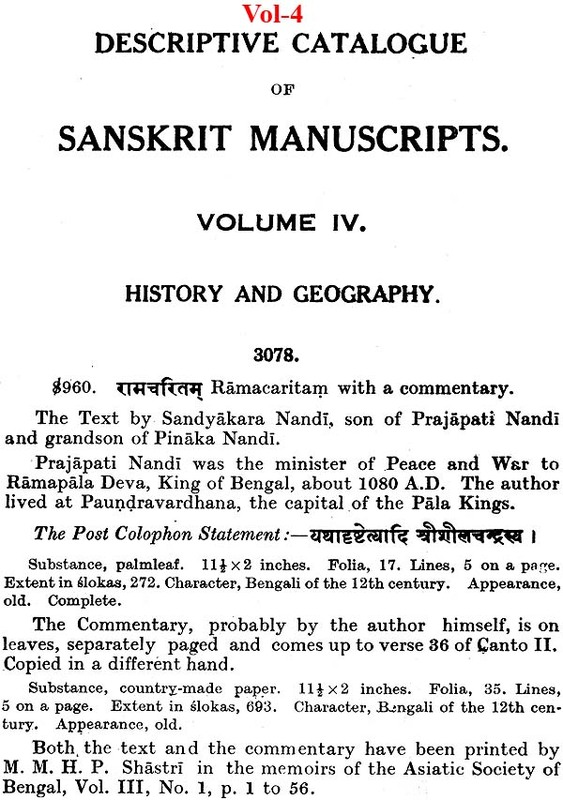 The first work treated of in this volume is "Ramacaritam" by Sandhyakara Nandi, written about the end of the 11th century A.D. It gives the history of three generations of Pala kings of Bengal. It is accompanied by a commentary for a canto and a half, the rest of the work not being commented upon. 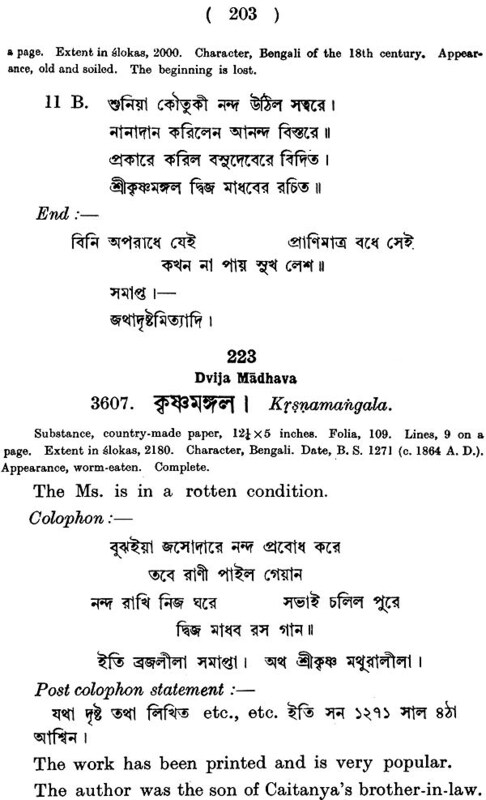 The work is rather difficult to understand without a commentary because it is written throughout in double-en- tendre, giving, on the one hand, the story of Ramayana and on the other, that of Ramapaladeva;' a Pala King of Bengal. 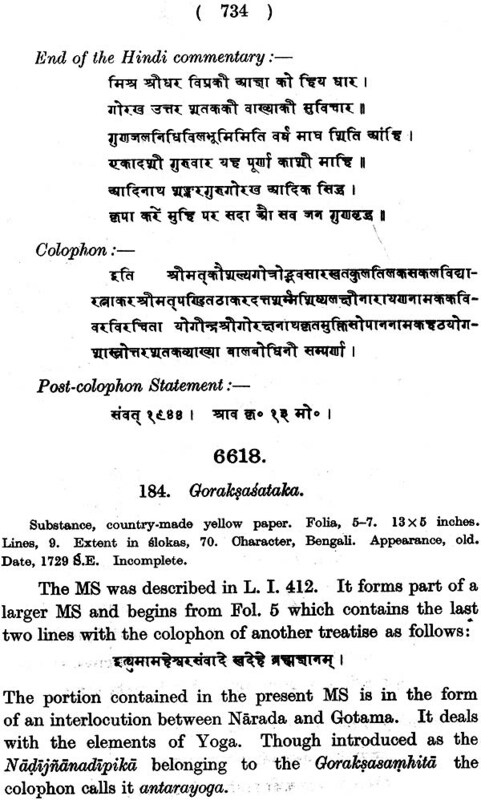 Attempt was made by certain Bengali scholars to prepare a commentary of the uncommented portion of the work, but as the history of Bengal of that period is absolutely unknown, the attempt failed. "But I need not dilate on this work as it has been published in the Memoirs of the Asiatic society of "Bengal, Vol. III, No. 1, and as it froms the basis of many histories of the Pala Dynasty that have appeared: after its publication. 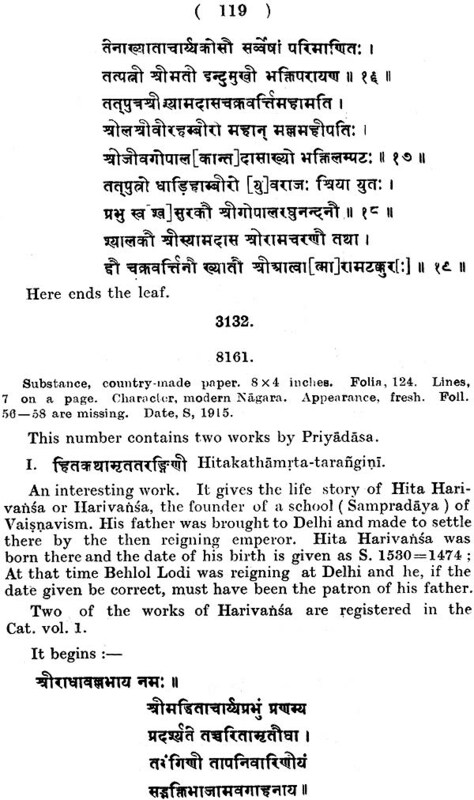 The second work is "Hammiracaritam" by Nayacandra Suri, a Jaina: writer, giving the history Hammira Cauhana, the Raja of Ranastambbapura (vulgo-Rintambore), the strongest hill-fort in India, now in the Jaipur state. Hammira fought gallantly in the defence of his kingdom against Alauddin Khilji during the closing years of the 18th century. The third Ms. 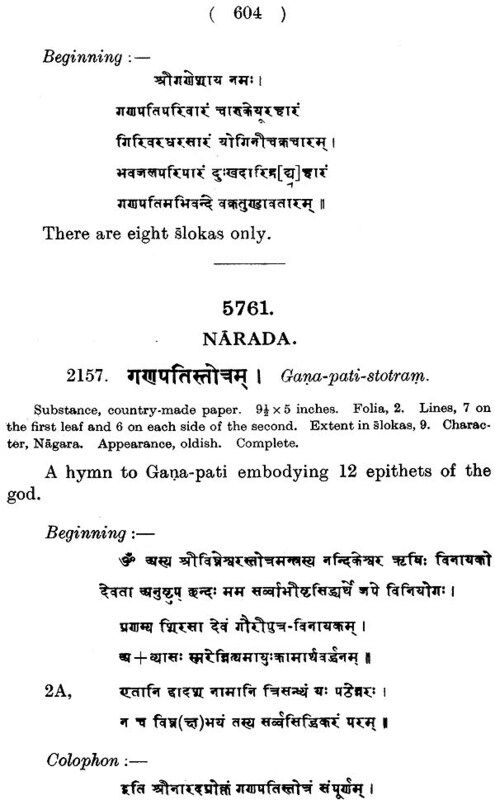 (No., 8079) is, a history by Vasudeva Rath Somayaji, which gives an account of the Ganga family of Kings in Orissa, who ruled that country from the middle of the 11th century to the middle of the 15th. 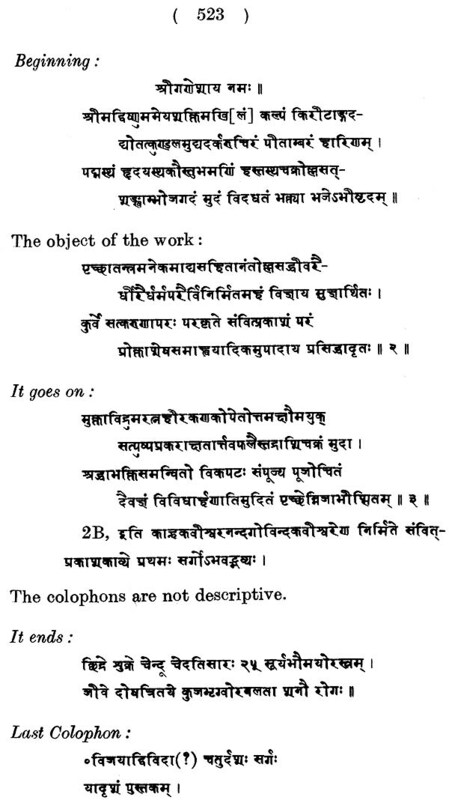 The fourth work, Bhojaprabandha (No. 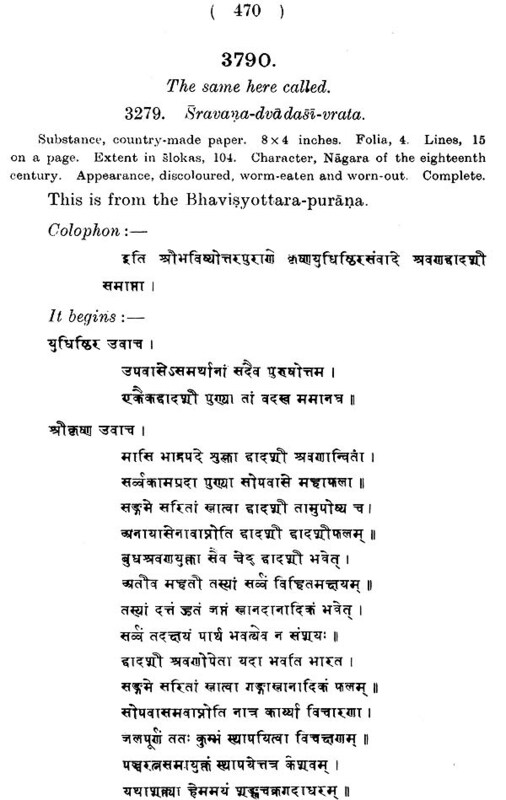 8081) gives a fabulous account of King Bhoja of Dhara. The next two works give the history of Prthviraja and Manasimha, Rajas of Amber (mod. Jaipur) in the 15th and 16th centuries respectively. The former is well known as the first great King of Jaipur, who divided his kingdom amongst his twelve sons. The division is called Bara-kothari. The latter is the well- known general of Akbar and Jehangir, who pacified and settled Bengal, and helped his masters in most of their wars, through- out India. No. 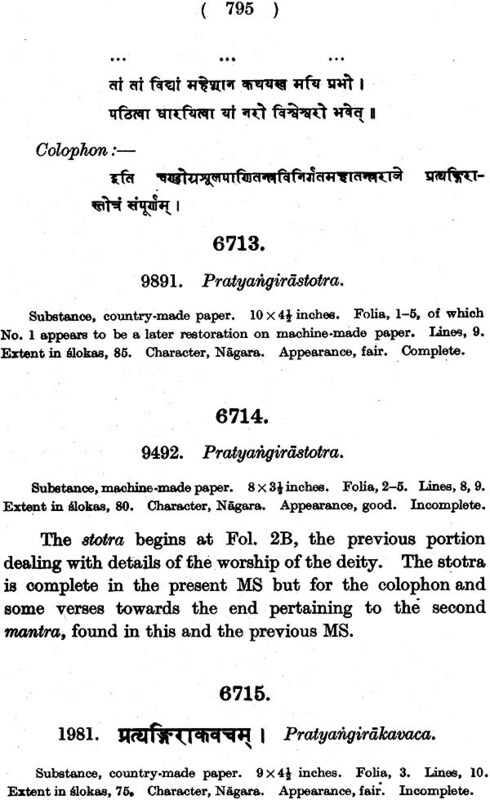 3084 is "Surjanacaritam", by Candrasekhara of Bengal. Surjana was the Raja of Ranastambhapura in Akbar's time. Akbar took the fort from him, not in war, but by exchange. He gave the whole of Hadavati to Surjana as his Svaraja, and made him the Jagirdar of Benares, with his capital at Chunar. He had a daughter who consecrated a temple at Benares to Pitambara, the yellow-clothed Krsna. No. 3085 gives the story of the consecration. No. 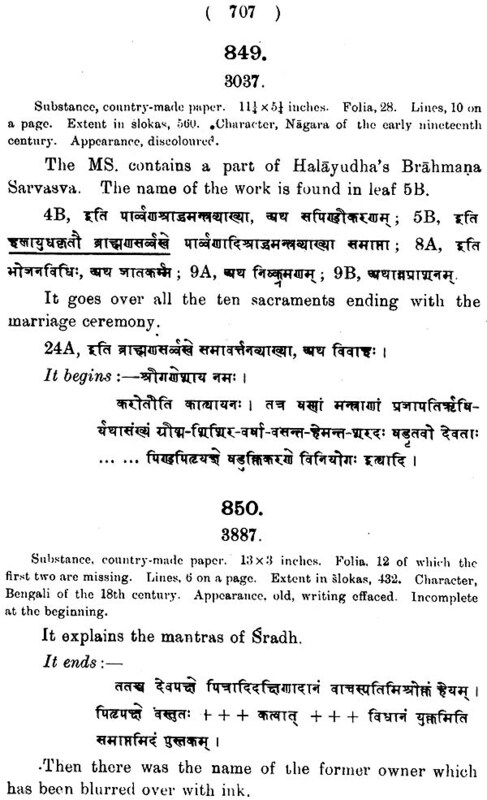 8086 gives the story of the consecration of the Phallic emblem of Siva by Devakumari, mother of Samgrama-Simha, the Ratna of Udayapura, in the 18th century. No. 8087 gives the history of Sevai Jayasimha, King of Jaipur in the beginning of the 18th century.
" 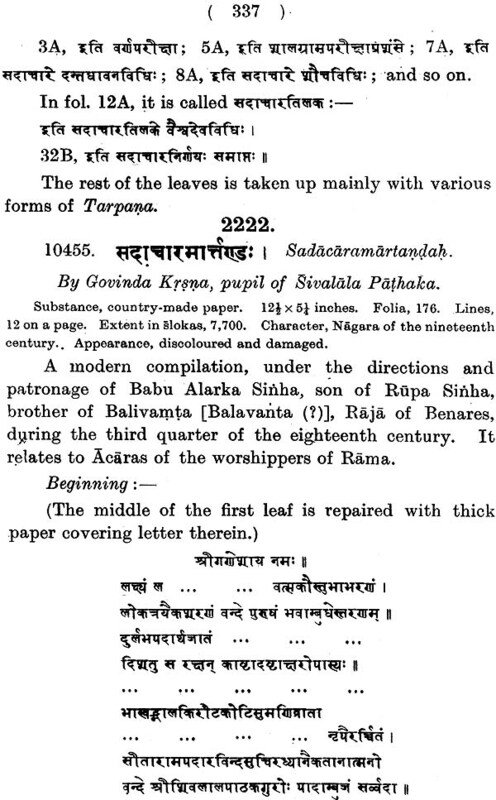 Sivaraja-rajyabhiseka-Kalpatam" (No. 3088) gives an account of the coronation of-Sivaji, the founder of the Mahratta greatness. No. 8089 -is the history of Chet Singh, the Raja of Benares, who was dispossessed by Warren Hastings, the first Governor-General of India. “Rajavali" (No. 3090) gives the names of prominent Kings of India down to the year 1754 A.D. when Alamgir II was the nominal Emperor of India. The last work on history (No. 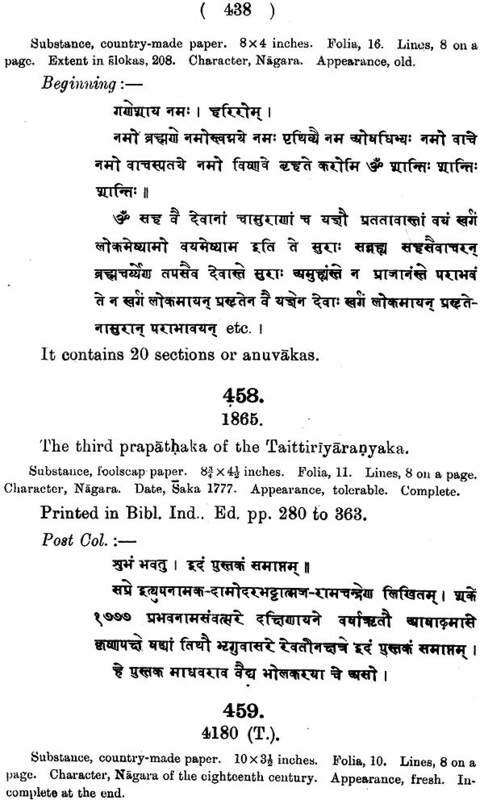 3091) treats of the administration of Pratapa Siva, descendant of sivaji to whom sitara was restored by the British government After the last maharatta war in 1818, and after their annexation of Peshwa’s territories to the government of Bombay. The second section of this volume treats of Geography and Gazetteer. The names of 56 countries of India are mentioned with their extent, in “Satpanacasaddesavibhag” (No. 3092). 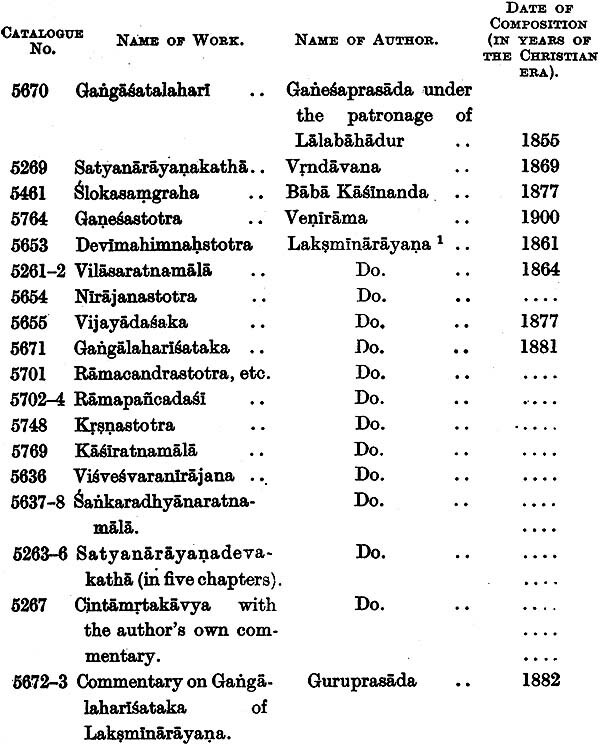 Fragments of a Gazetteer work, entitled "Desavalivivrti are given in No. 3093. 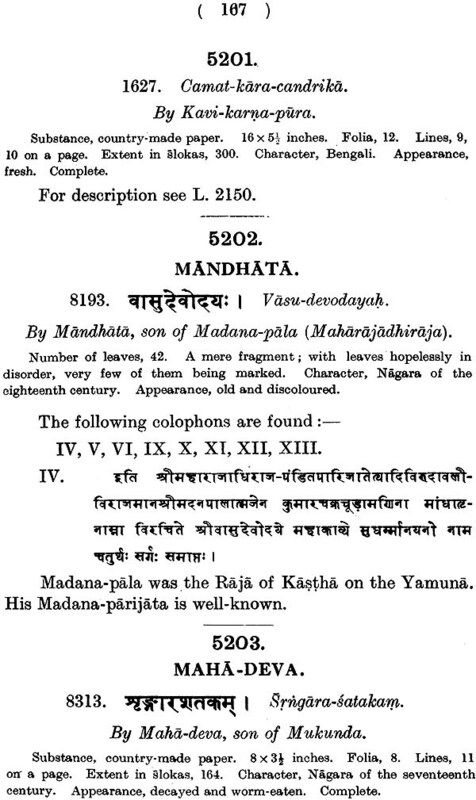 It was composed by Jaganmohana Pandit under the patronage of Vijjala Bhupati, a Cauhana Raja of four Pargannas, round Patna, in the 17th century. 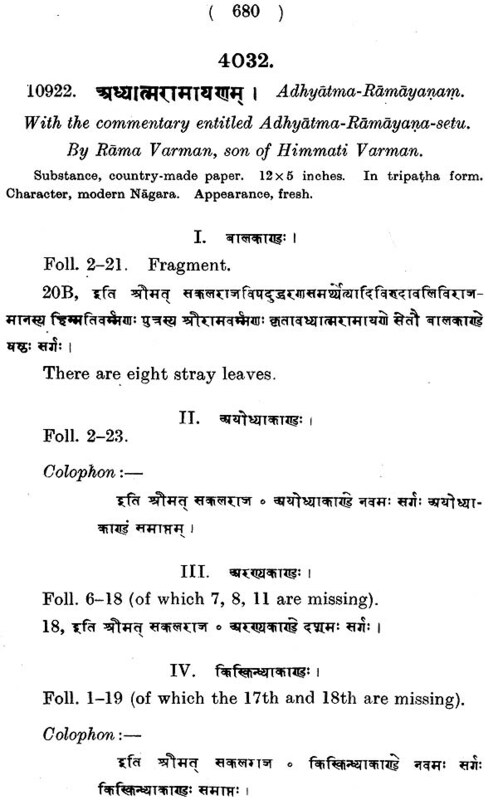 The fragments give descriptions of Pataliputradesa, Ranastambhadesa, Bundeladesa, Vangadesa, Varadayoginidesa, Vakala-Candradvipa, Bhupaladesa, Sarayuparadesa, Kosaladesa, Avadhidesa, (mod. 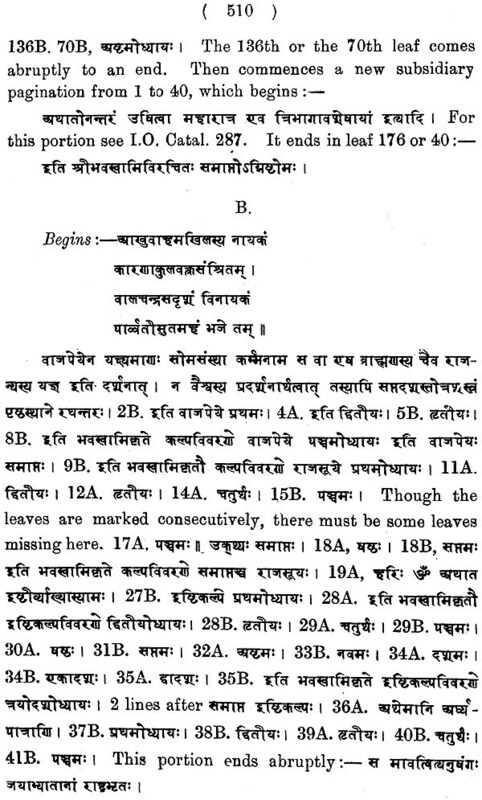 Oudh), Alapasimhadesa, Manatadesa in Radha, Angadesa, Sagaradesa, Varendradesa, Dungurapura- desa, Hedambadesa, Gadhidesa, Tamralipta, Asamadesa, and visnupura. In giving descriptions Of these countries the author gives legendary accounts, recent history, character of the people, character of the products of the country and other interesting information about them. 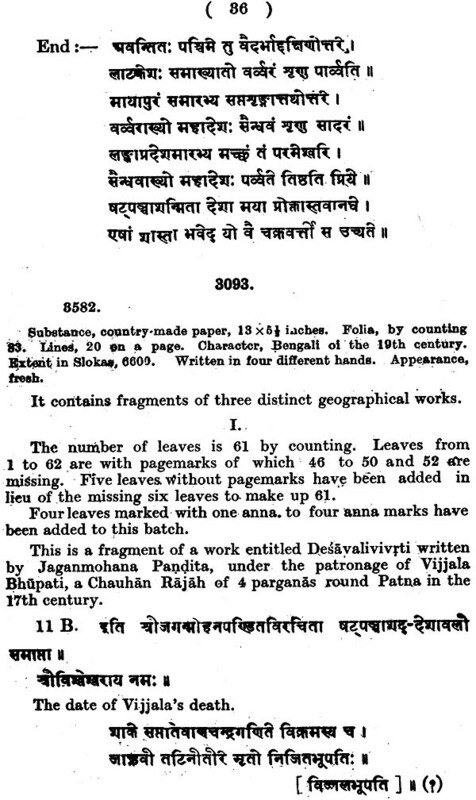 There are bigger fragments of Desavalivivrti and other and older 'Gazetteer works in the Ms. collection of the Sanskrit College, Calcutta. 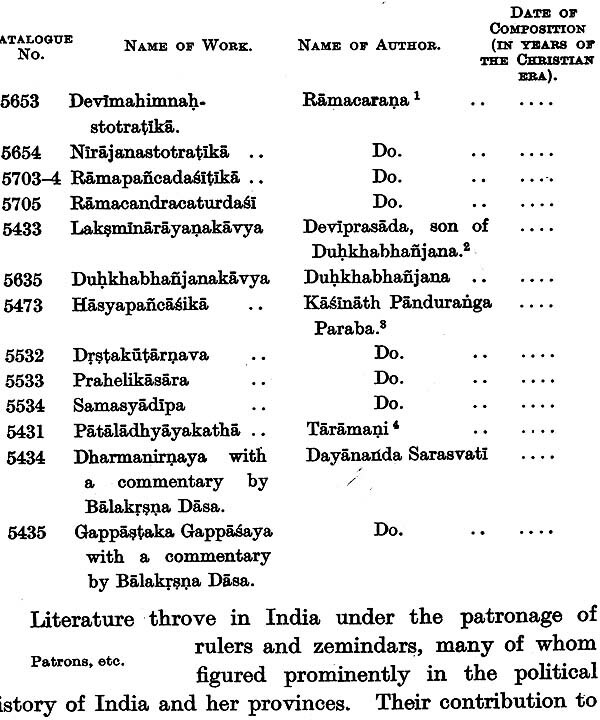 Iksvaku, Dasaratha and Rama are mentioned in the Rg- Veda. 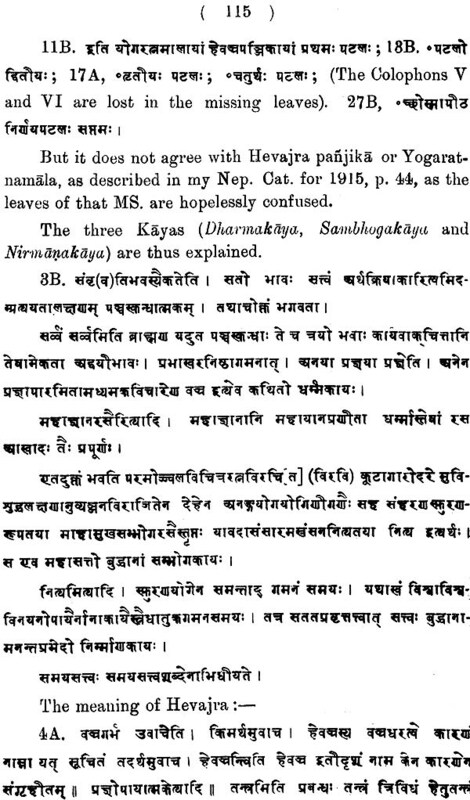 The Rsis mentioned in the Ramayana are generally those who either composed or saw Rk-hymns or Rk-mantras. 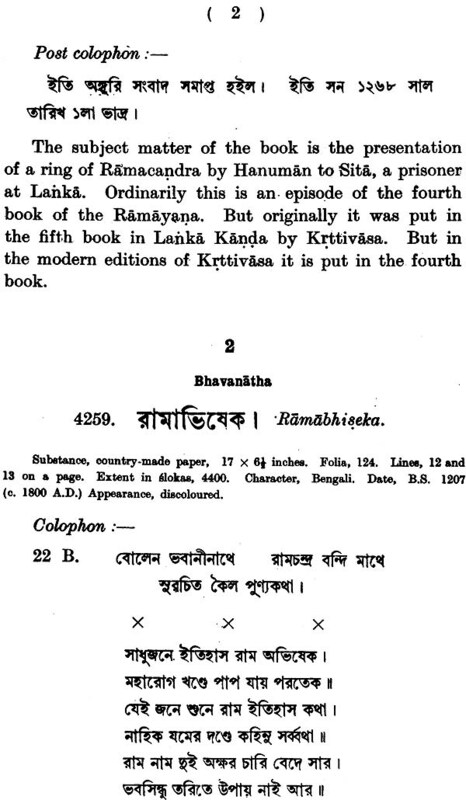 The Reis who started the gotra-system are found throughout the Ramayana, and they are mentioned together in one place, in the Uttara-kanda, Chapter I. The stories of the foundation and the history of the early government of the most famous cities in India are to be found in the Ramayna. In the Rg- Veda the Aryans are fighting with the Asuras from the west and black people from the south and east. In the Ramayana the same Aryans are seen fighting with the Gandharvas, and the Sindhu Sauviras in the West and the Raksaeas in the south and the east. In the Rg- Veda both Rsis and Rajas' are seen engaged in fighting. In the Ramayana, Rsis give up their weapons of war to Rama and confine themselves to the spiritual welfare of the race. India is found in the Ramayana dotted with the Asramas of Rsis and small principalities belonging to Kshatriya families who claim descent either from the Sun, the Moon or the Rsis. In the Rg- Veda the stream of Aryan migration seems to flow from the west to the east and the south the same is found in the Ramayana, over a greater extent of territory from Balhika where the same person IIa and Ila is the progenitor of both the Solar and the Lunar races to Ceylone. In the, Ramayana the primitive idea of men and women. exchanging the sexes like IIa and Ila, and the monkeys, birds and snakes living, moving and speaking like men is. found in abundance. All these considerations stamp the story of the Ramayana as very ancient. Many of the incidents of the Ramayana show that it is much older than the events of Buddha's life. The Dasaratha Jataka is one of the stories by which Buddha explained to his Sravakas the inner meaning of some of his doctrines. 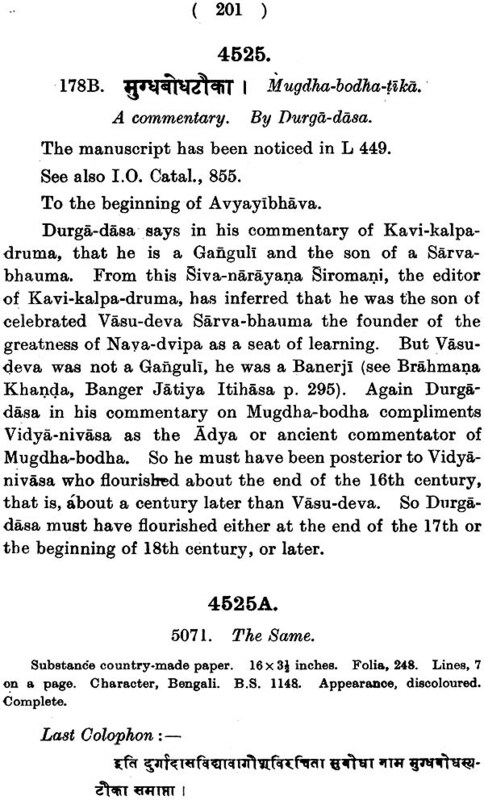 So Dasaratha's history was known to him as ancient. Visvamitra and Rama passed the confluence of the Sona and the Ganges but Patali-putra, which is said to have been founded in the last days of Buddha's life, was not there. They passed the city of Vaisali and received the hospitality of a prince of the Lunar dynasty but the oligarchy of the Licchavis was not there. The same thing also happened in Mithila but the oligarchy of the Videhas was not there. 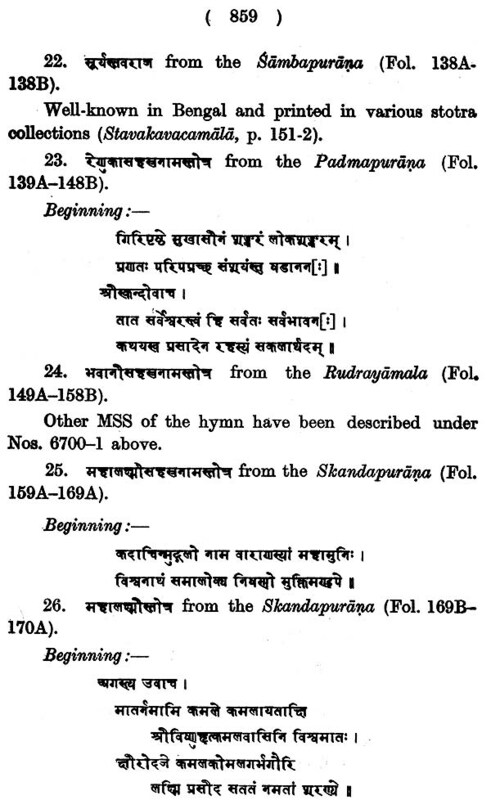 Sravasti, Rajagrha, Kausamhi, are famous cities in Sakya Muni's time but we hear of their foundation in the Ramayana, The Anga country in which Maha-govinda built the city of Campa, long before Buddha, is mentioned in the Ramayana but not opposite the place where the Kausiki and the Ganges meet but quite in another quarter, at the confluence of the Sarayu and the Ganges. 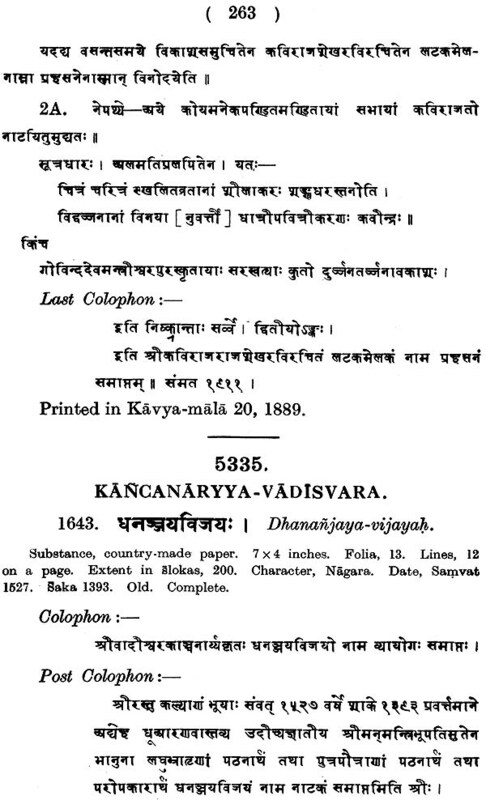 Dvaipayana Vyasa is several generations later than the last Vasistha and many more after the Vasistha of the Ramayana , and this Vyasa is the reputed author of the Mahabharata and the real father of Dhrta-rastra and Pandu, So in the Mahabharata are many Rsis and Munis more recent than those of the Ramayana. 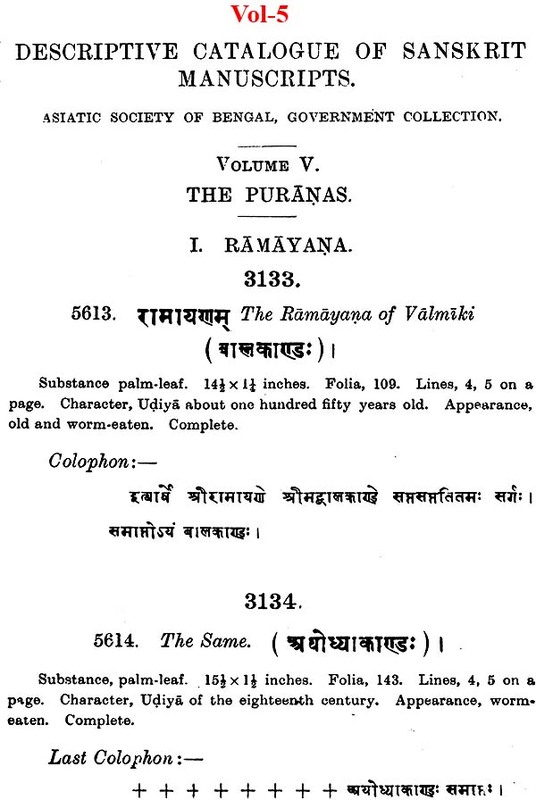 The story of Rama forms an episode to the Mahabharata and there are slokas in the work taken from Valmiki's Ramayana. We do not hear much of monkeys, birds, and animals taking part in human affairs and endowed with human speech. The Asramas of Rsis are not much heard of and the whole of India is parcelled out to Ksatriya families. The last king of the Iksakus in Kosala was killed while fighting in the cause of the Kurus, by Abhimanyu, several generations after Rama. Indian tradition divides 43,20,000 years of a yuga into sub-yugas of Satya, 17,68,000, Kali Treta 12,96,000 Dvapara, 8,64,000 B.C. and Kali, 4,32,000 years of which Kali commenced in 3101 B.C. The battle of Kuru-ksetra is said to have taken place at the beginning of the Kali era and Raja-tarangini puts it in the 653rd year- of the Kali era. 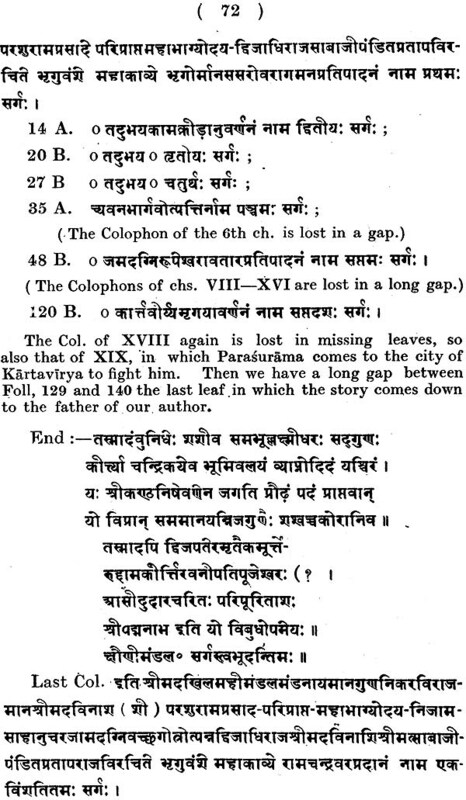 Mr. Pargiter who has studied the Puranas very carefully considers this chronology extravagant and puts the battle somewhere in the 9th or 10th century B.C. though he is the first Oriental scholar to attempt to establish the reliability of the Indian tradition and, in his Purana Text of the Dynasties of the Kali Age he found that the battle was fought 1,050 years before the Nandas, i.e. 425+1050=1475 B.C. or thereabout, European and Indian orientalists have placed the battle from astronomical calculations between 1100 and 1400 B.C. It is very difficult to compress the events that happened between the battle and the birth of Buddha within three centuries. These events are literary and historical, and comprise development of science, progress - in arts and so on. Nobody in these days will be disposed to take the long astronomical cycles as the basis of historical chronology but no Indian scholar would be willing to compress in three centuries so much of the developments in arts and science. Whatever may be the date of the Kuru-ksetra battle and whatever the date of the composition of the kernel of the Mahibharata the. Ramayana precedes that date by some centuries. The events of the Ramayana took place when the Rg-Veda Samhita was in the making and the Vedas had not been classified by Dvaipayana Vyasa. The Ramayana is neither a history nor a purana, It is an epic poem. It is a primitive epic of the nature of Istar and Isdubal and of the nature of Iliad of Homer. 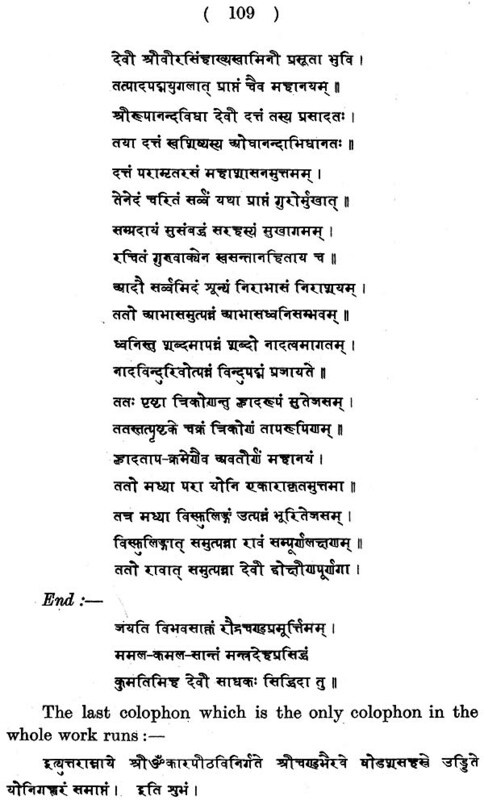 There was a vast quantity of ballads, songs, panygerics in verse in honour of the heroes, Rama, Dasaratha and other members of the Iksvaku race. These used to be sung by Caranas, Magadhas, and others. Many of -these related to the sacrifices, especially the Asvamedha Sacrifice in which it is enjoined that the Yajamana should be praised in songs in the spoken language. 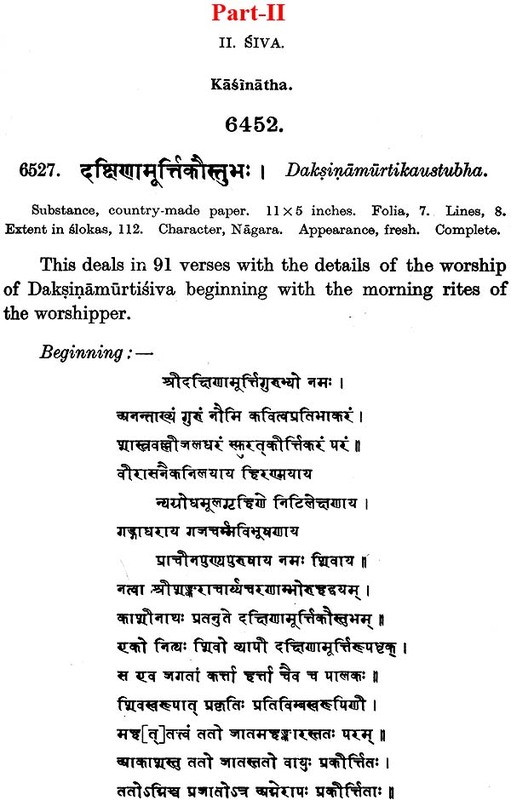 For instance, in the horse sacrifice of Sawai Jaya- simha of Jaya-pura in Rajaputana, about 1714 A.D., the songs were in Dingal, the language of the Caranas. These popular songs were put together in epic form in the Ramayana. N or is such epic poem unknown in India. The Kirttana songs in honour of the love of Radha and Krsa used to be written for several centuries from the fourteen to the seventeen. These were arranged according to emotion and sung. Early in the nineteenth century Raghunandana embodied them in an epic called Radhamadhavodaya. The same process of embodying the songs and paneygrics has produced the Saraj-prakas of Karant Dana and Virada Srngara. The Sivaji ballads in the Marhatta country will easily lend themselves into a magnificent epic. 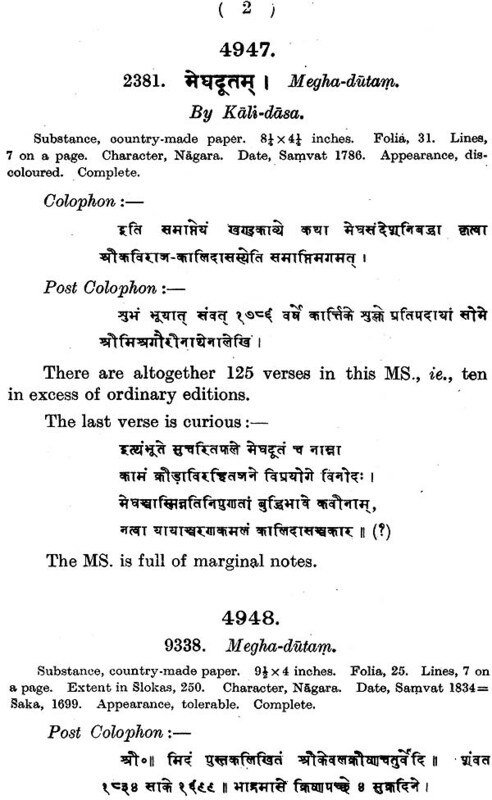 It is indeed a rare privilege for me to write a Foreword for A Descriptive Catalogue of the Sanskrit Manuscripts in the Collections of The Asiatic Society of Bengal, which was prepared by Mahamahopadhyaya Haraprasad Shastri, an eminent figure of renascent Bengal. This is the Sixth Volume of the above-mentioned Descriptive Catalogue in which the Mahamahopadhyaya gives a descriptive list of valuable manuscripts dealing with Grammar, Lexicography, Prosody, Rhetoric, Prakrta Grammars, Special Lexicons, Spelling books, and Letter- writers. 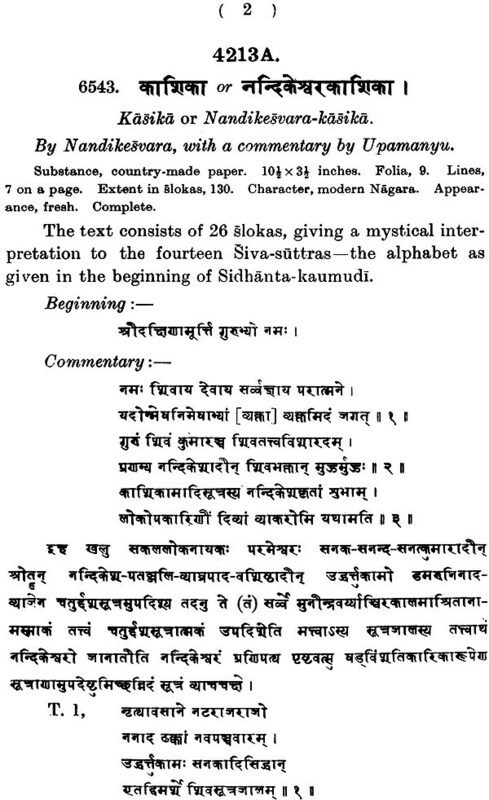 The curious student of Sanskrit Grammar would find in it the description of invaluable manuscripts on Panini's Grammar, and manuscripts dealing with the formulations of Kalapa, Vararuci, Candra, Cangu, Sarasvata, Hemacandra, Supadma et cetera. 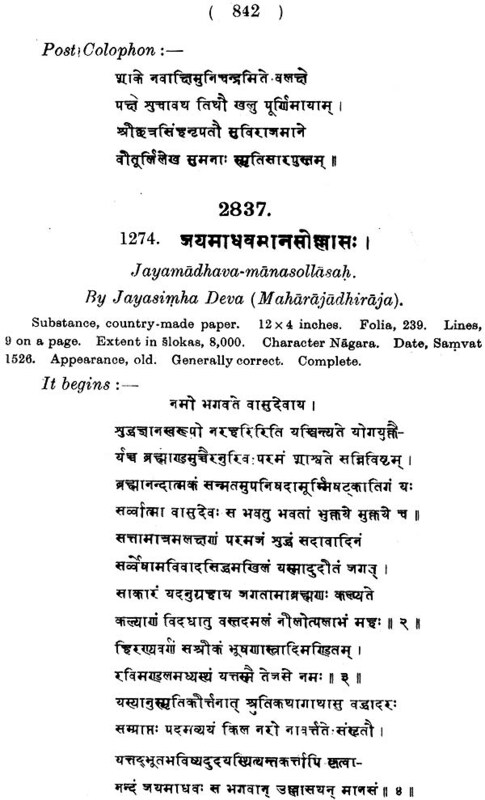 The Mahamahopadhyaya's Preface (pp. vii - cccxxxix) easily constitutes a historical tome, weighty with great knowledge, but remarkable for felicity of expression. 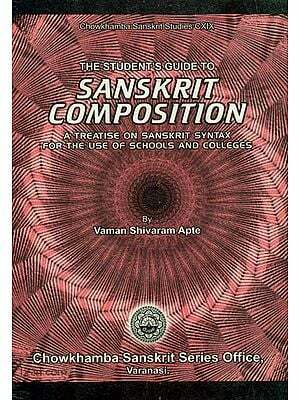 This volume VI of Haraprasad Shastrl's Descriptive Catalogue is indubitably indispensable for scholars who want to study Sanskrit Grammar, Lexicography, Rhetoric and Prosody. It is difficult to say definitely whether in the Samhitas of the Vedas, there was much speculation about the formation of words and the analysis of sentences. Passages which are considered to talk of grammatical speculations may be otherwise explained, or, if they speak of grammar in any sense, it is of the most primitive kind . 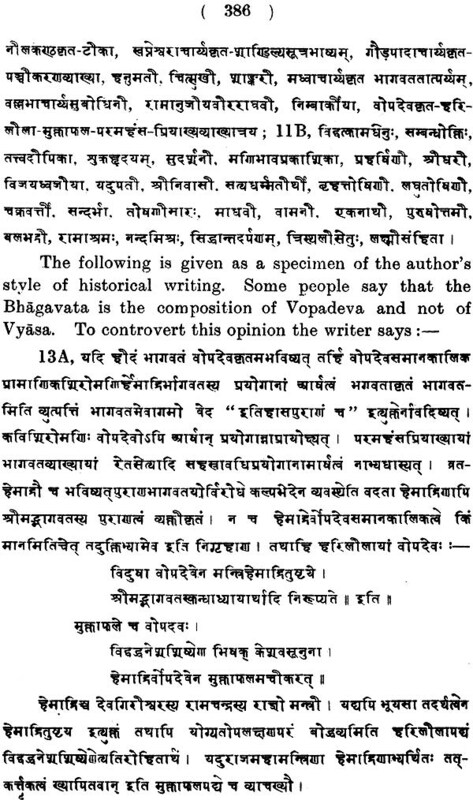 In the Brahmanas, however, along with speculations of all sorts, there were undoubtedly speculations on grammar, very primitive, though conscious, efforts. I will give one example from Chandogya Upanisad, which is a part of Chandogya Brahmana. 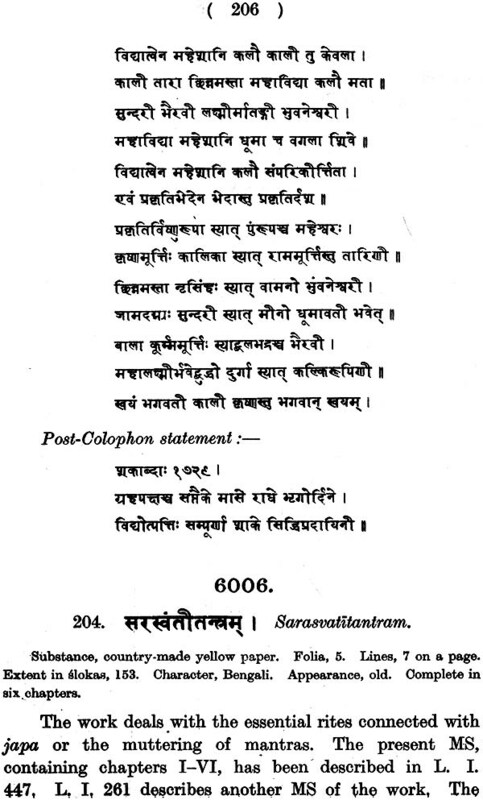 There the word 'Udgitha' has been derived as Ud, gi and tha , 8ama from Sa and ama, The derivation is not from roots, but from the syllables constituting the word. 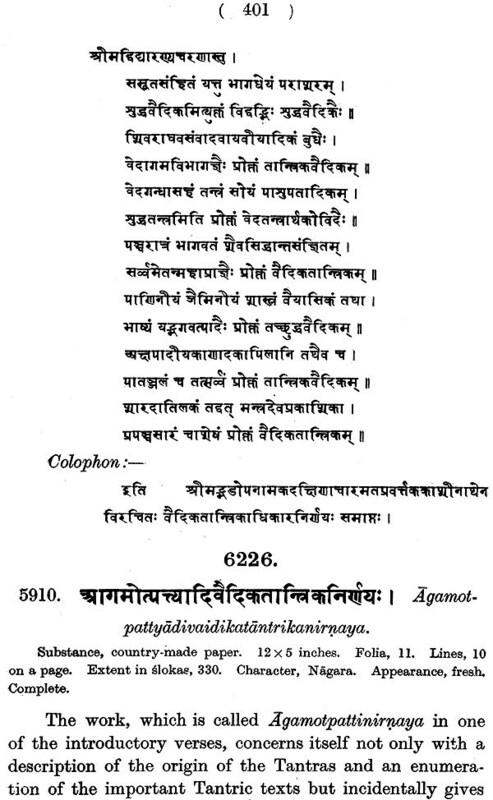 Another example I will give from the Samhitopanisad of the Aitareya-Aranyaka. 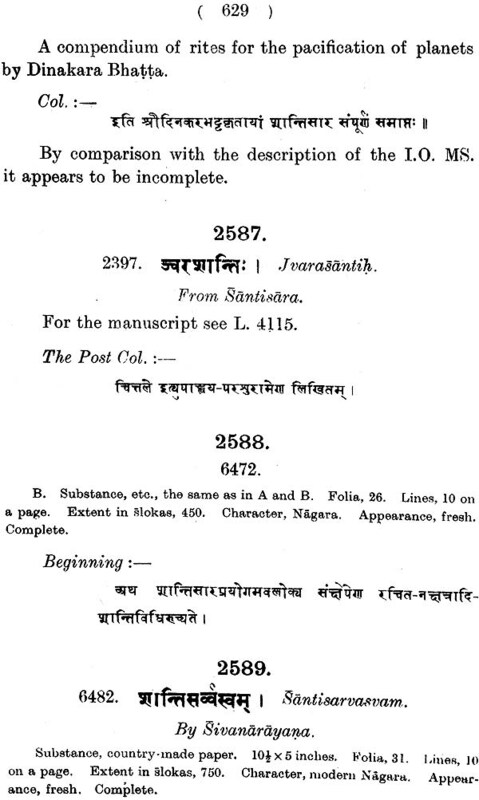 It embodies the speculation of two or three families of Rsis about samhita or union, but the words and forms employed were all later utilised in grammar. 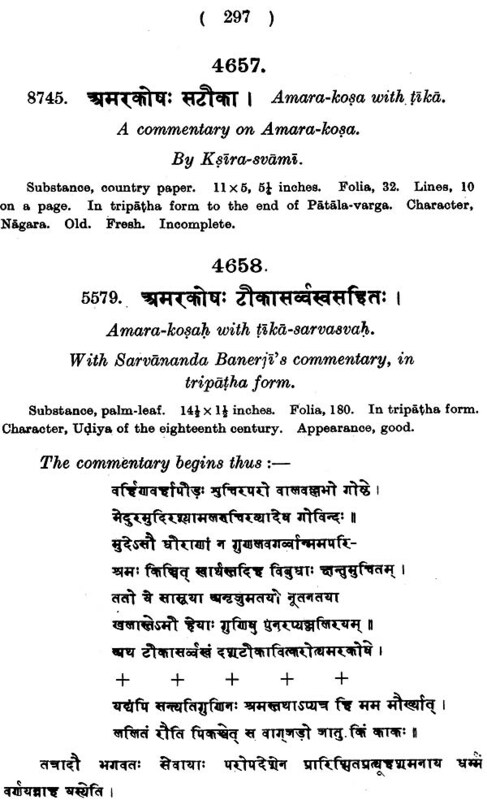 The words purva-rupam and uttara-rupam or pare-rupam are still used in the Sanskrit schools at Benares in explaining samhita or sandhi, Panini often says para-rupa- eka-desah or purva-rupa-eka-desah that is, the purva-rupa and the para-rupa combined sometimes leave the purva- rupa alone or the para-rupa alone. 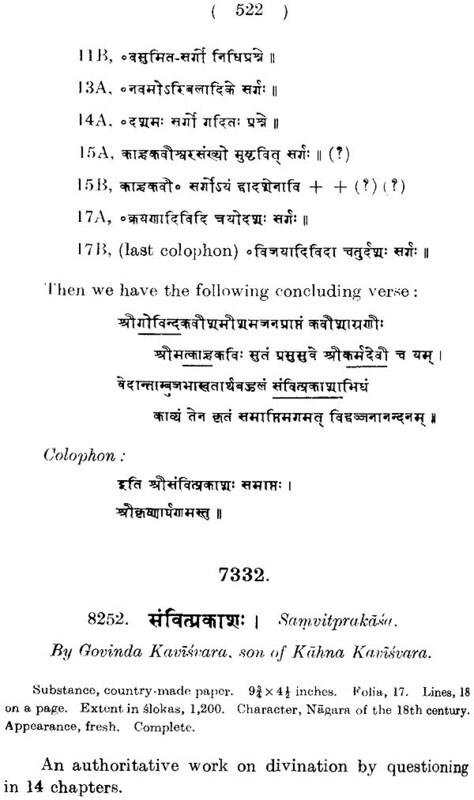 The last letter of the first word is called purva-rupa and the first letter of the second word is called uttara-rupa and the space between these two is samhita. This is purely grammatical sandhi. The word nirbhuja-vaktra means those whose mouths utter samhita or sandhi. This is very simple but the dwarfish Mandukeya (a Rsis ) says, that is all right. 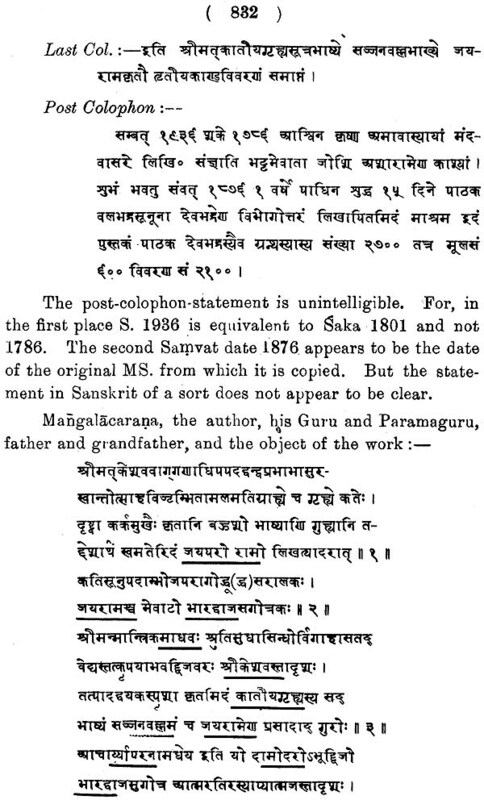 The last letter of the first word is purva-rupa and the first letter of the second word is uttara-rupa and the space between these two by which sandhi is produced, pitches are determined and the time is divided, is samhita. The former opinion gives the name of samhita to the space only but the latter says, no, the space is not sandhi, it is the change of pitch and the change of time that is sandhi. This is an advance on the theory of the nirbhuja-vaktra. 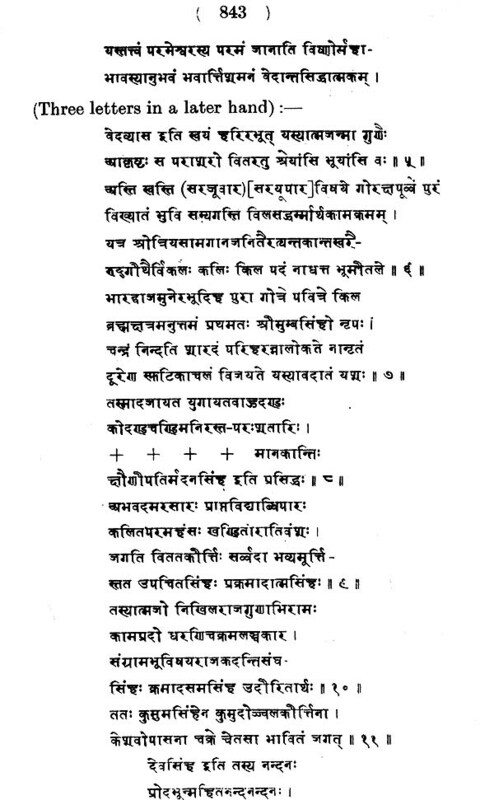 In the same brahmana or paragraph another advance is proposed by a third Rsi who says that the equation of the pitches is sandhi. Thus after defining sandhi the work proceed to give the secret of speech. Consonants are prthivi, the sibilants are atmosphere and vowels are heaven. The consonants are fire, sibilants are air and vowels are the sun. 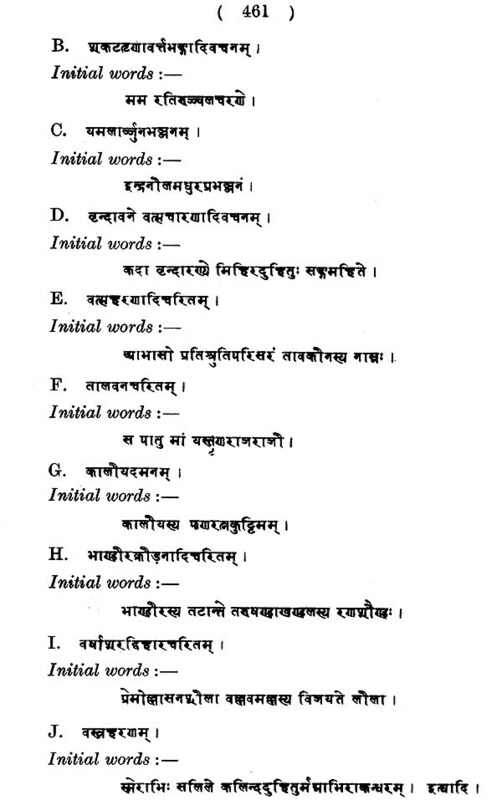 Consonants are Rg-veda the sibilants are Yajur-veda and the vowels are Sama-veda. The consonants are the eyes, sibilants the ears and the vowels the mind. The consonants are prana, sibilants are apana, and vowels are vyana. This human body is a divine lyre just as there is a lyre among men. Just as a human lyre, it has a head, it has a belly, it has a tongue and the strings are its fingers. Both the lyres have their consonants, their sibilants and their vowels and both are covered with a skin full of wool. All this shows that the alphabet was in the making when this work was composed. 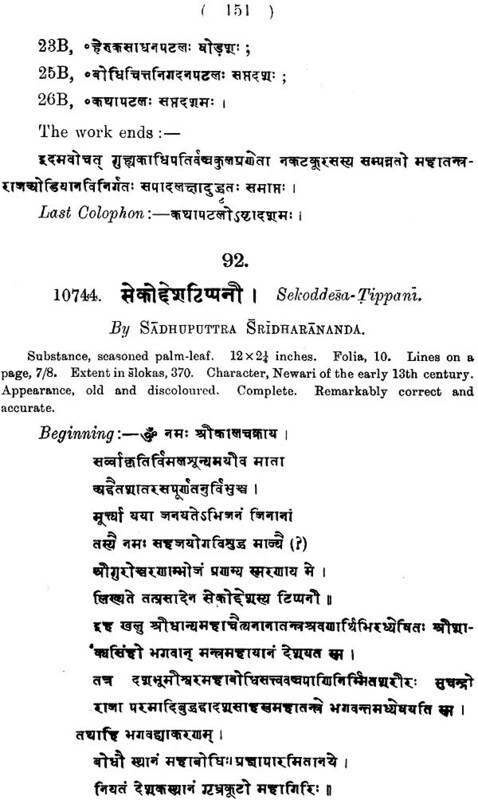 It treats in the last paragraph the Samhitopanisad covers the whole field of the letters of the alphabet, the change of dental sand n into cerebral s and n and of the changes which letters undergo when they come together, i.e., it covers the whole field of the Vedanga Siksa, which has ceased to be a separate subject of study since the advent of Panini who has included it in his grammar. 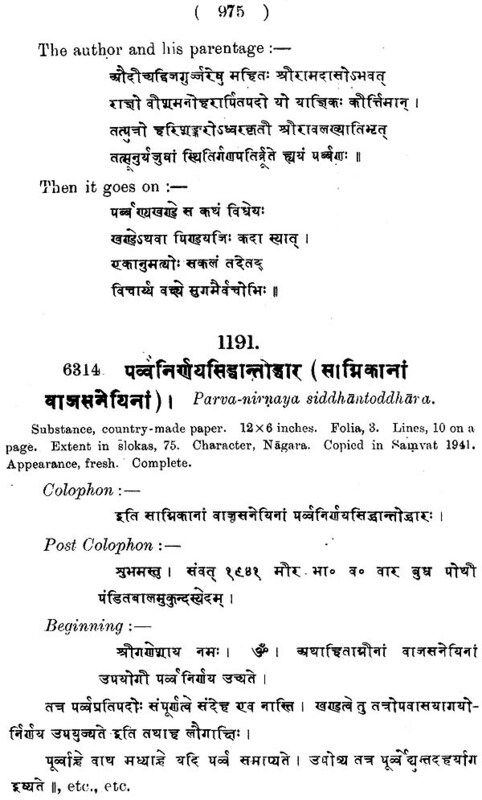 So it may be taken for granted hat the Samhitopanisad represents an early speculation in grammar. 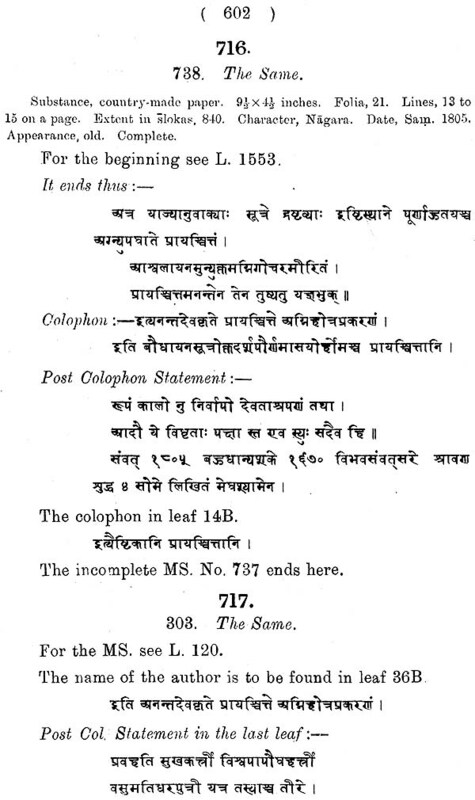 I have hitherto, spoken only of the Samhitopanisad of the Aitareya School. 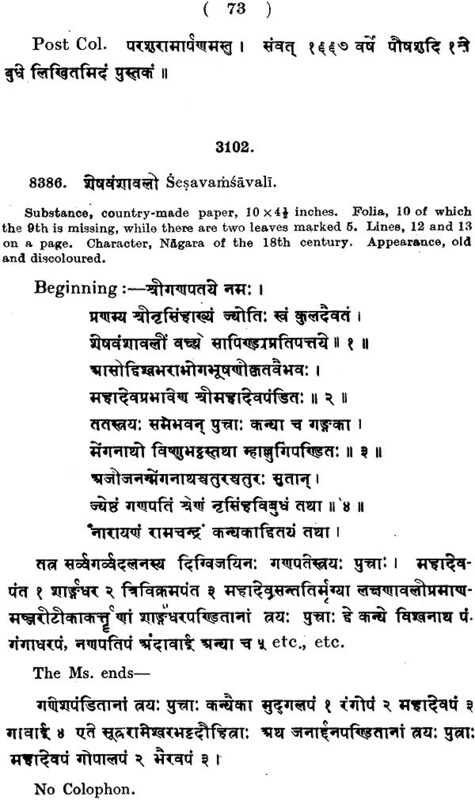 The Kausttaki Brahmana has a Samhitopanisad, But it is much shorter. 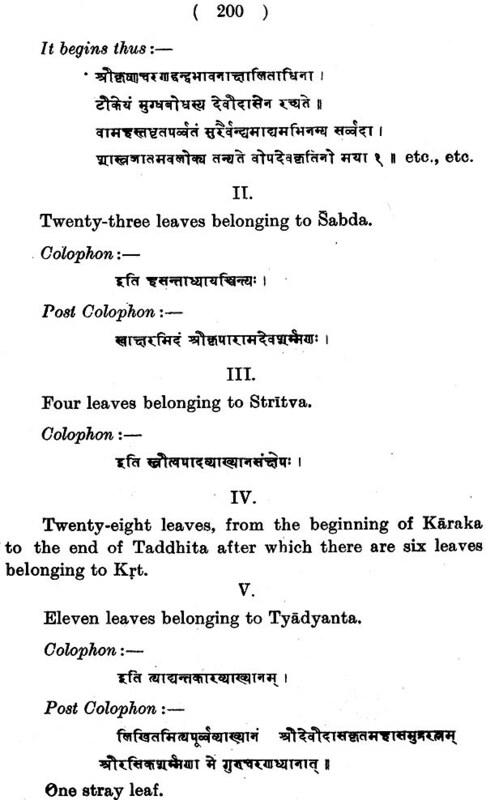 But the Samhitopanisad of the Taittirtya Aranyaka is more systematic. It speaks of Siksa first as consisting of letters, vowels, time in pronunciation, the effort, the equilibrium of pitches and samhita and then goes on with the Samhitopanisad, drawing similes from the phenomena of nature, from the human body, and So on. 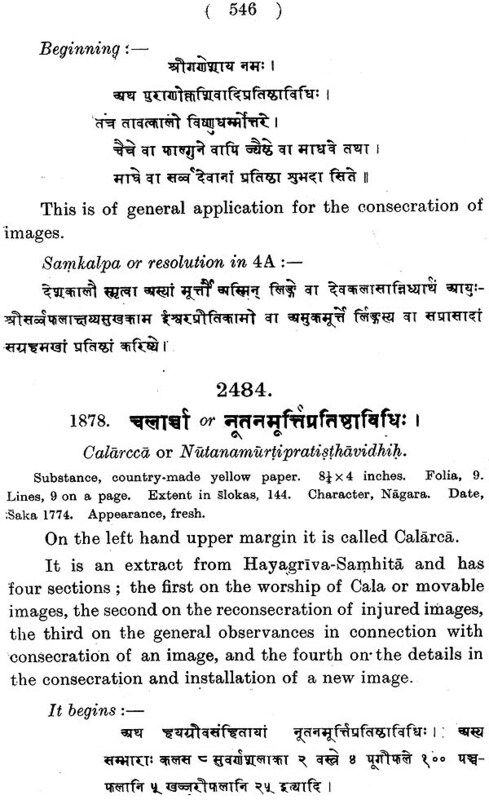 There is a Samhitopanisad of the Sama-veda (see our Catal. L312). 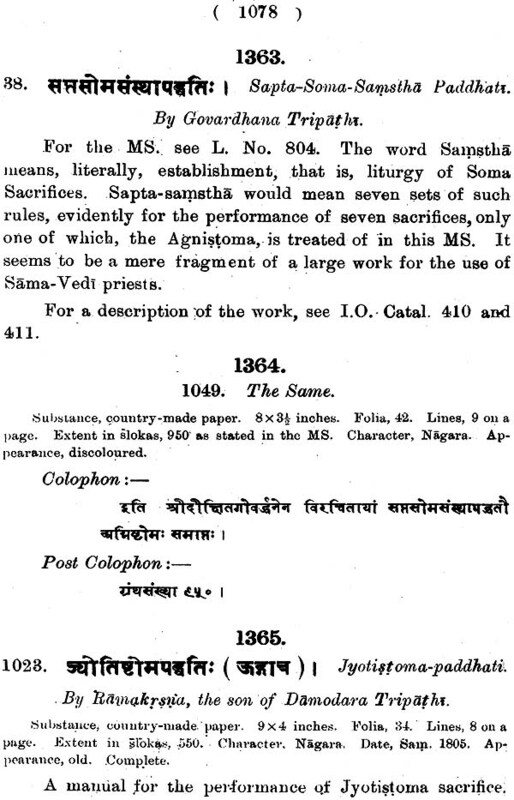 The Catalogue of the Adyar Library says that there' is a Samhitopanisad for every veda, It deals with sandhi. At the time of his sudden and regretted death in November, 1931, Mahamahopadhyaya Haraprasad Shastri had seen the whole of the body of the present catalogue in proof in various stages of progress. He had given print order up to page 448 (No. 5544). He had seen a third proof up to page 480 (No. 5577), and had also seen and corrected galley proofs till the end of the work, pa.ge 633 (No. 5803). 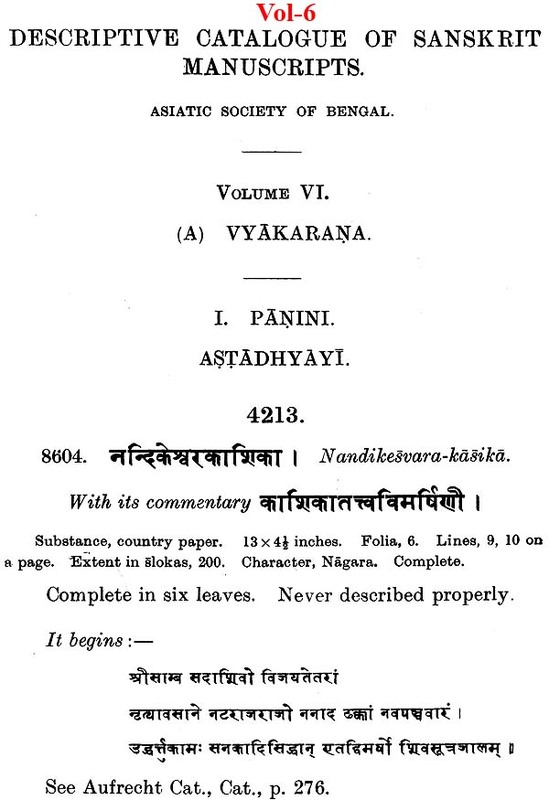 It became incumbent on the Society not only to ensure the completion of the volume but to make arrangements for the continuation of the work, that is, the completion of the entire catalogue, for which, as explained by the Shastri in his Preface to the previous volume, the rough materials had been prepared during the years from 1911 to 1920, to cover another seven volumes, describing about 6,500 further items. In March of 1933 Mr. Chintaharan Chakravarti was entrusted with the immediate task of seeing through the press the remaining part of the present volume. The principle was laid down that in this final part the substance of the Shastri's work should not be interfered with nor the system hitherto followed be modified. 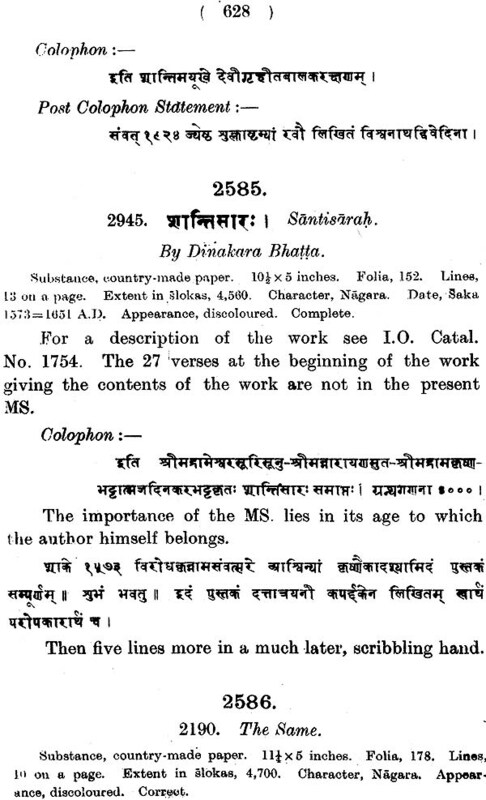 A verification of the copy by consultation of the works described was however to be undertaken and" correction of facts, wherever necessary, to be made, as it was the Shastri's habit to defer verification with the MSS. to the last and then to embody in the final proof whatever changes or additions he deemed necessary. Except in this respect the Shastri's original had to remain without modification. The indexes for the volume have been drawn up by Mr. Chakravarti, one of titles and one of authors. He has also added a concise introduction. 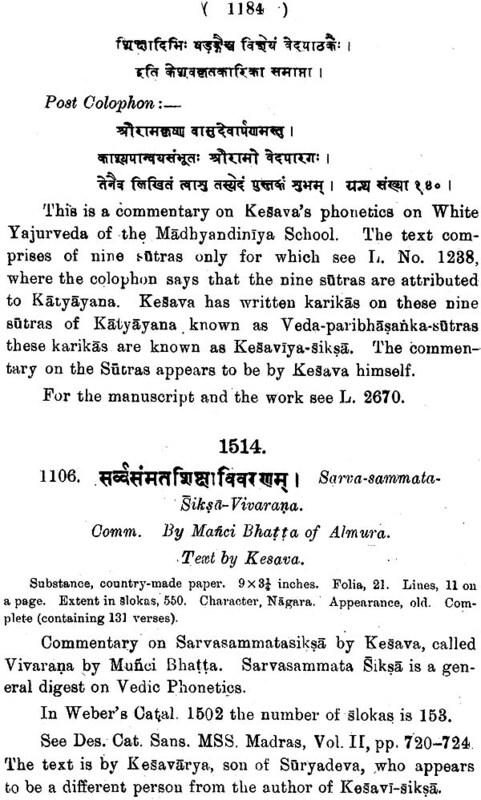 The Shastri left copy for part of an elaborate preface, in the manner of his preface to the previous Vyakara1;la volume, giving a survey of the Kavya literature of India, mainly with reference to works dealt with in the present volume. This preface which was written pari passu, as the sheets of the catalogue were printed, has not been completed, but reached towards the end of the 3rd of the 7 sections (Prose Romances) covering slightly over one- half of the subject-matter dealt with in the volume. This copy has not benefited from the final re-vision which its author would have given it when passing it through the press, It has therefore been decided to publish this fragment separately for what it is worth as a memento left by the late scholar. Instead of it Mr. Chakravarti's preface gives in briefest form a summary of the collection described in the volume, drawing attention to various interesting aspects. It is a tragic coincidence that, in the last preface written by the Shastri himself in the present series of the catalogue, he referred to his lifetime as "drawing rapidly to a close". The statement has become a sadly true prophecy. The Asiatic Society of Bengal now issues the volume to the world of Sanskrit scholarship with feelings of profound respect and warm affection for its author. The importance of the Museum of the Asiatic Society consists in its huge collection of Tantrika Manuscripts, which were systematically arranged by Mahamahopadhyaya Haraprasad Shastri, and later edited by Professor Chintaharan Chakravarti. Both the "right" and the "left" Tantras constitute a vast corpus of esoteric literature composed mainly in easily understandable Sankrit verses by those who practised the rituals. 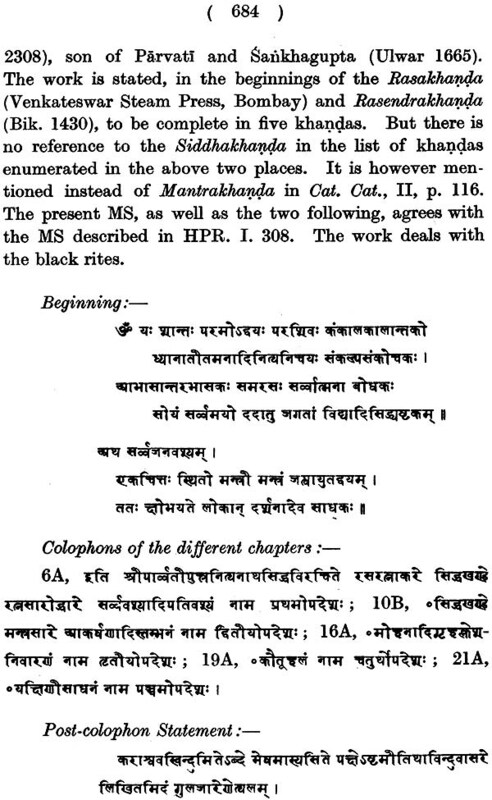 The perusal of the Catalogue will enable the scholars to realize the extent of Brahmanical acculturation in ancient and medieval times, to locate the main centres of Tantrika worship, and to ascertain the extent of antinomian practices in the underworld of Hinduism. Iconographical data in the Tantras are also of considerable importance. This volume, therefore, is a mine of information concerning deities, cults, and deviant practice. I hope that the readers of this volume would enjoy it. 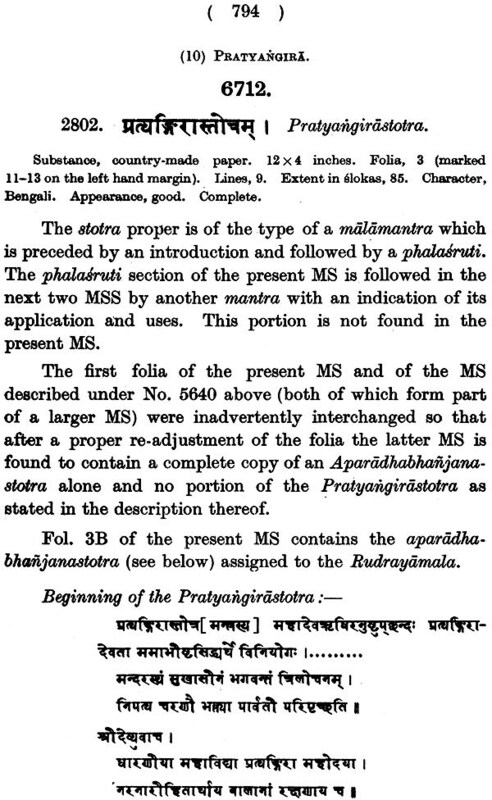 The preparation of the Descriptive Catalogue of the Sanskrit Manuscripts in the collection of the Royal Asiatic Society of Bengal was undertaken by the late Mahamahopadhyaya Haraprasada Shastrl, M.A., D.Lit., C.I.E., F.A.S.B., in a series of fifteen volumes of which the first six dealing with the Buddhist MSS., Veda, Smrti, History and Geography, Purana and Vyakaral)a, appeared during his lifetime. 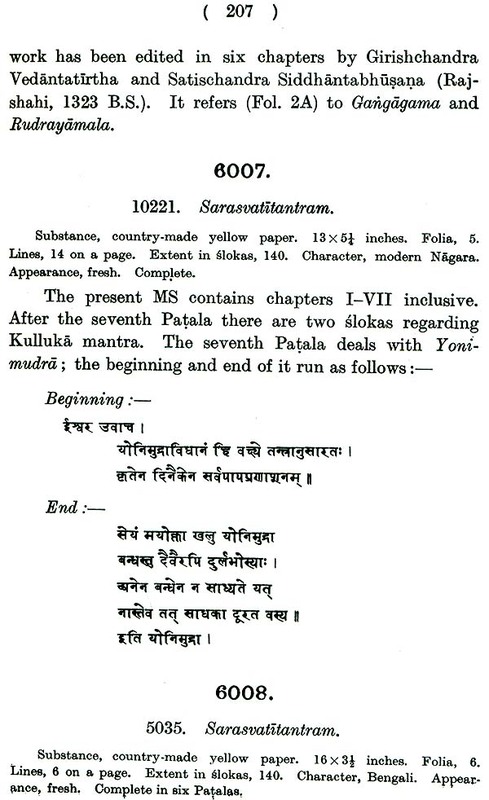 The seventh volume describing the Kavya MSS. was published in 1934 three' years after his death, of which the complete MS. was prepared and almost wholly seen by him through the press. 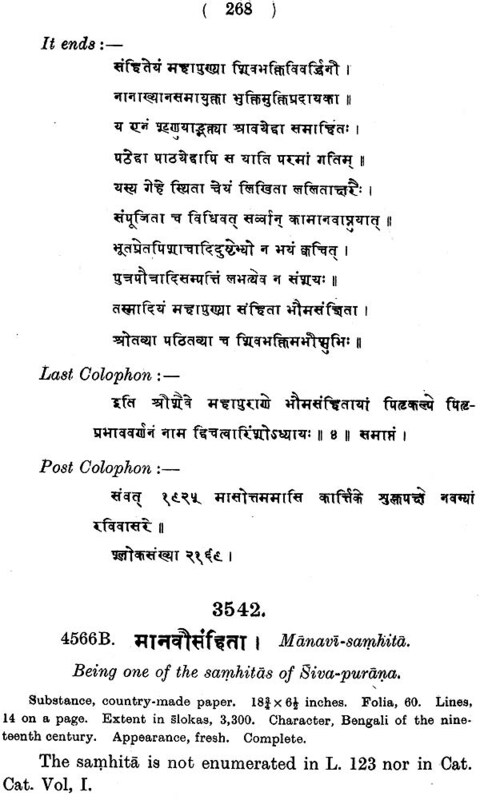 The late Mahamahopadhyaye, left in addition the entire MSS. 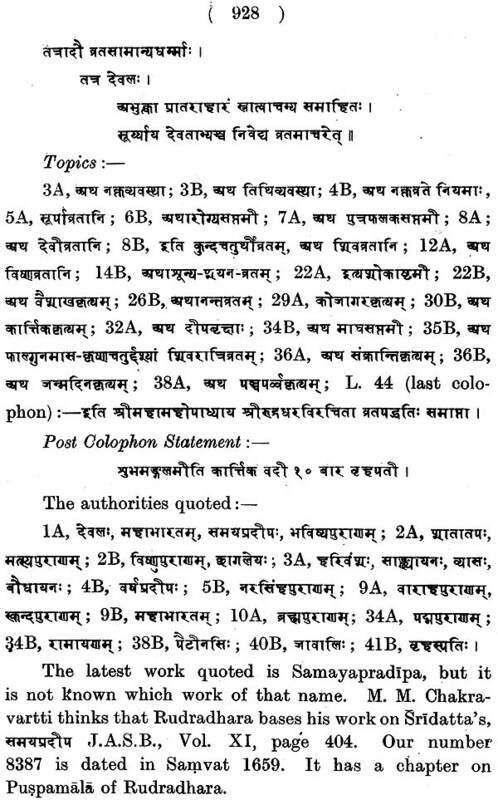 of the remaining eight volumes of the Catalogue which he divided into the following groups, namely, Tantra, Philosophy, Jyotisa, Jaina, Vernacular, Vaidyaka, Miscellaneous, Addenda and Supplement. The materials left by the Mahamahopadhygya Shastri were complete and systematically arranged in the form of slips. 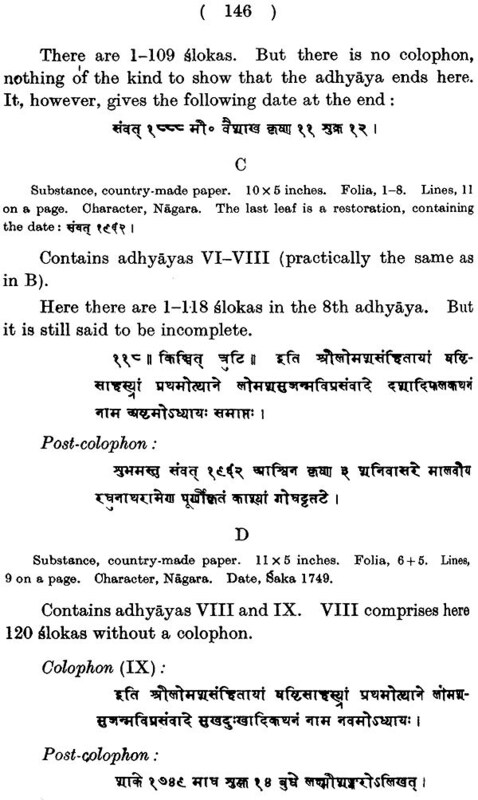 They required however to be checked and verified with the various manuscripts described-a task which the late Mahamahopadhyaya could not finish, as it was his habit to defer the verification till the last and then embody the necessary corrections in the final proofs. 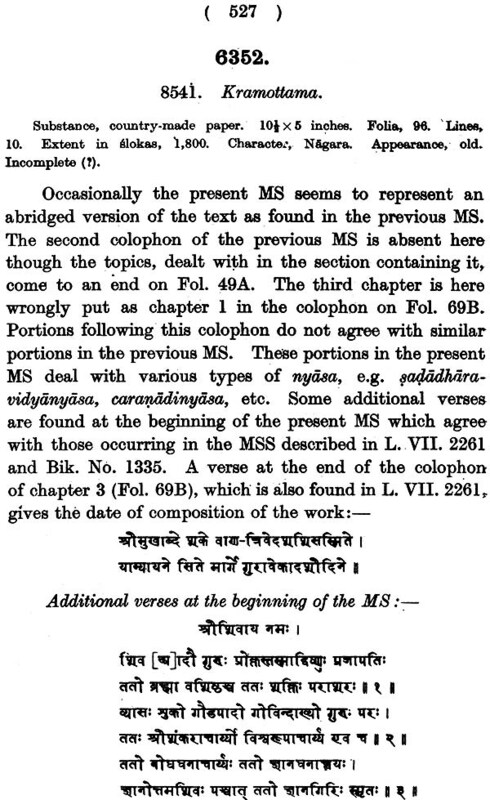 This work of verification was entrusted to Prof. Chintaharan Chakravarti, M.A., in 1933 by the Council of the R.A.S.B. who has thoroughly checked the materials and made corrections wherever necessary. Prof. Chakravarti has made some additions and has omitted portions which he considered unnecessary and redundant. He is also responsible for seeing the entire proofs through the press. In the work of verification and correction he has been ably assisted by Pandit Aghorenath Bhattacharyya, the Head Pandit ill charge of the Society's Sanskrit Manuscripts. The present Part deals with 648 MSS. on Tantra. 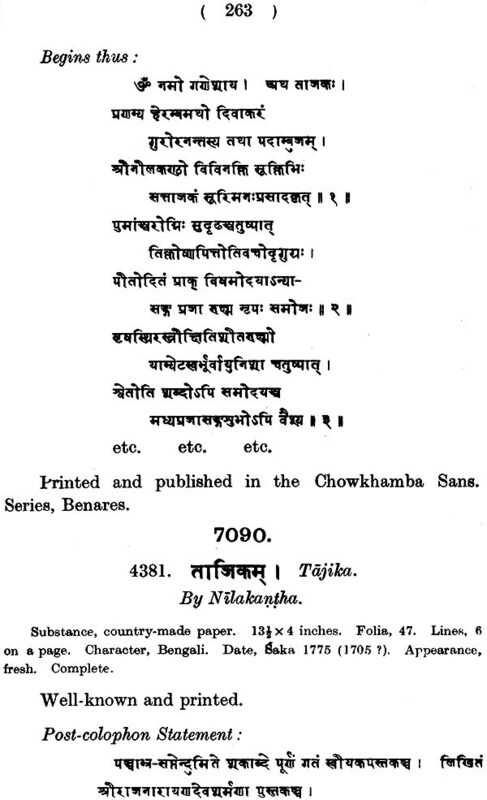 Originally it was the idea of the late Mahamahopadhyaya to devote one volume to the entire collection of manuscripts on Tantra numbering a little over one thousand, and the Society planned its publication accordingly. But unfortunately the period of quiescence that" intervened and held up the publications of the Society during the last few years prevented the issuing of any further Volume of the Descriptive Catalogue after the appearance of the last Volume in 1934. 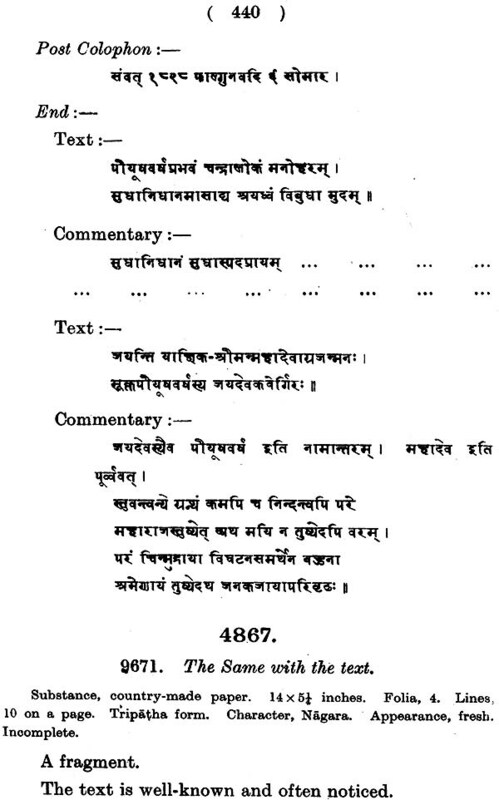 It has been thought desirable therefore that instead of waiting for another year for the completion of the entire work on the Tantras, the Volume might be issued in two Parts-Part I describing 648 MSS. and numbering 608 pages, and Part II dealing with the rest of some 500 MSS. and of approximately the same size. Comprehensive and general works (Nos. 6166-6298). Rituals of different aspects of Siva, Visnu. E.	Works on stotra and kavacas; besides an introduction calling attention to the salient features of the MSS. described, a List of Contents, Abbreviations based on the principles adopted in the Catalogus CataIogorum, Addenda and Corrigenda and an Index to the entire Volume. The Society is thankful to Dr. Baini Prashad, D.Sc., for taking a keen interest in the early publication of the work and to Dr. S. K. Chatterji, D.Lit., the Philological Secretary, for advice. The Press Clerk, Mr. D. K. Das, has been very helpful during the progress of the work through the press. To Measrs. P. Knight and N. A. Ellis of the Baptist Mission Press, the Society is very grateful for giving all possible assistance in expediting the printing of the work, and for their whole-hearted co-operation, which has made it possible to issue this Part of the Volume within the present year. 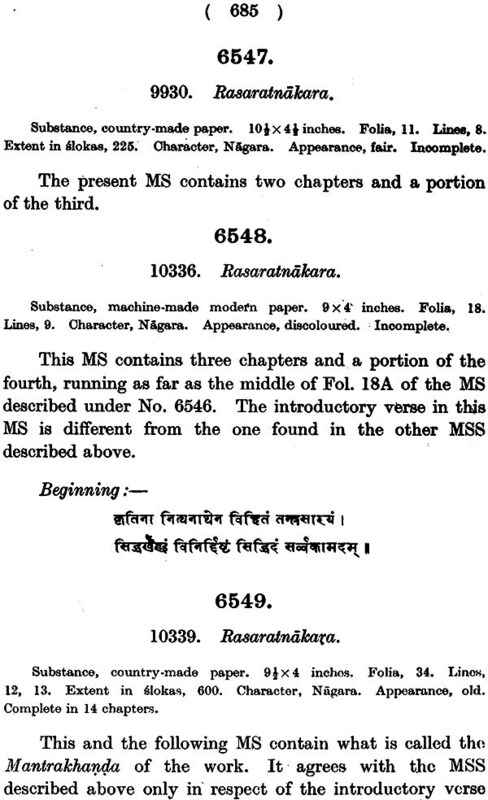 The Descriptive Catalogue of the Sanskrit Manuscripts in the Collections of the Royal Asiatic Society (Volume VIII, Part II) is a comprehensive catalogue of Tantra Manuscripts, which was prepared by Mahamahopadhyaya Haraprasad Shastri, and later revised and edited by Professor Chintaharan chakravarti. 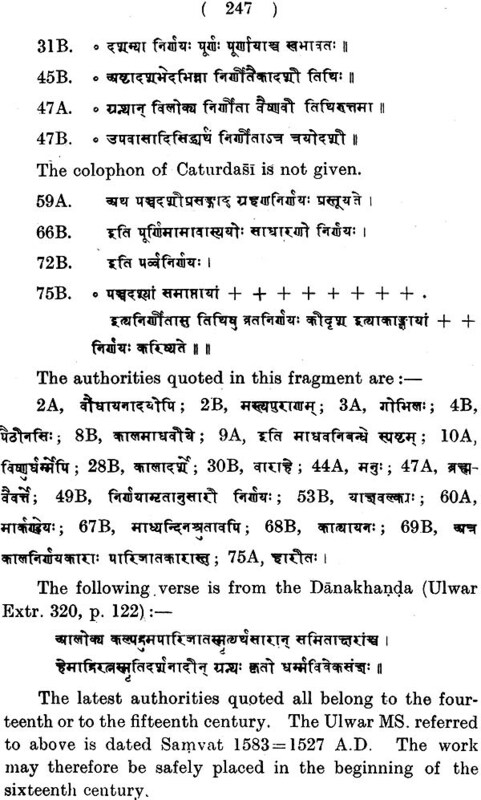 The oldest Tantrika work in this collection is Kubjika Mata (5804) which is written in later Gupta characters. 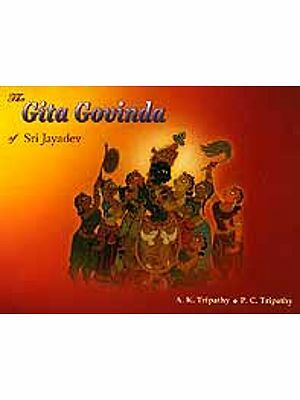 This volume contains a descriptive catalogue of numerous works dealing with particular deities, rites, mudras and yantras and stotras and kava cas of different deities. 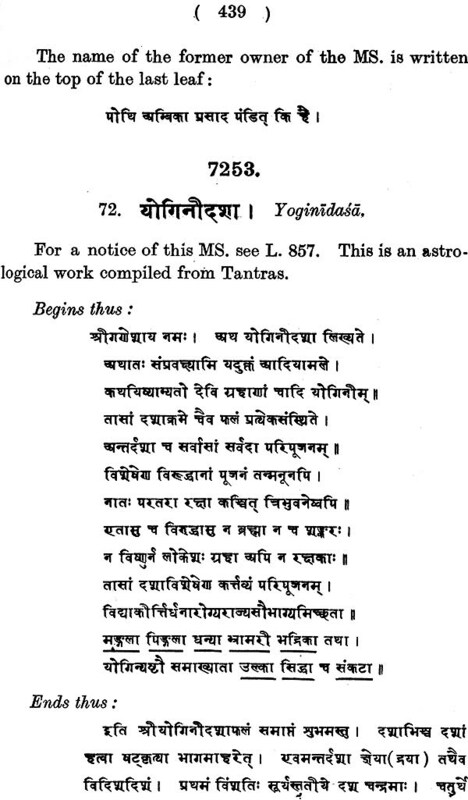 From the well-written Introduction of Professor Chintaharan Chakravarti, it appears that Tantra was, and perhaps still is, an integral part of the religious culture of India, and also that Nepal, Mithila, and Bengal were its three important centres. Tantra may be studied from the iconographic, sociological, and anthropological points of view which would throw some light on social history of the regions in which the Tantras flourished. Volume VIII, Part II of the Descriptive Catalogue is, therefore, a highly valuable work. The present Catalogue is based on materials left by the late Mehamabopadhyaya Haraprasad Shastri, whose widely comprehensive erudition in the various fields of Sanskrit literature and Ancient Indian History and Culture is well known. The present editor was entrusted with the task of revising and seeing through the Press the late MM. Shastri's notes. These consisted of slips containing descriptions of the various MSS., which were in the handwriting of MM. Shastri's assistants working under his direction. The present editor as far as possible did not disturb the notes as he received them, but where discrepancies were revealed on actual comparison with the MSS. themselves, these were rectified. Quotations in the descriptive slips were verified, and sometimes these were curtailed or elaborated as circumstances connected with the importance or otherwise of the work or the MS. demanded. The present editor also compared MSS. 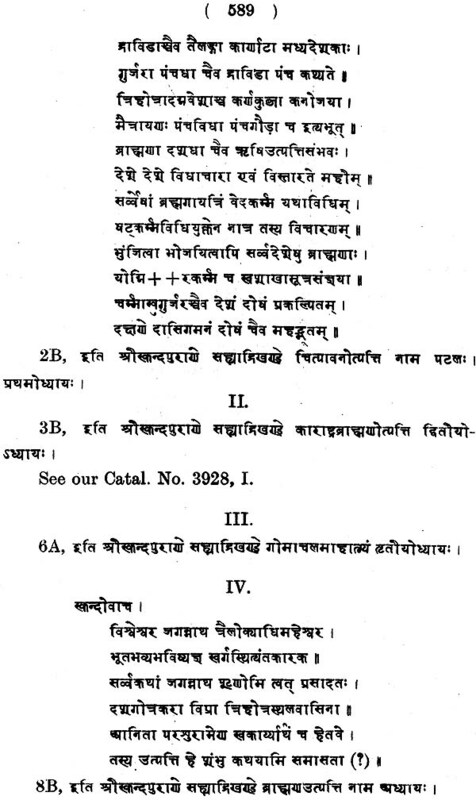 of works in the Government Collection with others in the Indian Museum, Society's own collection or in that of other institutions (e.g., the Banglya Sahitya Parisad, the Sanskrit Sahitya Parisad and the Sanskrit College) which were accessible to him, with a view to make the descriptions full and complete. 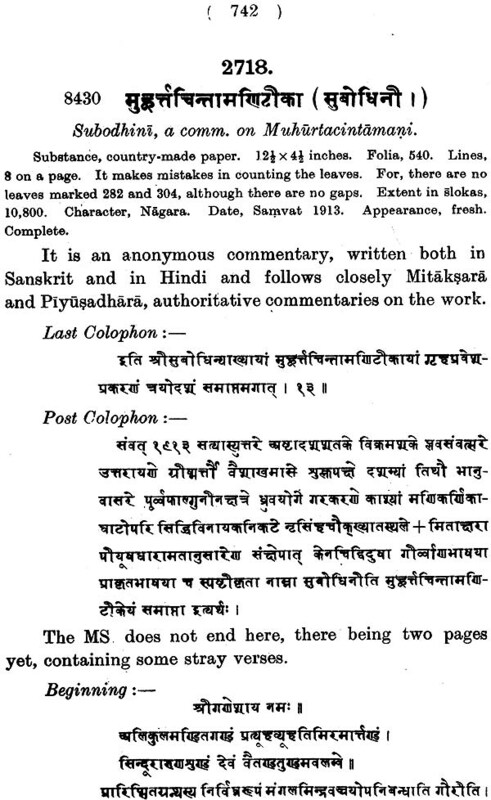 Apparent copyists' mistakes in the Sanskrit of the MSS. have been silently corrected in the Catalogue. 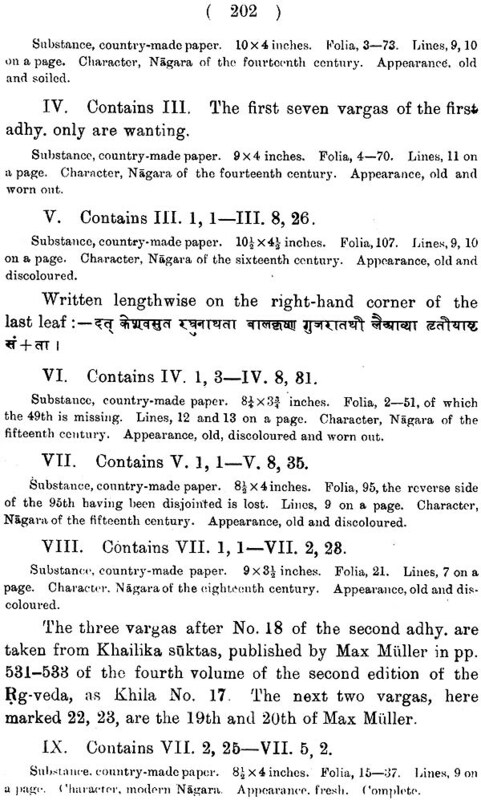 A uniform system of plus signs, simple and square brackets, has been followed in the present catalogue to indicate illegible or obscure aksaras and redundant words or aksaras, as well as emendations and allowable conjectures made by the editor to make clear a quoted passage. About a dozen MSS. belonging to subjects other than the Tantra were through some inadvertence included within the Shastri slips, and these have duly been taken out. A few nevertheless escaped the attention of the editor as the work was printing: these have been sorted out in the Addenda et Corrigenda printed at the end. 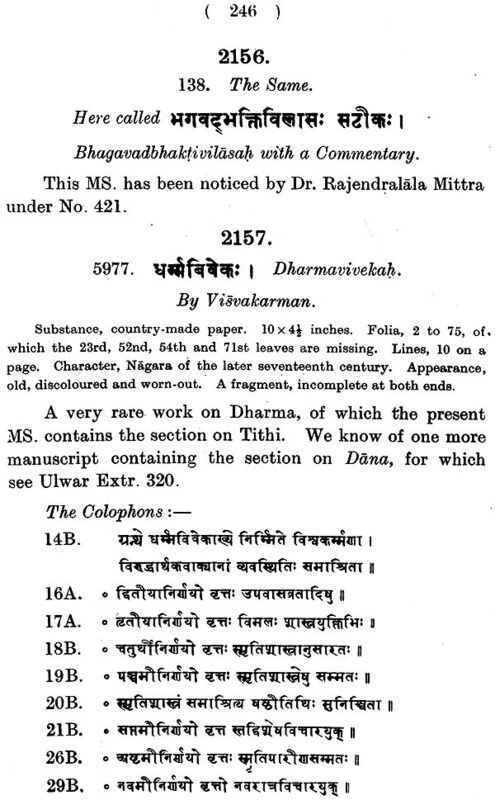 On the other hand, the present editor has included descriptions of some fifty newly acquired Tantra MSS., occurring within the present Collection, for which no materials left by MM. Shastri were available. Also cross-references have been given to a few Tantra works which have been inadvertently included in the other Catalogues in the Series. 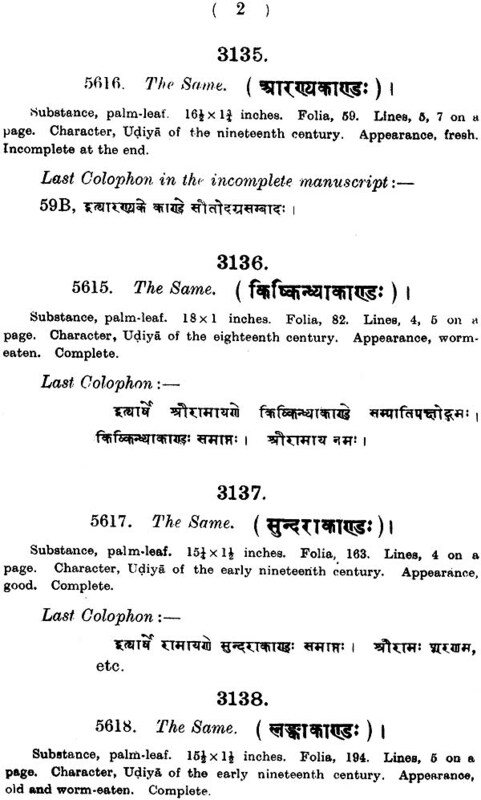 A few works which were not identified in the slips left by MM. Shastri have been identified by the present editor in this Catalogue. The Collection had some MSS. of the same texts split up into two parts with separate numbering, and through inadvertence this was not detected. The present editor has combined the split MSS. into the single ones that they really are, and has entered them as single items. The present editor in revising and seeing through the Press this Catalogue, which owes its inception to the labours of MM. Shastri and can be said to have been prepared by him, has been actuated by a spirit of respect and reverence for the memory of the great scholar from whom he received his inspiration in studying, cataloguing and editing Sanskrit MSS. The MSS. described were very precious in the sight of the late MM. Shastri, and the present editor has taken pains that their special features be brought to the notice of scholars. He has for this purpose compared these MSS. with printed editions and descriptions of other MSS. of the same work from other Catalogues. He only hopes that the Catalogue as revised by him under the direction of the authorities of the Royal Asiatic Society of Bengal will be worthy of the great scholar who would have published it himself, had Fate spared him to us for a few years more. The problem of arranging the MSS. was a difficult one. 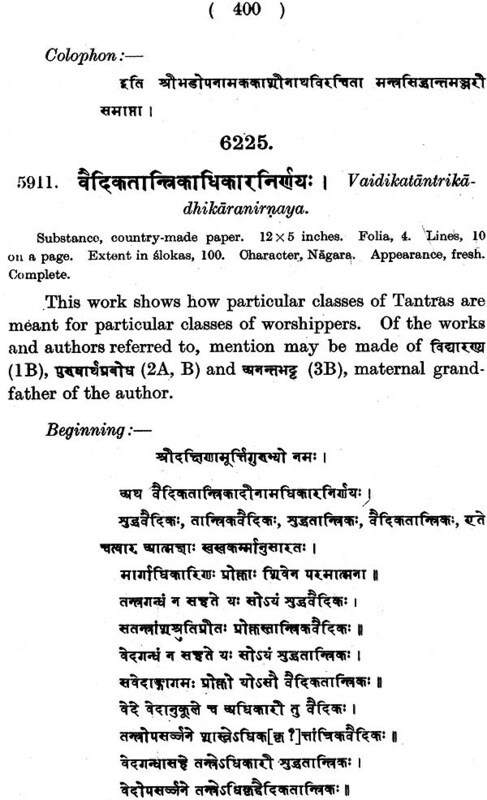 The importance of a proper classification of the Tantras for a correct appreciation of a particular work in its true perspective cannot be emphasised too strongly. It is evidently for this reason that enough stress has been laid on this matter in the Tantras themselves, which definitely forbid one sect following the prescriptions of another which are positively harmful to the former. But the traditional principles of classification are too intricate and obscure to be applied to a catalogue. They should form a special subject of study by themselves. It is all the more distressing to find that confusion either spurious or constitute a curious hotch-potch of the viewed of different sects . Under these circumstances a rough arrangement based on tradition, according to the deities dealt with, seemed to be most satisfactory and this has been followed in two of the three broad formal divisions into which the works have been classified at the first instance. Under ORIGINAL TANTRAS come works, put in the form of interlocutions between divine beings or sages, though some of these are apparently very late and of not much importance. 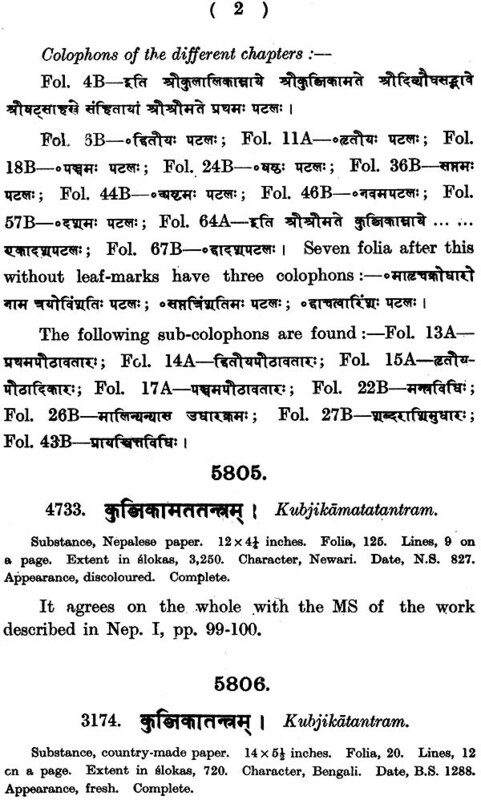 Under DIGESTS have been grouped compilations attributed to. historical personages though there are some which are anonymous including those the names of the authors of which could not be traced owing generally to the imperfect condition of the manuscripts. The Digests have been subdivided into four sections in accordance with the subject-matter of the works. Under STOTRAS fall hymns either associated with original Tantras or ascribed to particular authors. These have been arranged according to the deities eulogised. This is the first descriptive catalogue of the vernacular MSS. 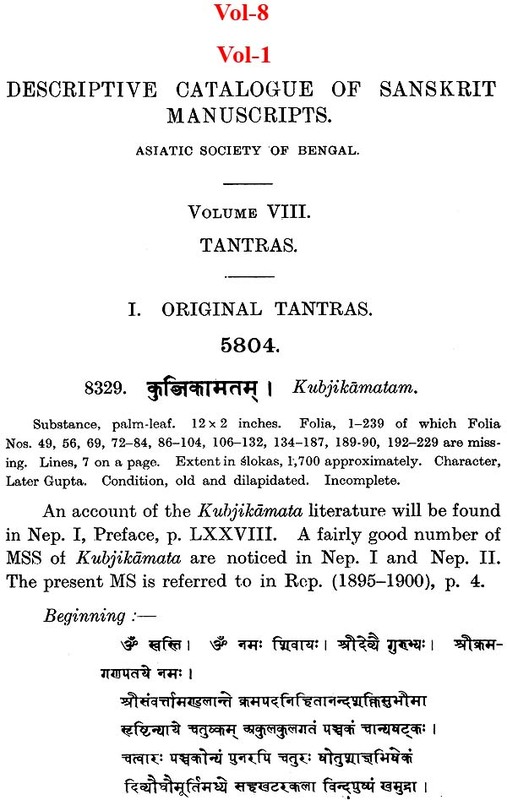 in the possession of the Royal Asiatic Society of Bengal. In this connection it will be quite a propos to give a short account of how these MSS. came to be collected and preserved by the Royal Asiatic Society of Bengal. Mahamahopadhyaya Haraprasad Sastri writes as follows :- " Formerly no care was taken of these MSS., and in consequence several of them either were lost or destroyed. This neglect gave rise to a feeling of discontent. Maharaja Ranjit Simha, the Lion of the Panjab, had a priest named Madhusudan who had a rich collection. His son Radhakisan, who was on terms of great intimacy with Sir John Lawrence, wrote to him in 1868, impressing upon him the necessity of preserving these literary materials throughout India. Sir John Lawrence took up the idea and made arrangements with Provincial Governments for their collection and preservation. The Government of India made an annual grant of Rs. 24,000/- for the purpose. Bengal's share was Rs. 3,200/- which was made over to the Asiatic Society the Society on their part entrusted Babu Rajendra Lal Mitra vith expenditure of the allotted amount. 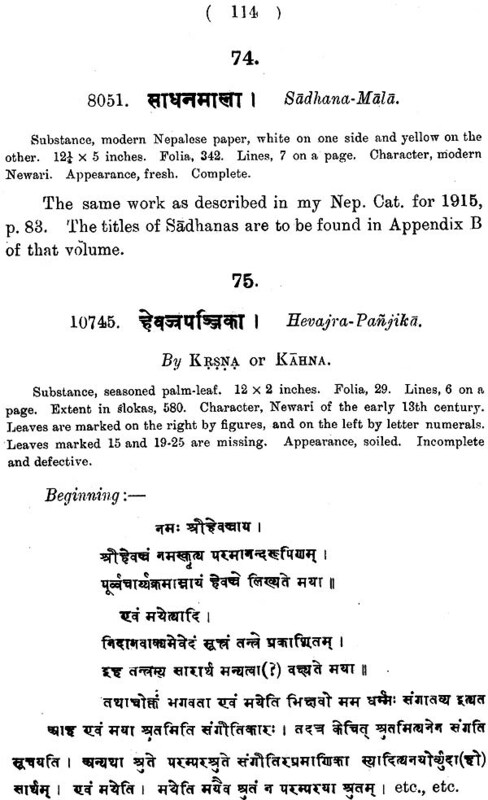 During his life-time Rajendra Lal spent it in the purchase of Sanskrit MSS. 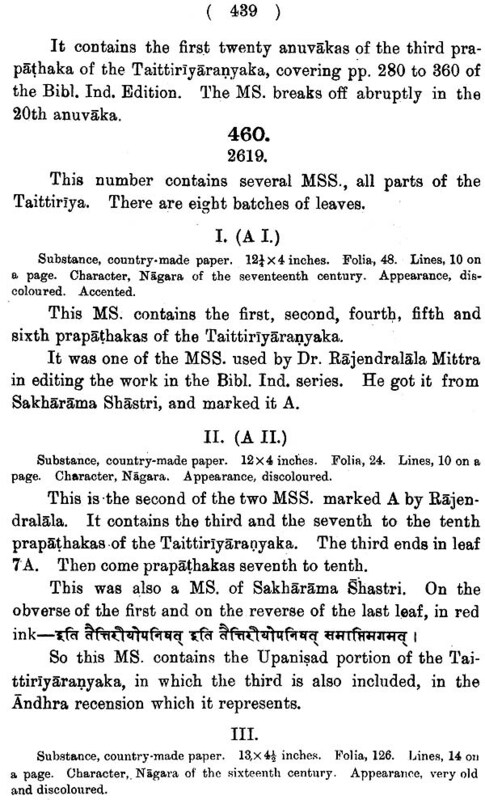 At that time the Society used to publish a list of the MSS. purchased, which also contained short notices of such MSS. as were collected from the various districts and villages “by the Pandits of the Asiatic Society." After the demise of Raja R1ljendra Lal Mitra, the responsibility for the search of MSS. 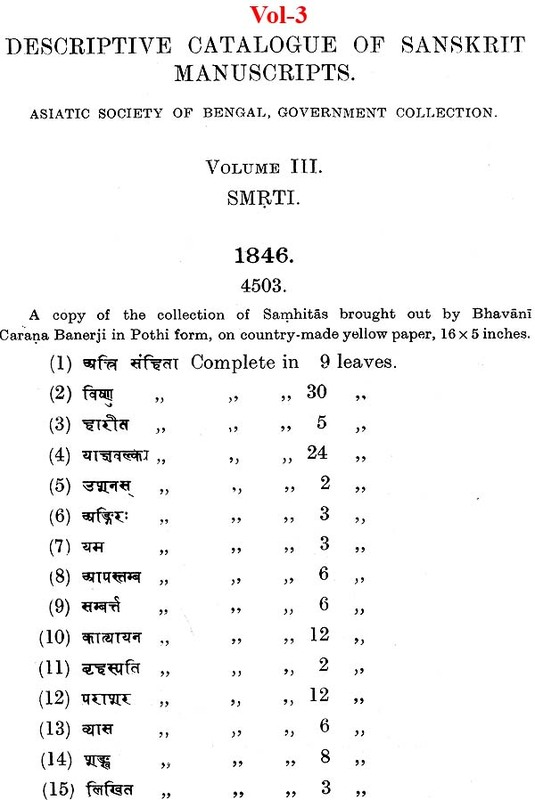 in Bengal, Bihar, Orissa and Assam devolved on Maharnahopadhyaya Haraprasad Sastri, who, when appointed Librarian of the Bengal Library, found therein a collection of Bengali MSS. He also found that many Vaisnava works were being printed. This included not only songs and Kirtans but many lives and histories as well. Even MM. 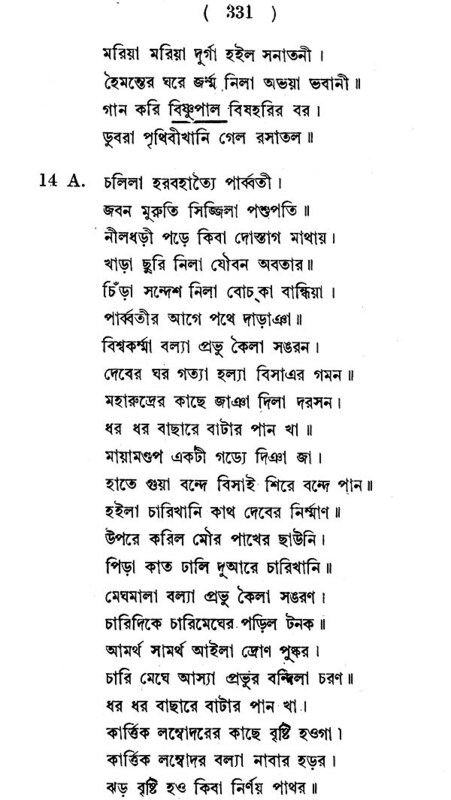 Sastri did not know at the time that there were so many poets and poetical works in Bengali. The success in his initial efforts encouraged him in his work. Thenceforward he began to make a vigorous search for Bengali MSS., and instructed the travelling Pandit under him to collect and purchase old Bengali MSS. Also. Thus went on increasing the stock of these works in the Library of the Society. 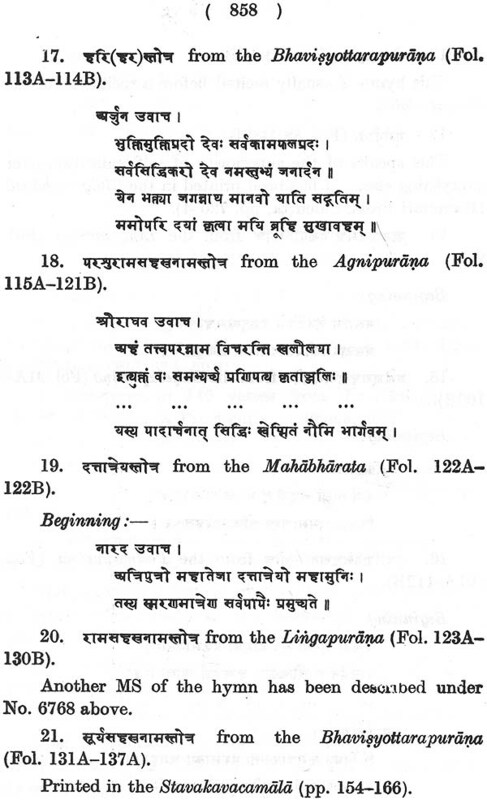 To begin with, the Pandits collected Manik Ganguli's Dharma-mangala. While MM.' Sastri was busy collecting MSS. 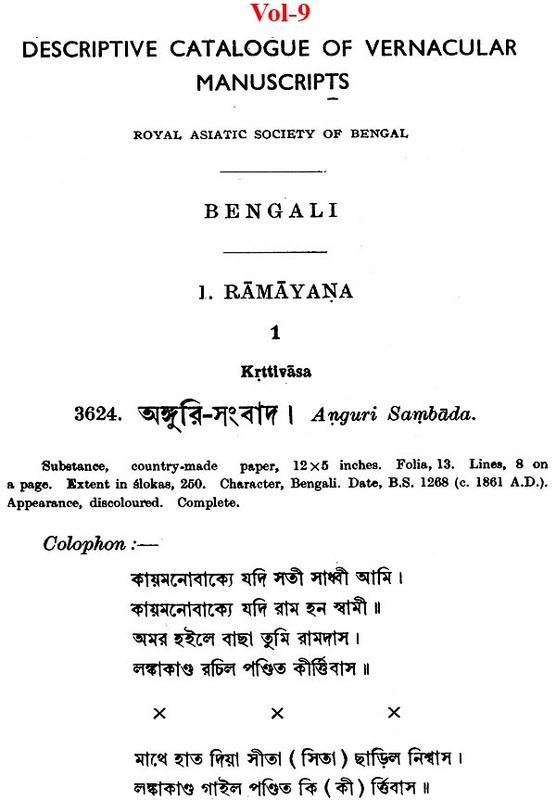 both Sanskrit and Bengali on behalf of the Asiatic Society, the late Rai Sahib Nagendra Nath Basu, compiler of the famous Bengali Encyclopeedia the Biswakosa, engaged himself in the same task. The collection of Mr. Basu is now in the Library of the Calcutta University, while that made by MM. Sastri; about 500 MSS. in number, is the property of the Asiatic Society (see Bangiya Sahitya Parisad Patrika, for Bengali' year 1321, Presidential Address of MM. Haraprasad Sastri). In his search for old Bengali MSS., MM. 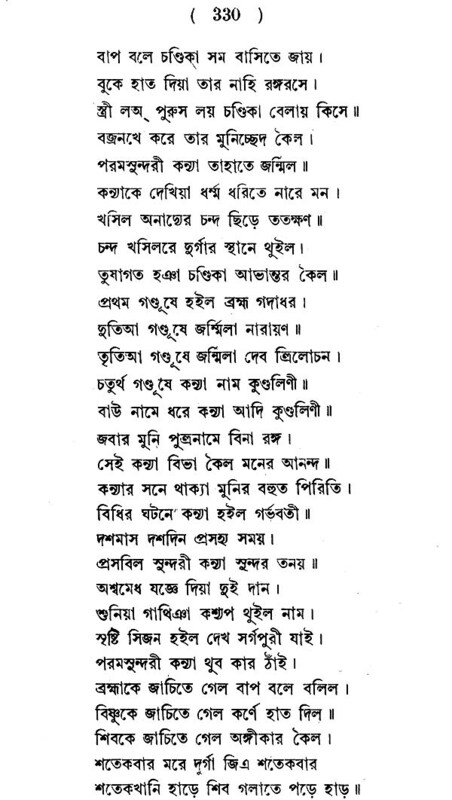 SastrI was to a great extent indebted to the then Head Master of the Victoria School at Comilla, the late Dinesh Chandra Sen (later Dr. Dinesh Chandra Sen, Rai Bahadur, Ramtanu Lahiri, Professor of Bengali Literature in the University of Calcutta). MM. Sastri himself bears testimony to this in these words: "The Head Master of the Comilla Victoria School, Babu Dinesh Chandra Sen, B.A. ; applied to the Asiatic Society for help in his work of writing a history of Bengali Literature, and the Society forwarded the letter to me, thinking that it might facilitate the search for MSS. in Eastern Bengal. 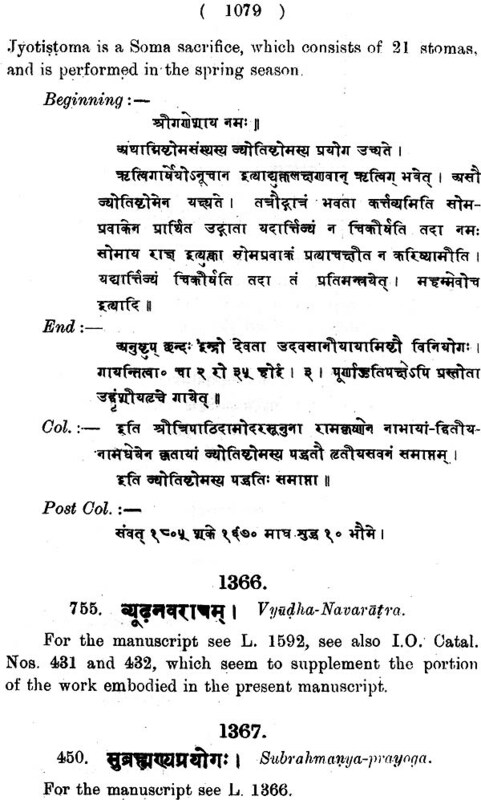 I placed my travelling Pandit Binod Bihari Kavyatirtha at the disposal of Babu Dinesh Chandra Sen for over a year, with the instruction to buy such MSS. as were recommended by Dinesh Babu. Dinesh Babu was allowed to keep the MSS. in his possession as long as he wished. With his assistance, Paragali Mahabharata, Chuti Khan's Aswamedha-parva and many other important MSS. were purchased (Bangiya Sahitya Parisad Patrika, as referred to above). 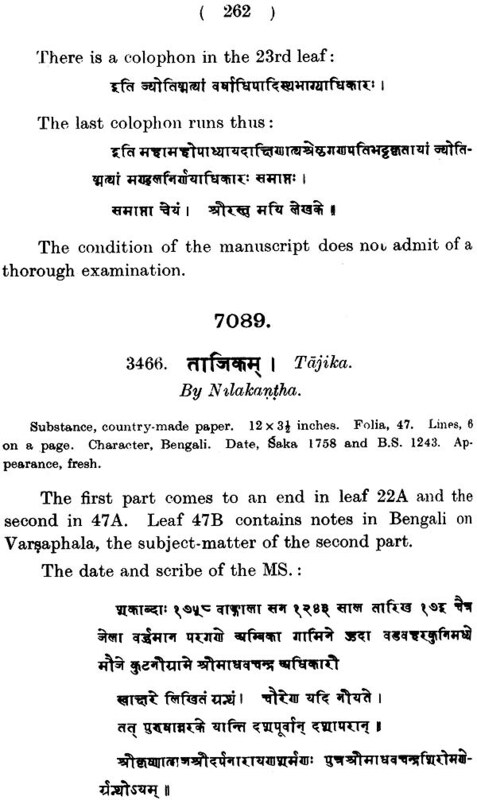 In this connection Rai Bahadur DInesh Chandra Sen says: “ The Asiatic Society of Bengal was at the time making vigorous search for old manuscripts; but no attempt was made to recover ancient Bengali MSS. 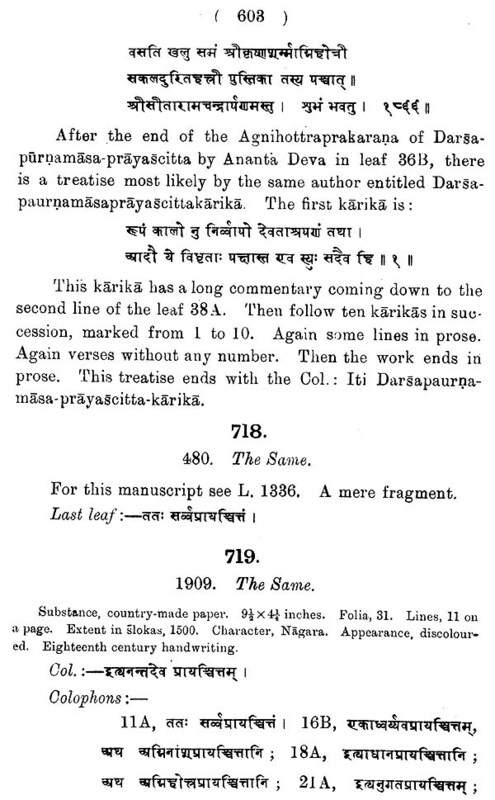 till I878, when Sir George Grierson pubIished the ballad of King Manik-candra in the journal of the Asiatic Society of Bengal in Deva-nagari characters with notes and an English translation. In I892 the Peace Association of Calcutta announced a prize for the best essay on the origin and growth of the Bengali language. 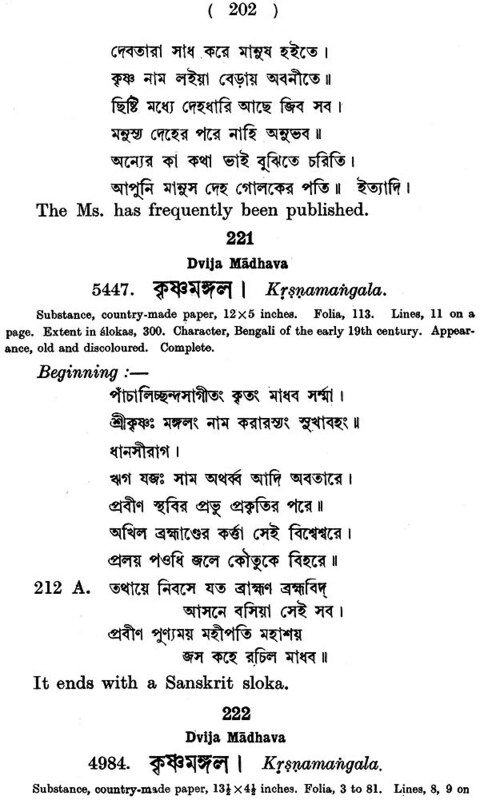 While engaged in writing an essay for this competition, I happened by chance to come across an ancient manuscript of the poem – ‘Mrga-lubdha' by the Poet Rati Deva of Chakras'ala in Chittagong, and on further enquiries I learned from reliable sources that many such ancient books, mostly ill-preserved, were to be found throughout the villages of Eastern Bengal, buried away in the houses of the rustics. As I found it impossible to collect these valuable works unaided, I applied to Dr. Hoernle for advice in the matter. He instructed Mahamahopadhyaya Haraprasad Sastri to render me all possible assistance from the Asiatic Society of Bengal in my search for manuscripts. 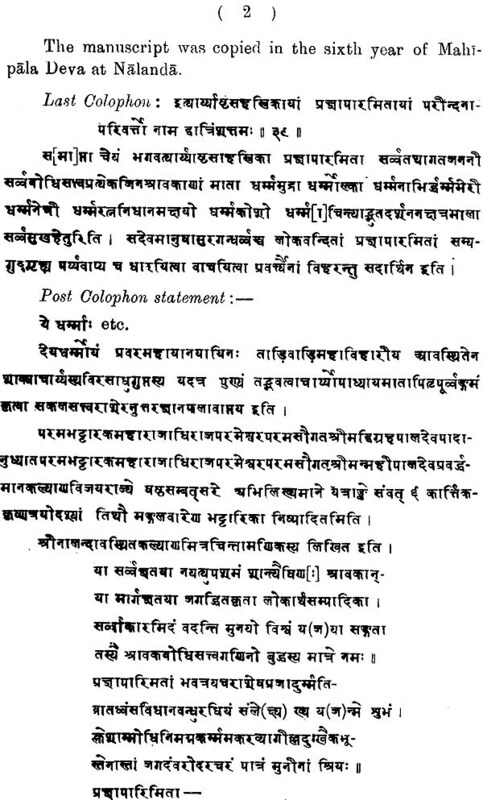 Accordingly Pandit Binod Bihari Kavyatirtha of that Society was appointed' to assist me, and he came to Tippera for this purpose in 1893. By the year 1894 I was in possession of quite an unexpected treasure of old MSS. 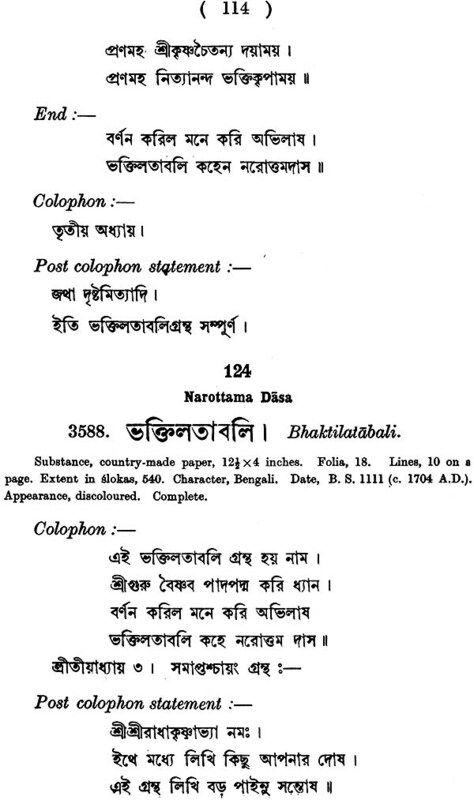 collected from various parts of Bengal, mostly from Eastern Bengal. The existence of these was absolutely unknown to the educated people of the present generation. Gradually an increasing number of MSS. was discovered, and after the publication of my History. of Bengali Language and Literature' in Bengali in the year 1896, a lively interest was taken by the educated community in the subject, and vigorous 'measures were adopted to recover the precious works. It became clear to all that unless the contents of these ill-preserved MSS. could be saved by means of printing them, the bulk of such valuable materials must be ultimately lost. 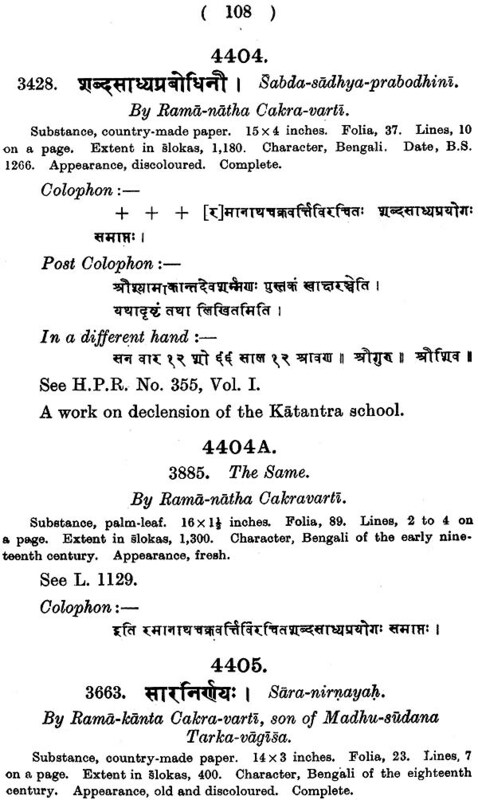 Mahamahopadhyaya Haraprasad Sastri collected on behalf of the Asiatic Society nearly 800 of them, and an equal number is now in possession of the Sahitya Parisad of Calcutta." 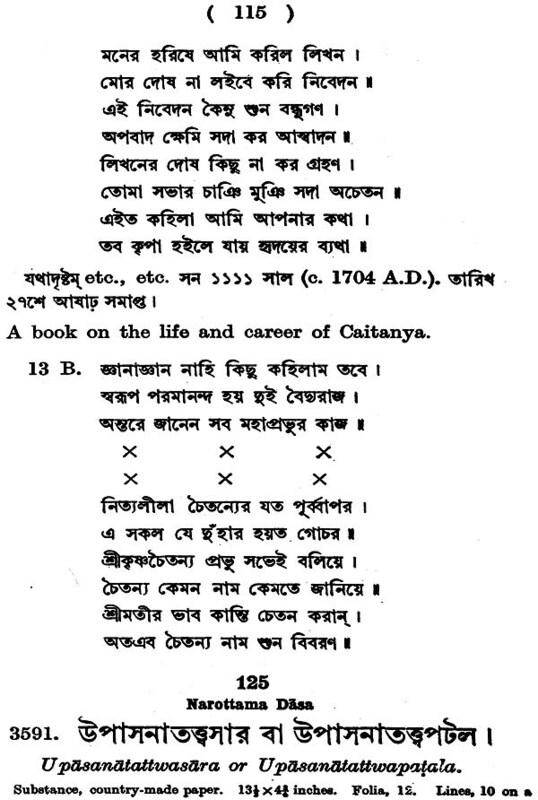 (Banga Sahitya Parichya by Rai Bahadur Dinesh Chandra Sen, Calcutta University, 1914, Vol. I, Introduction, Page. 5). This in short is the history of what the Asiatic Society had done for collecting Bengali MSS. 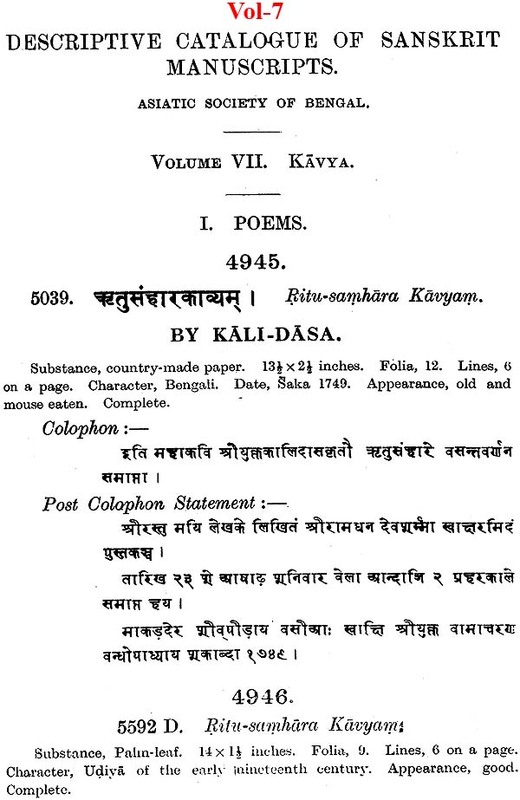 Foreword This important and interesting catalogue of Bengali, Hindi, Udiya, Kashmere, Magi and Marathi Manuscripts was the result of the collaborative effort of Haraprasad Shastri, Dinesh Chandra Sen and Jogendranath Gupta. The total number of manuscripts catalogued and described in this work is 445. 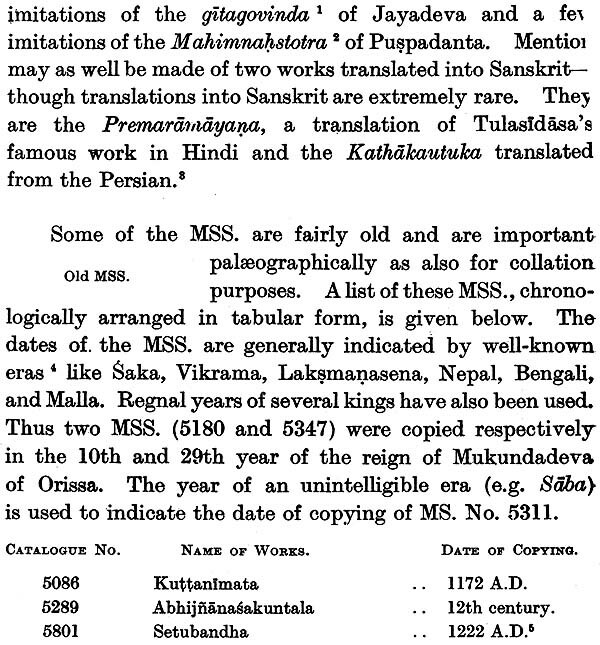 The manuscripts were prepared mostly in the late mediaeval times when Vaisnavism, both orthodox and heterodox, were popular in Bengal and Orissa, This highly interesting catalogue of manuscripts reflects this historical fact. 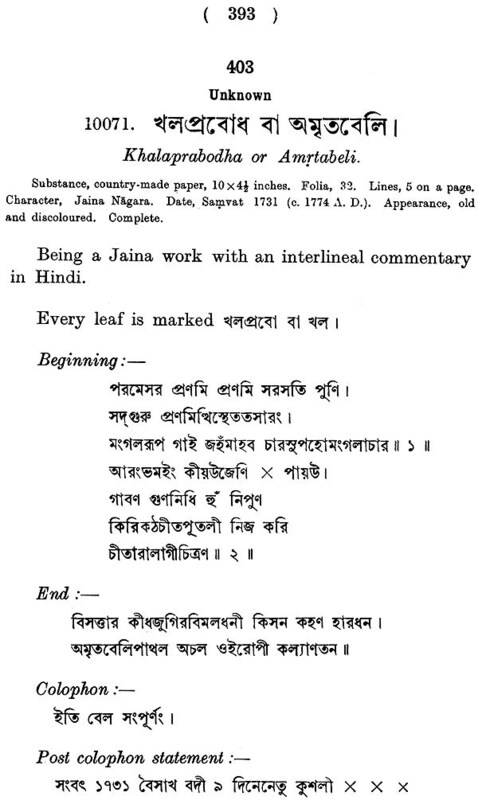 Of special value are the manuscripts composed in non-Bengali languages, which came to the Royal Asiatic Society from numerous places in Orissa and upper India. 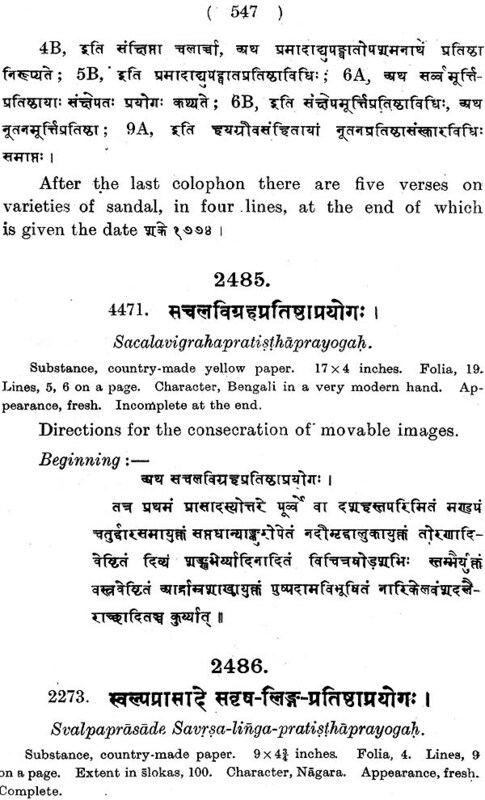 Of special importance are the Bengali Vaisnava manuscripts, which would be deemed valuable by those who are investigating Vaisnavism in Bengal and Orissa. I believe that the publication of this volume would be appreciated by the scholars. 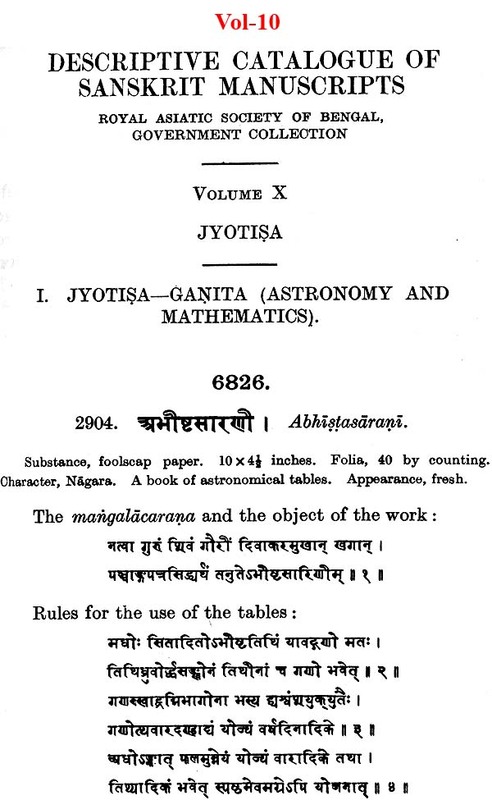 In Part I and Part II of this work five hundred and eighty- five manuscripts on Astronomy and Mathematics (Ganita), -Natural Astrology (Samhita), Horoscopy and Divination Hora), and Palmistry and Physiognomical Peculiarities rave been catalogued and described with a profusion of quotations from the texts. The entire collection constitutes in impressive lore of Astrology which must be differentiated from modern Astronomy. Since divination is basically mysterious, the authors of these manuscripts have tried to lend to the whole subject some authority by occasional mathematical infusions and theorisings about the positions of the stars and planets. In Part I, we find the descriptive catalogue of such important manuscripts as tlryabhaNasiddha.nta (No. 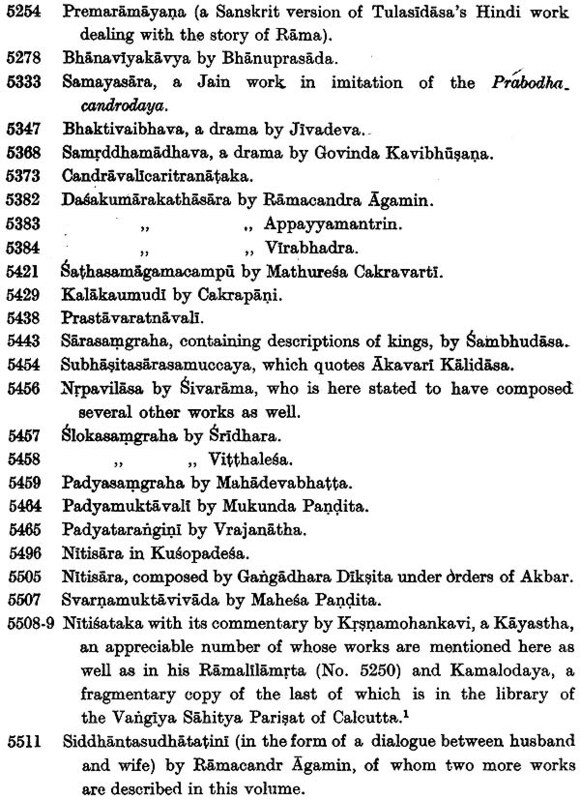 6830), Kautukalilavati by Rama [No. 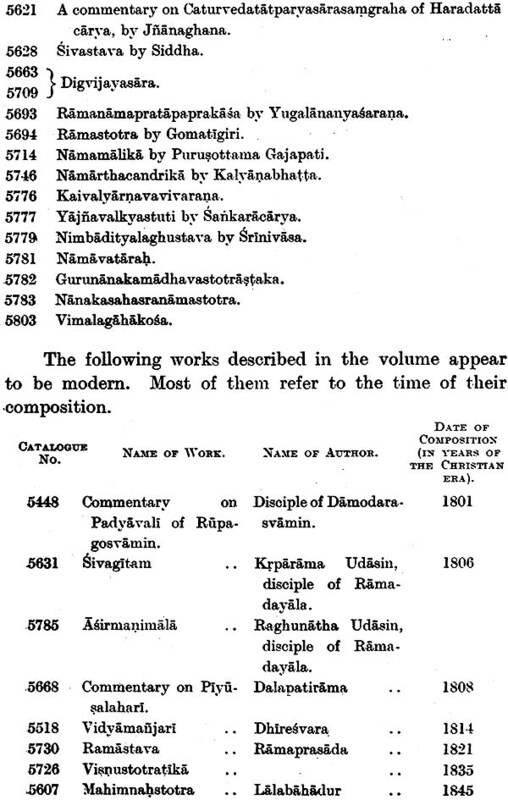 6833), Karanakutuhalam by Bhaskara which is a work on planetary motions composed in 1163), and Ganitamrtam of Gangadhara (No. 6843). 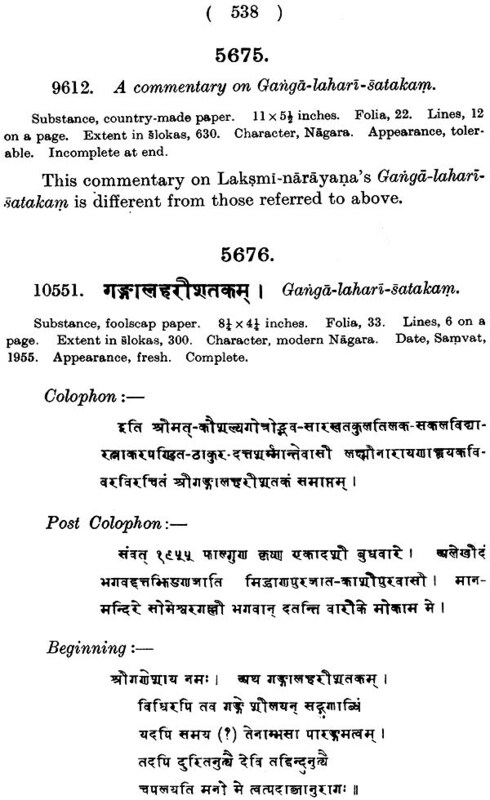 There are in this catalogue a number of manuscripts on Goladhyaya. 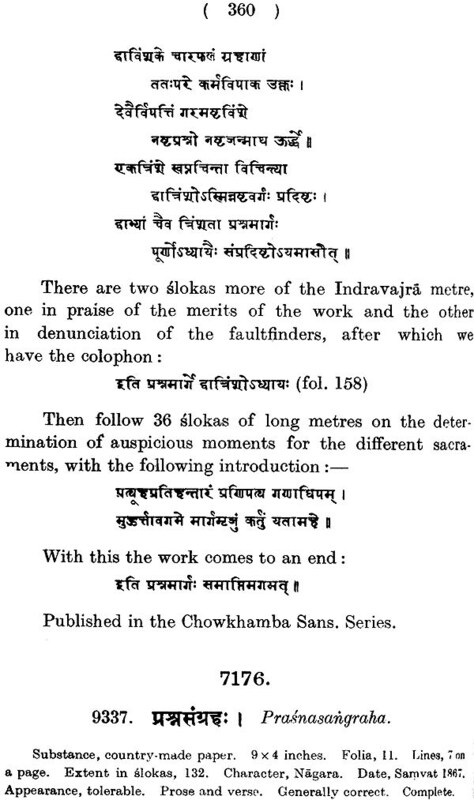 The entire work is characterized by the poetic method of presentation of an obscure thesis in beautiful Sanskrit. There are certain indications in these two volumes of the use of Chinese astrology, which possibly came to India via Tibet and Nepal, The contributions of the Deccanese astrologers to he astrological lore mentioned above are quite remarkable. [he lore is also deeply influenced by Yoga and Tantra. it is hoped that the two parts of this volume would be of some use to the scholarly astrologers, who are absolutely different from the self-advertising astrologers, attached to various jewellery shops, and to scholars engaged in studying the history of science in pre-modern India.